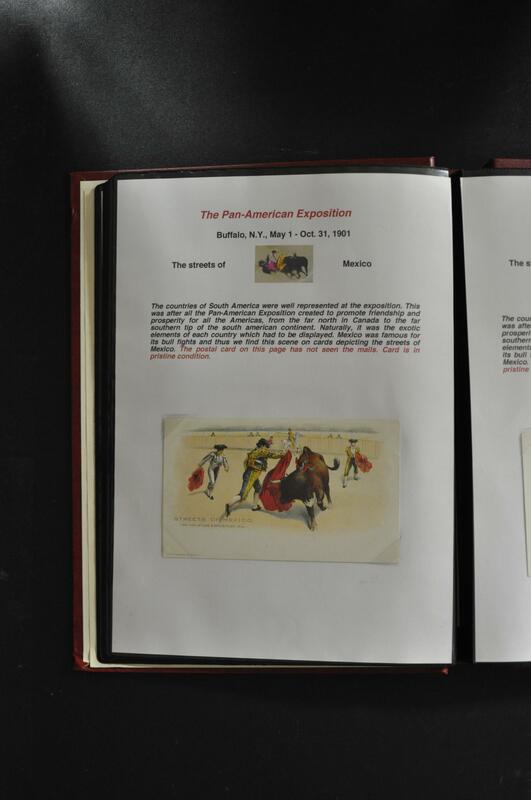 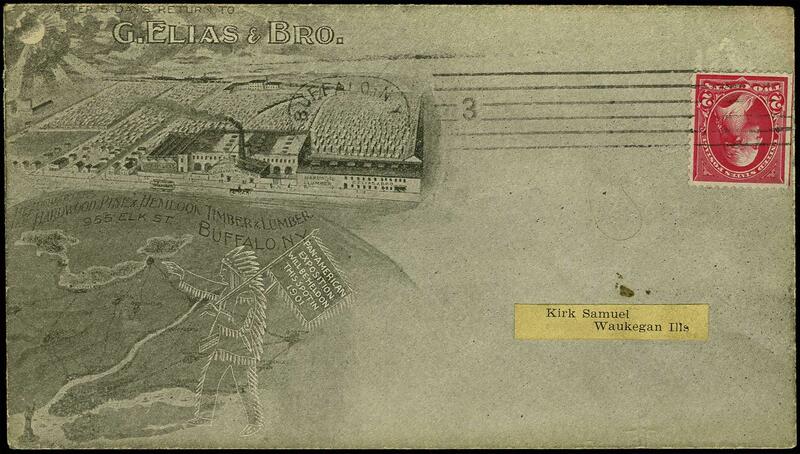 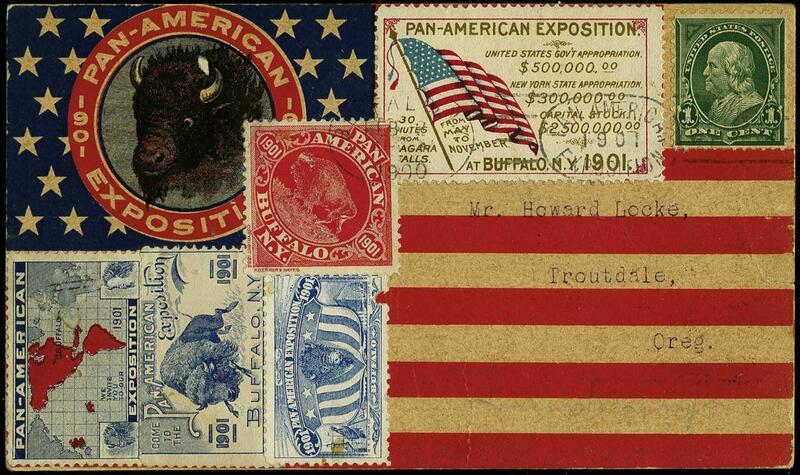 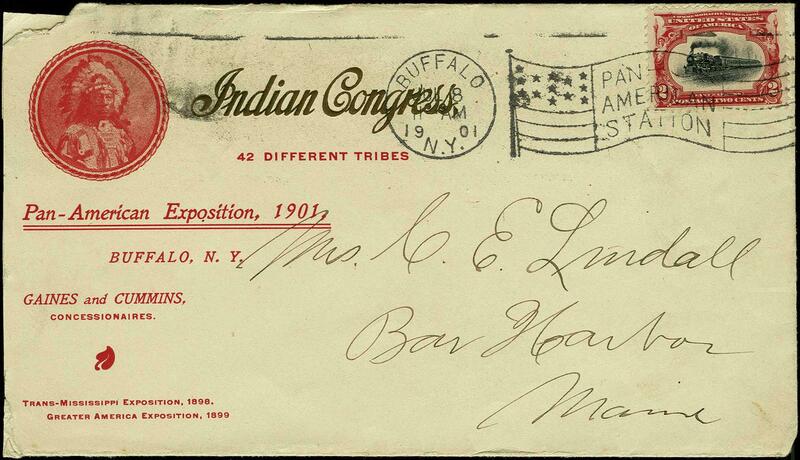 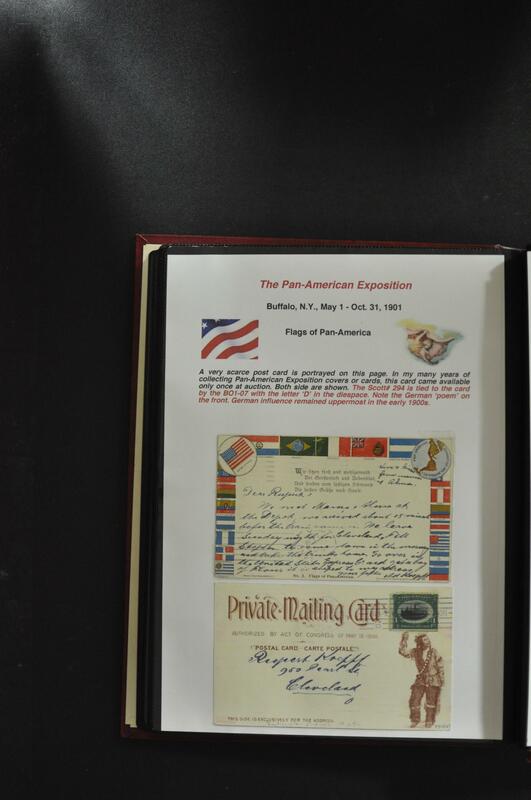 1901 2¢ Pan American "Buffalo NY Jul 18 1901 Pan American Station" American Machine flag cancel (Bomar type B01-11) ties stamp to illustrated Indian Congress (42 different Tribes) corner card addressed to Bar Harbor Maine, cover with small edge flaws at the upper left away from the stamp otherwise Very Fine. 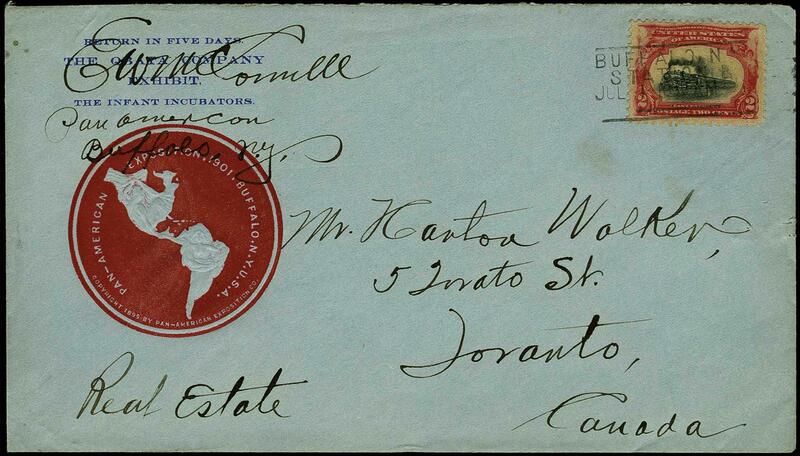 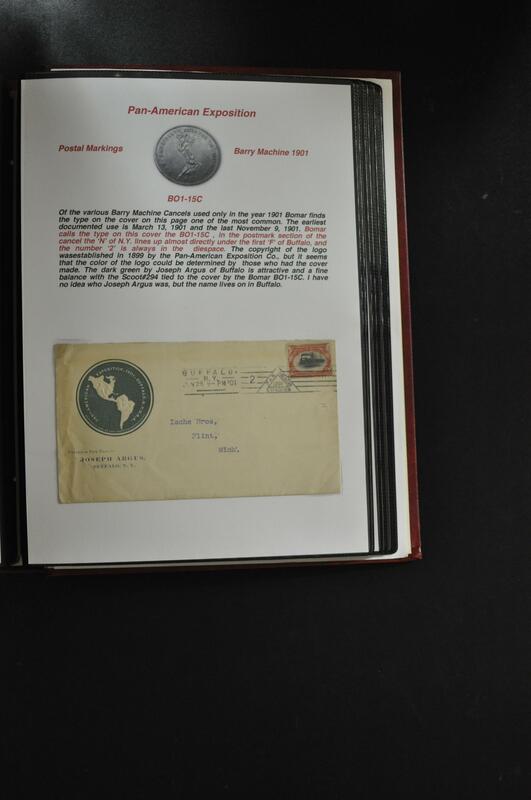 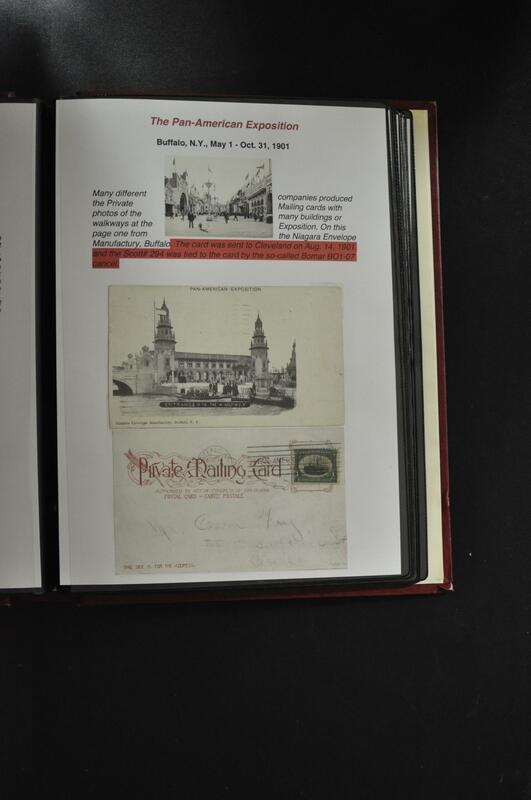 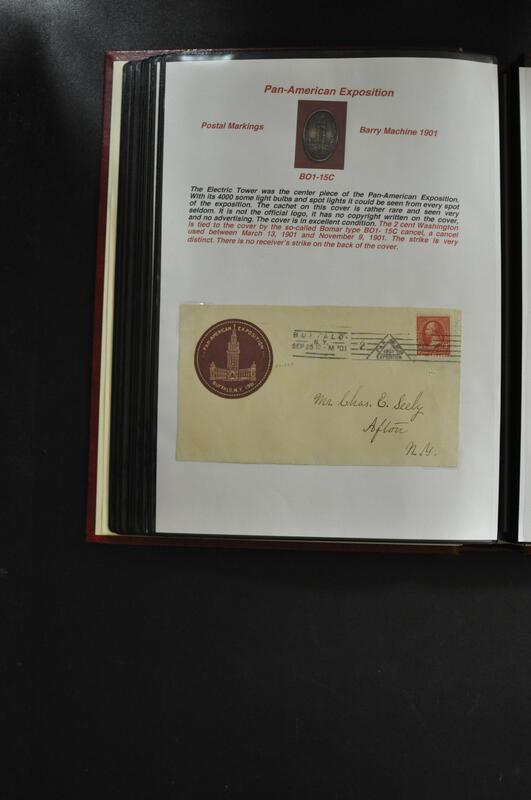 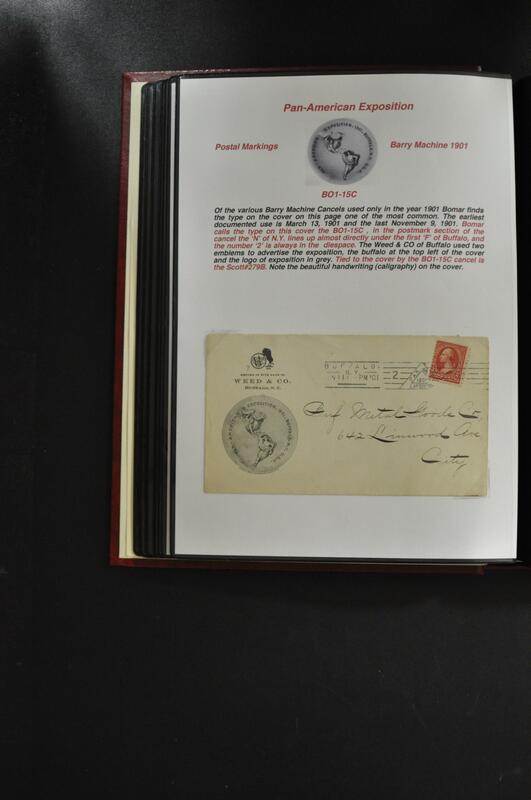 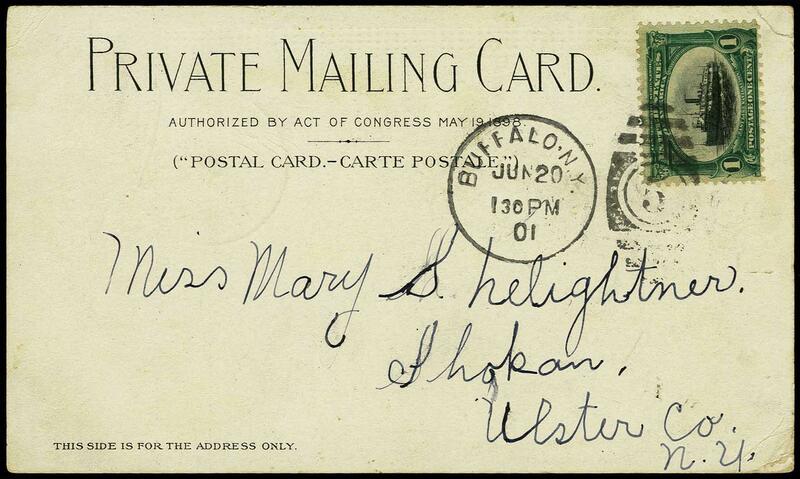 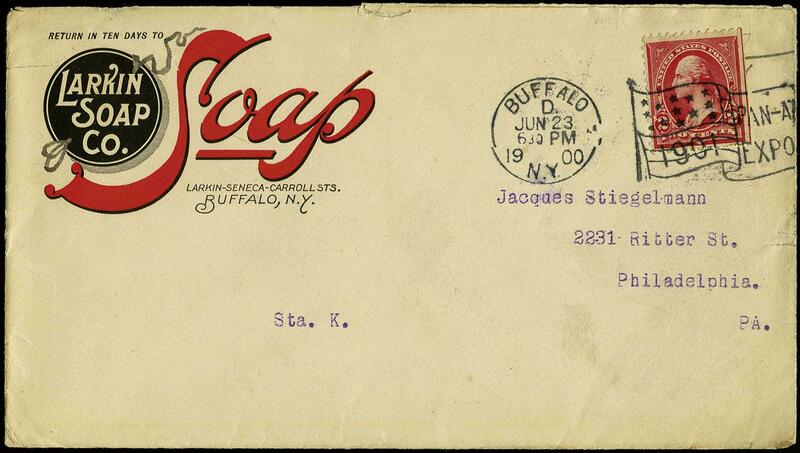 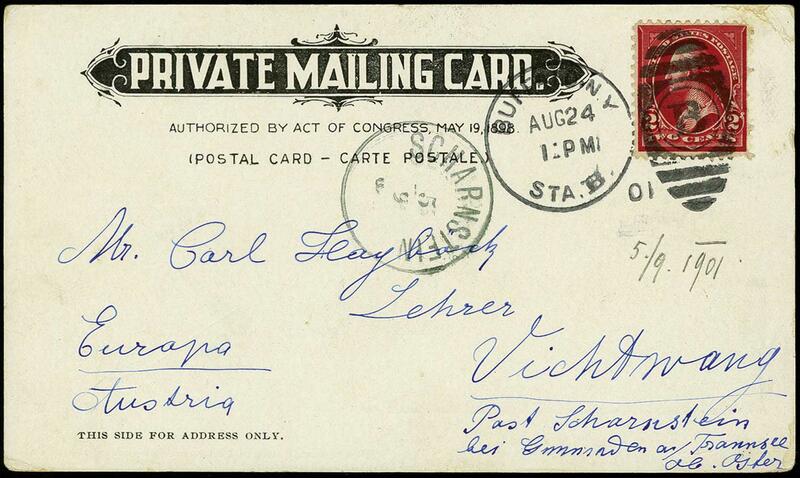 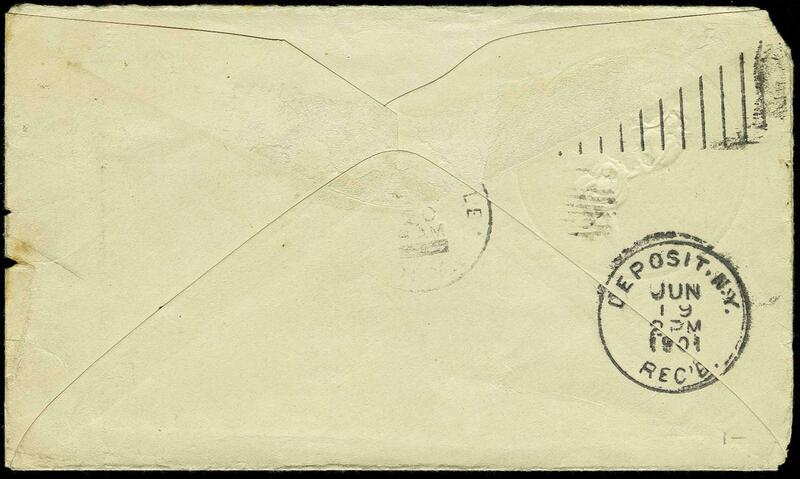 Bomar catalogue estimates that there are only 45 examples of this postmark in existence. 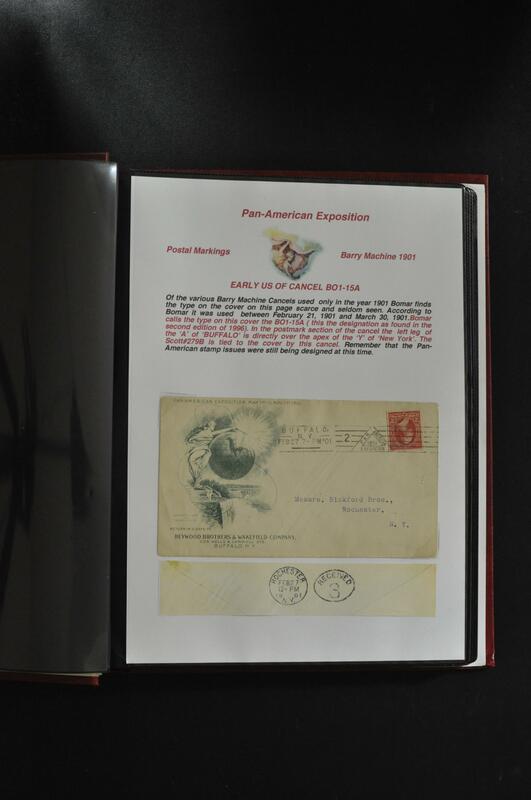 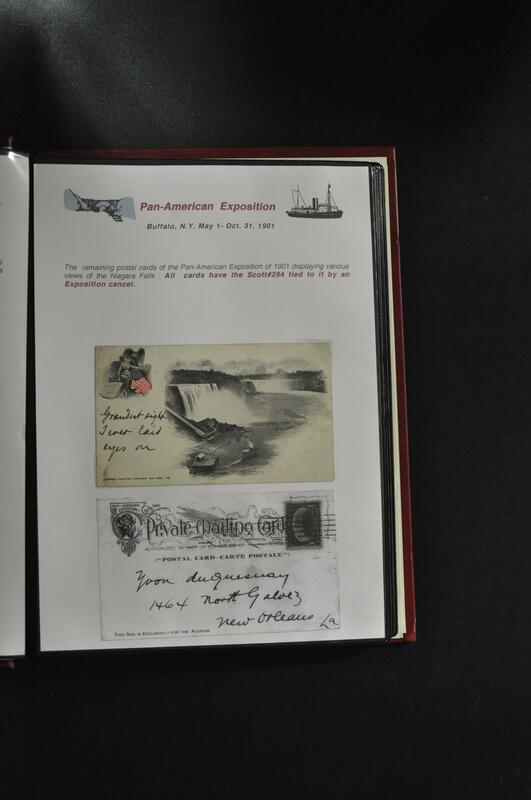 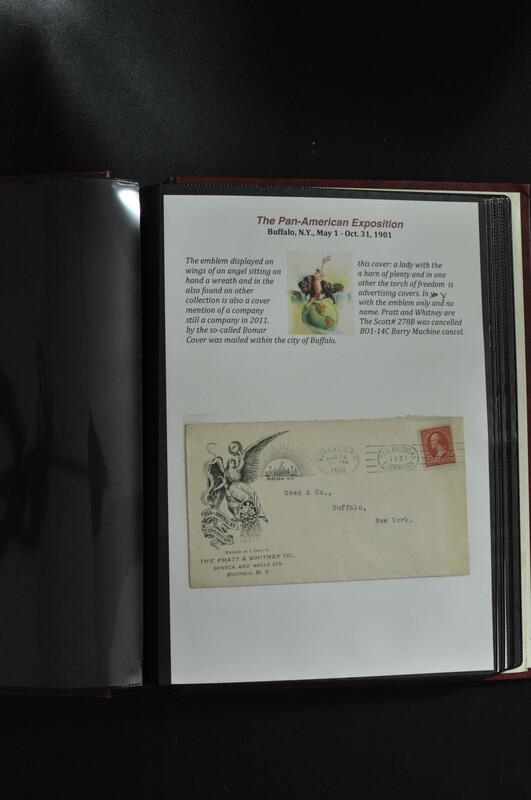 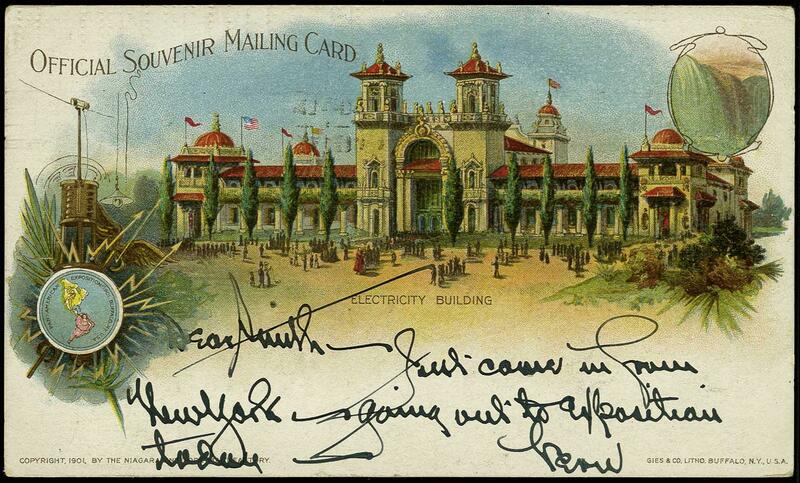 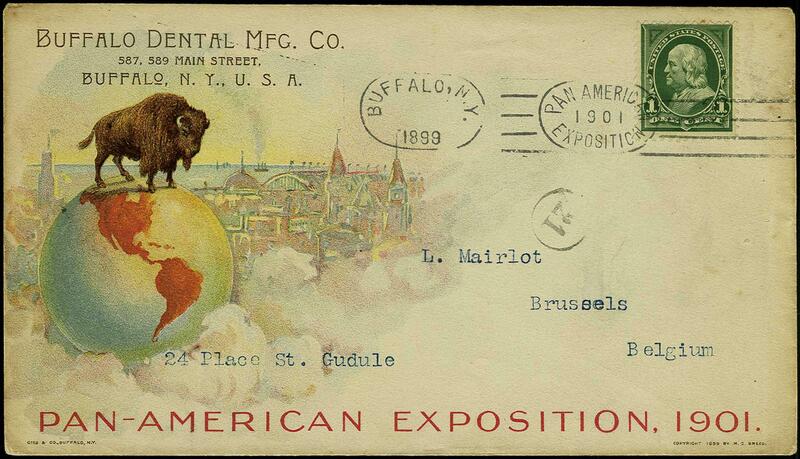 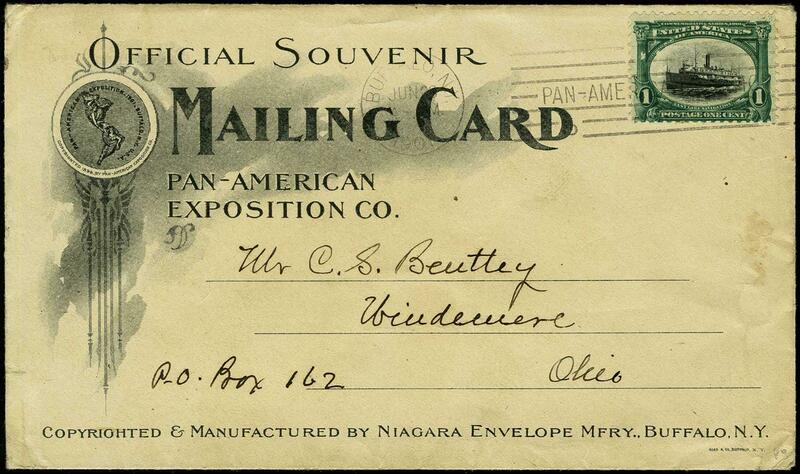 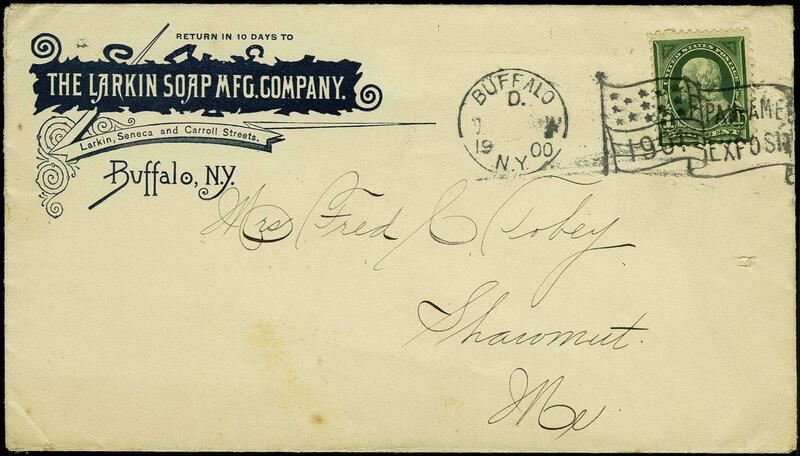 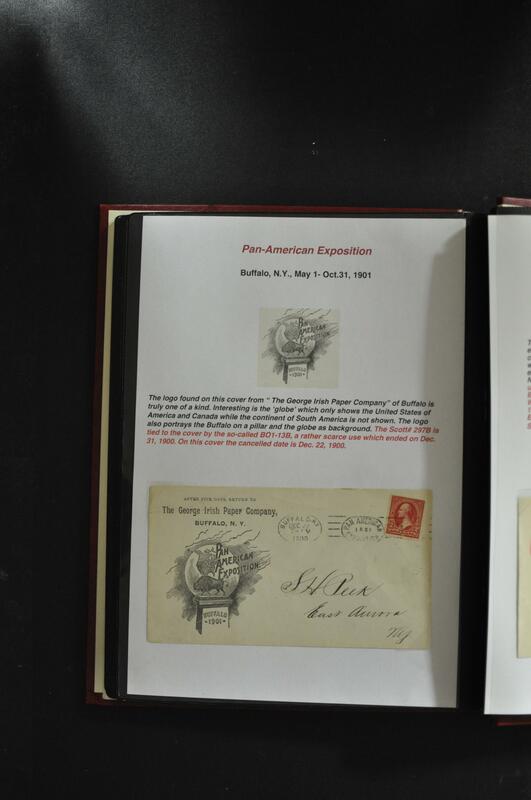 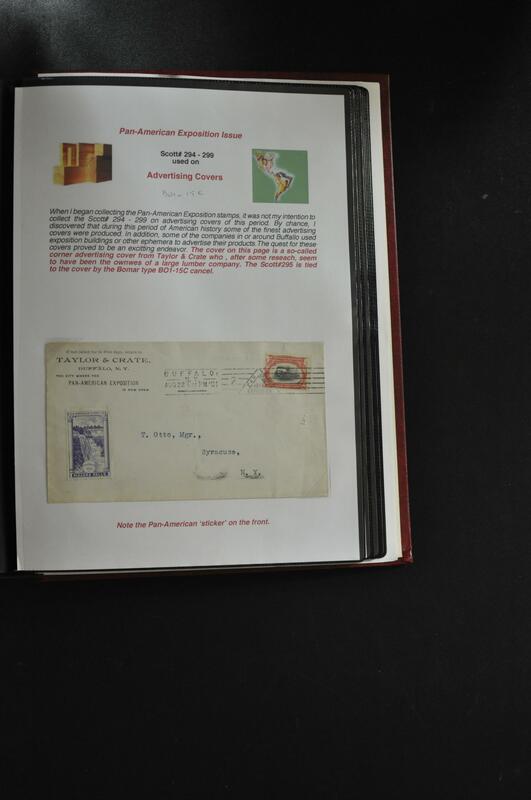 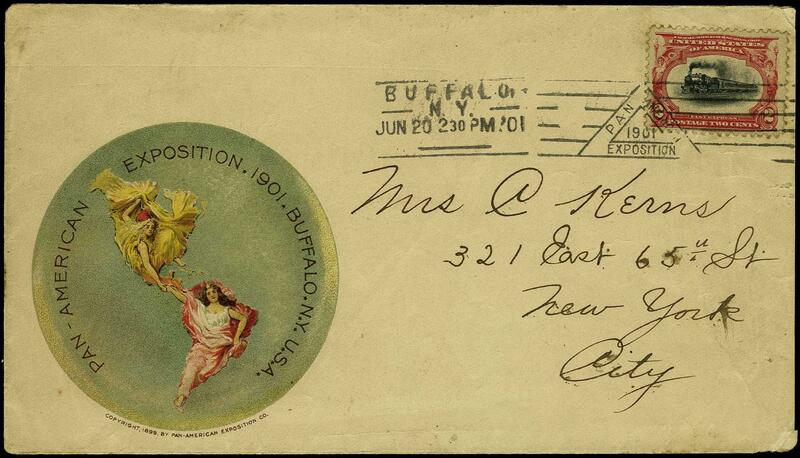 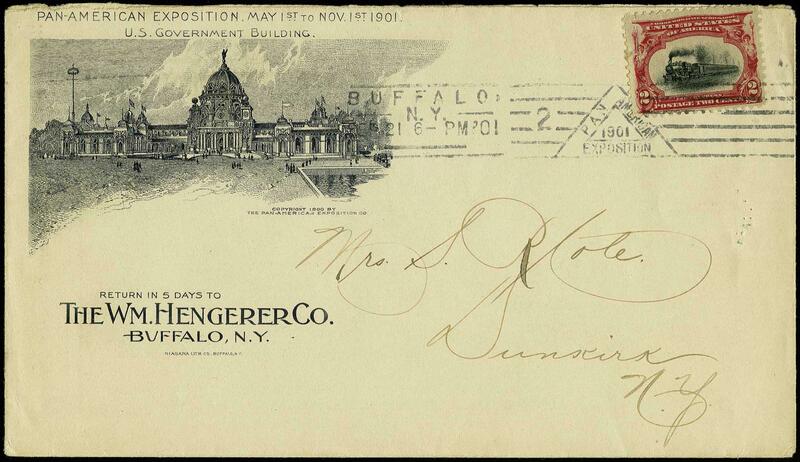 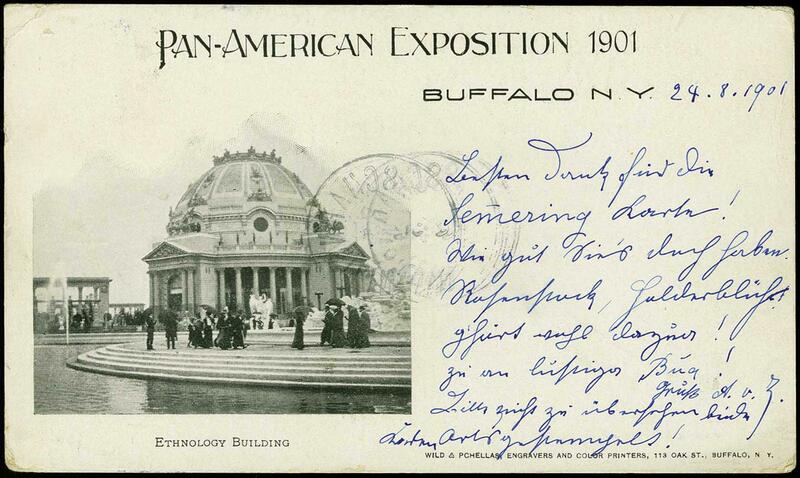 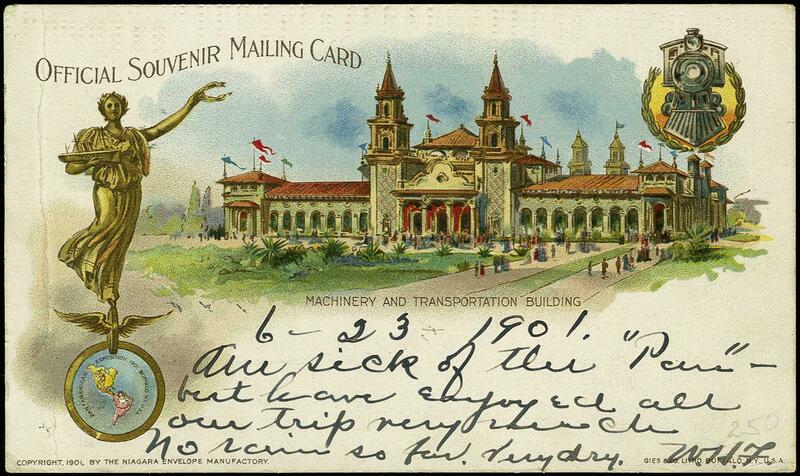 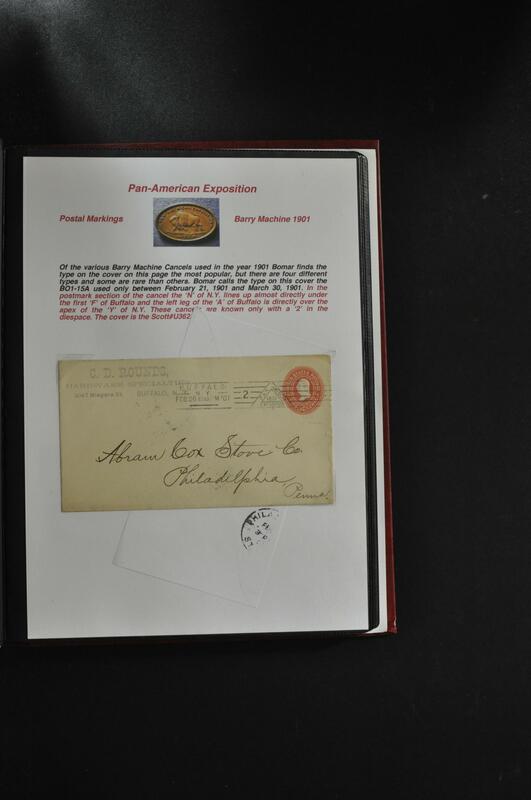 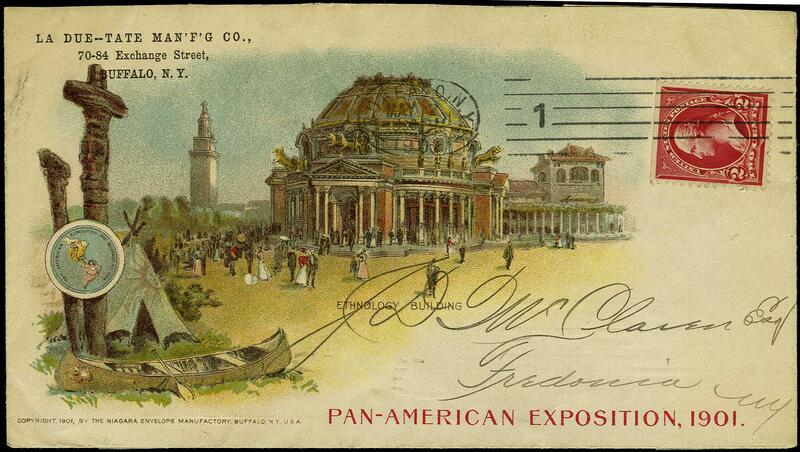 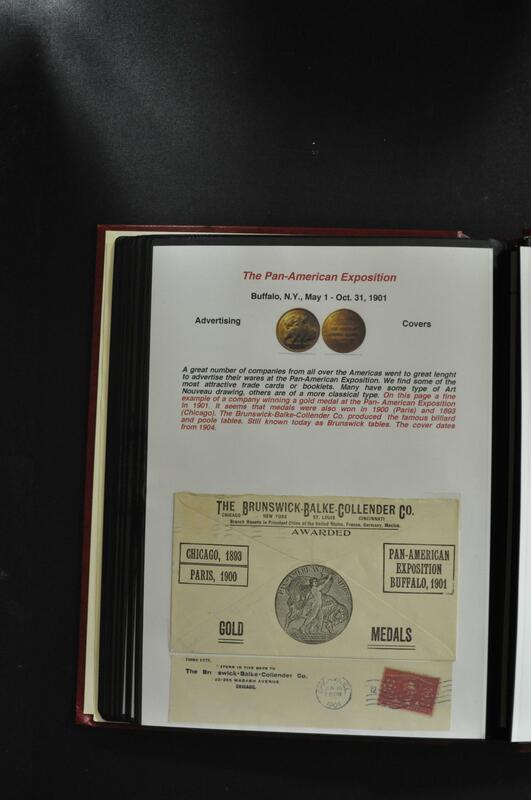 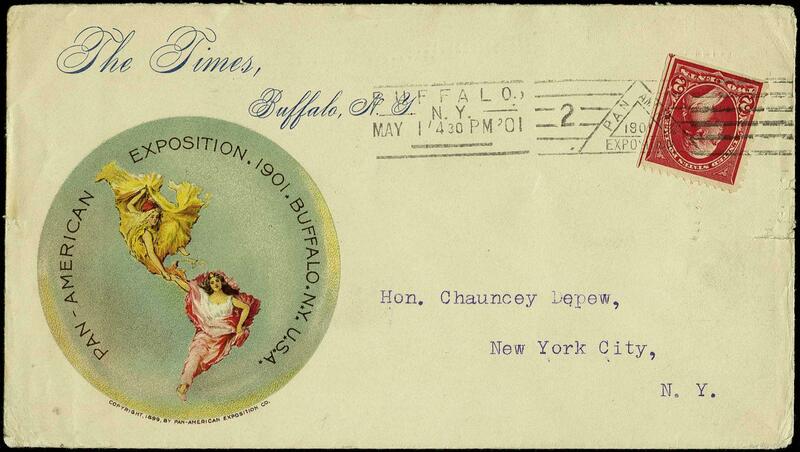 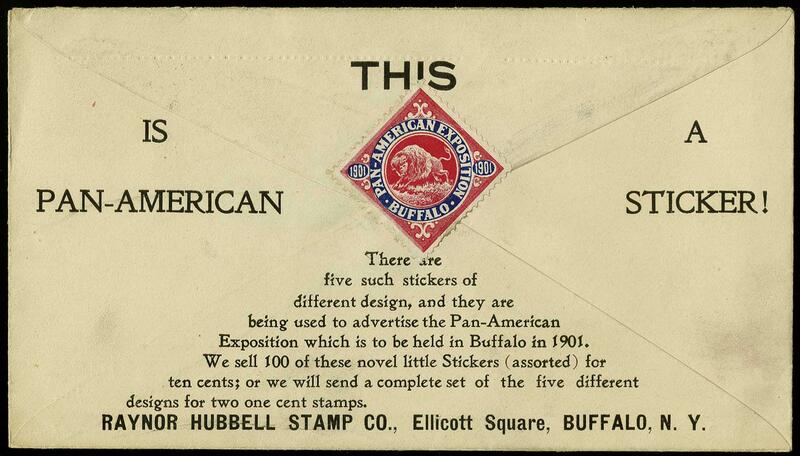 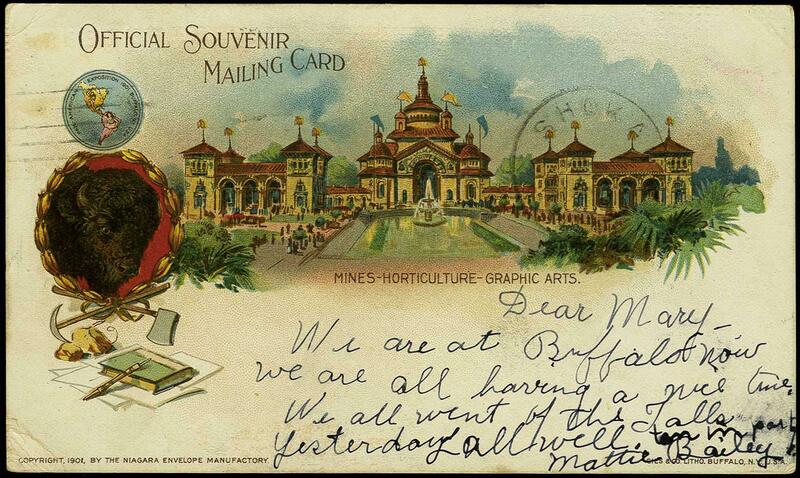 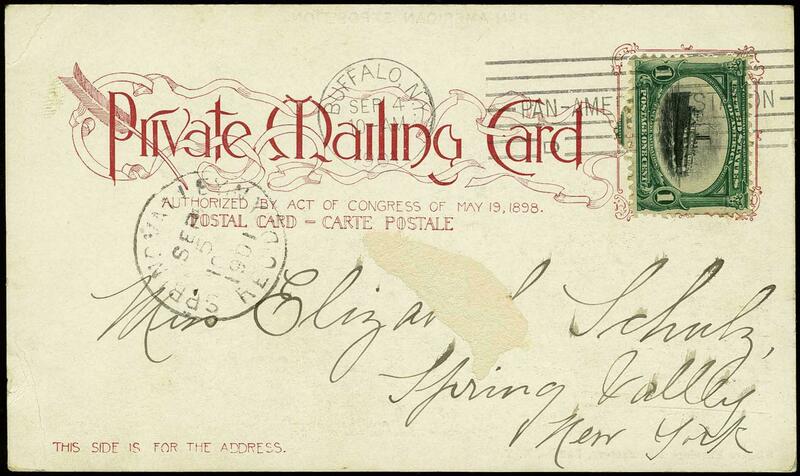 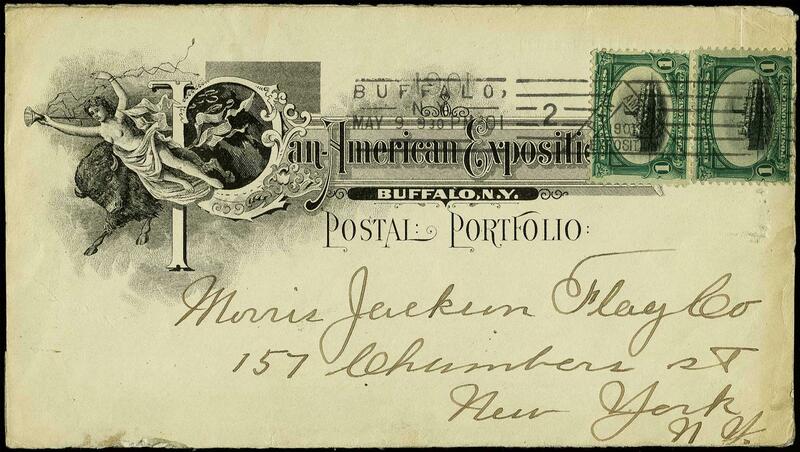 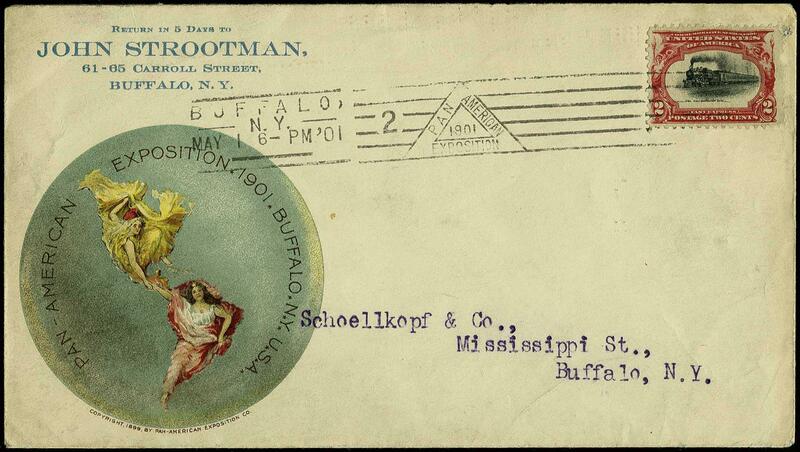 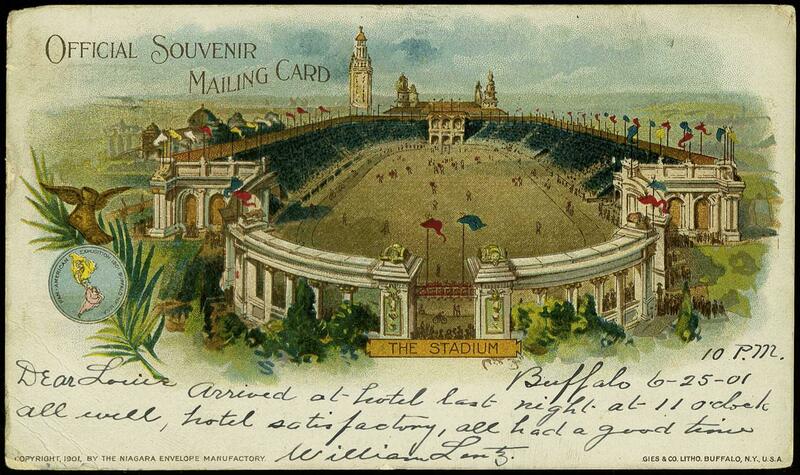 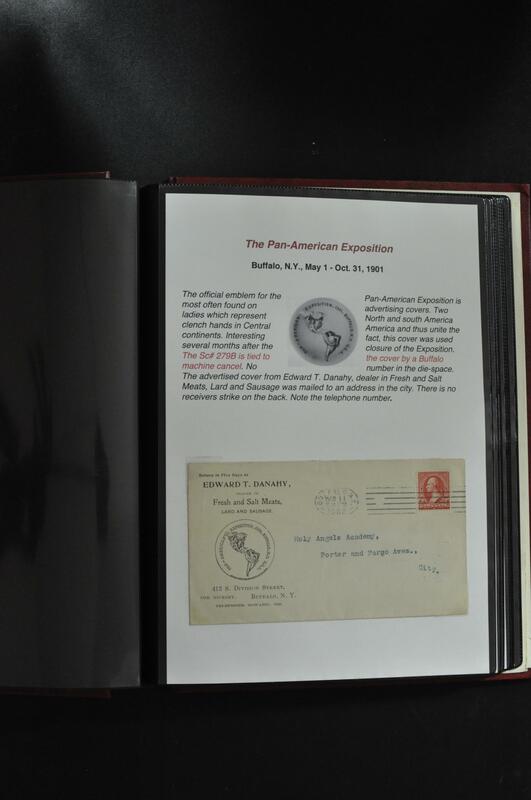 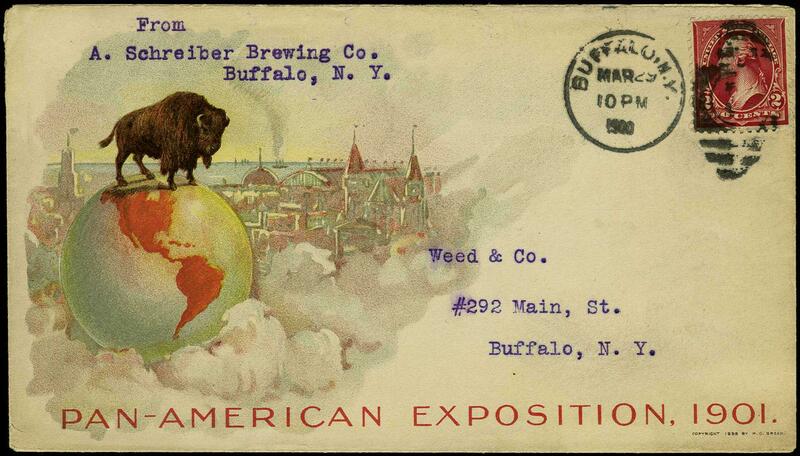 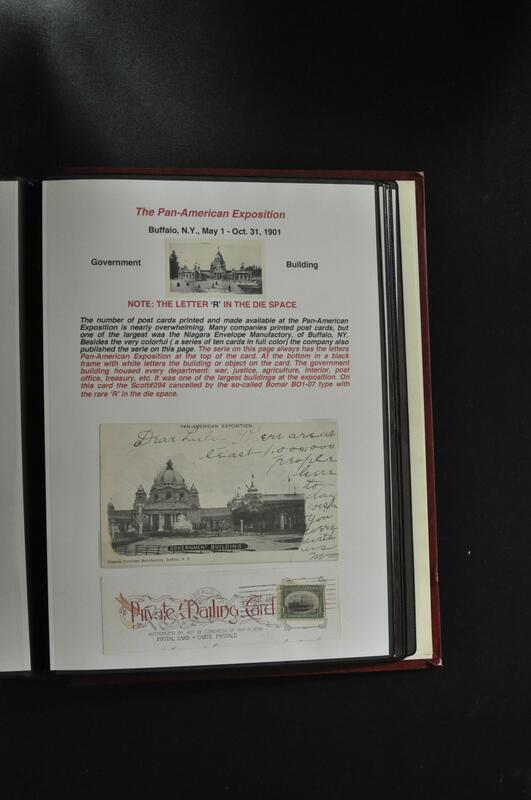 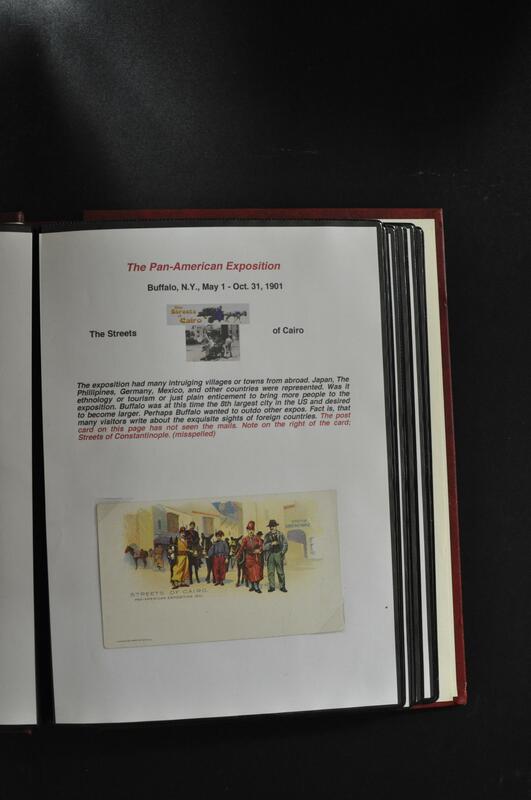 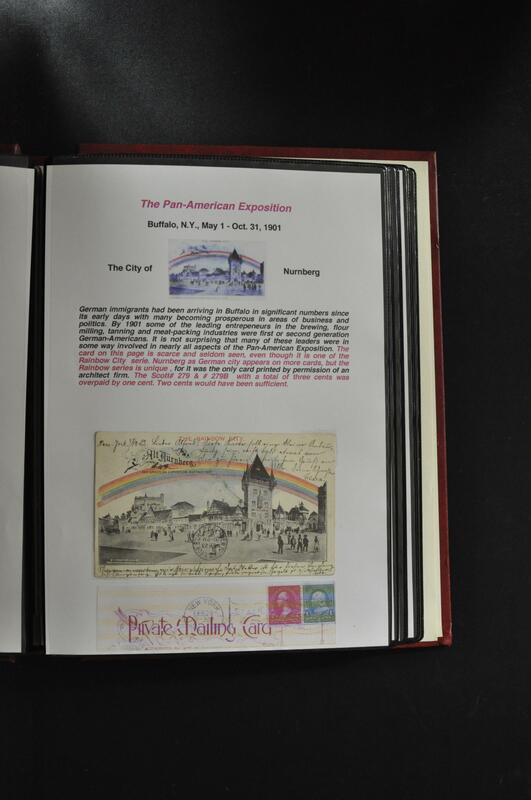 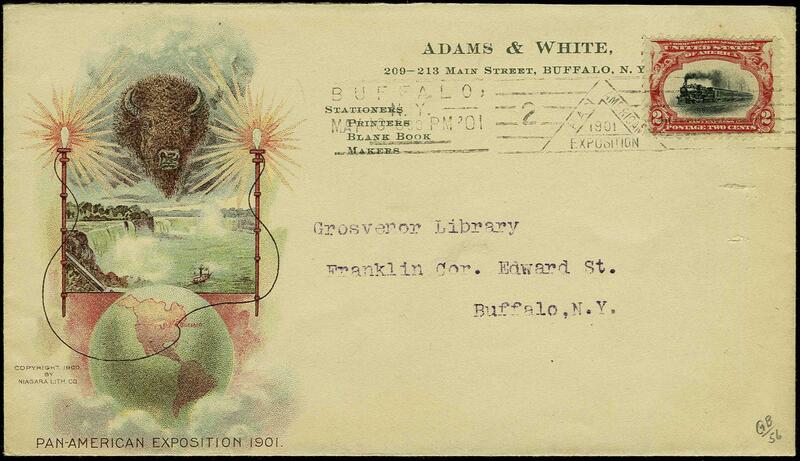 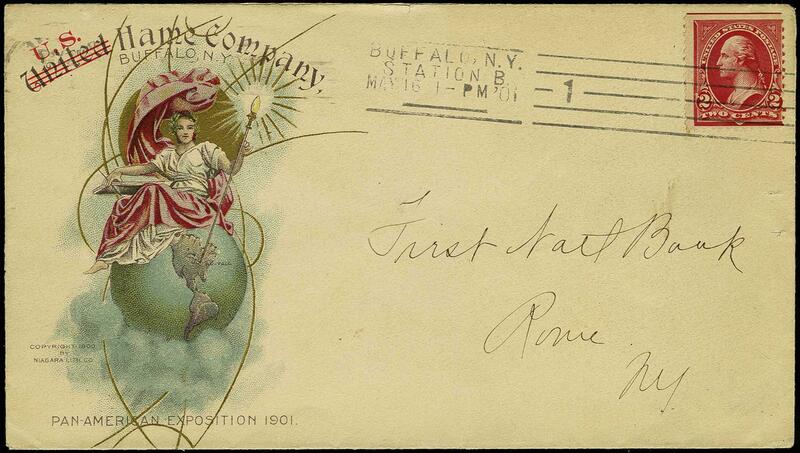 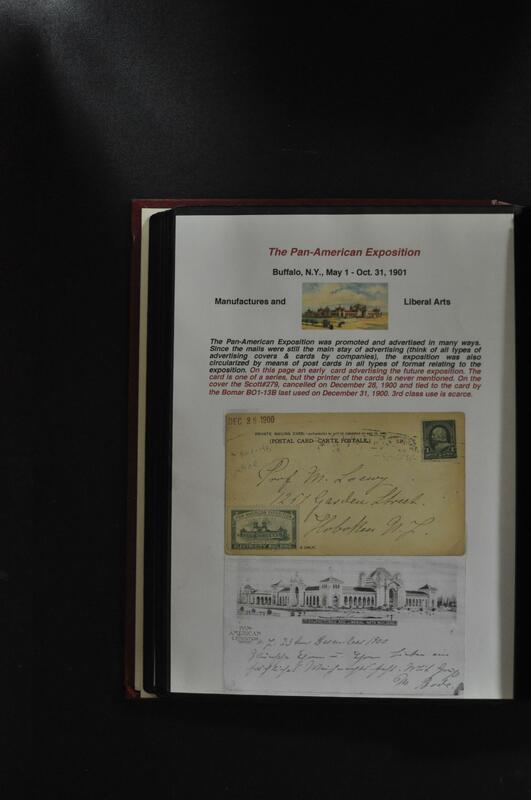 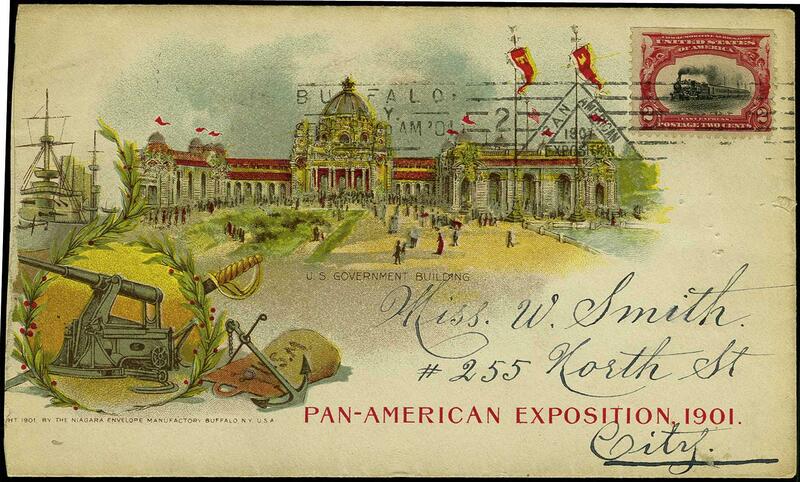 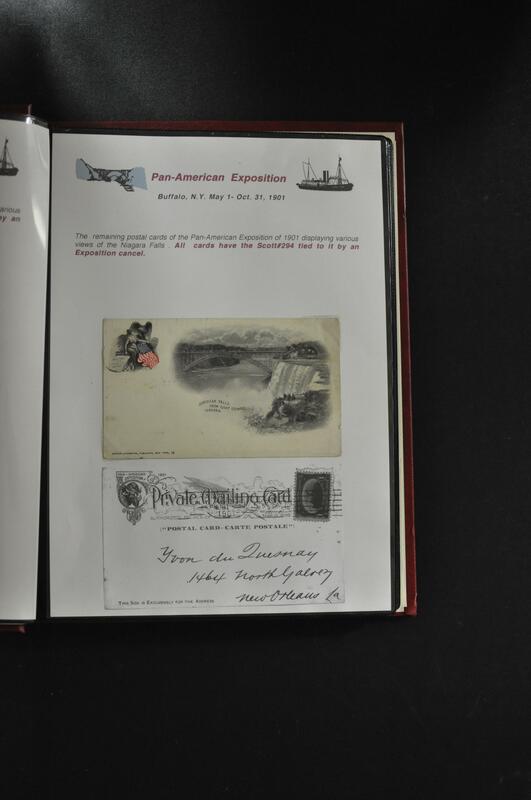 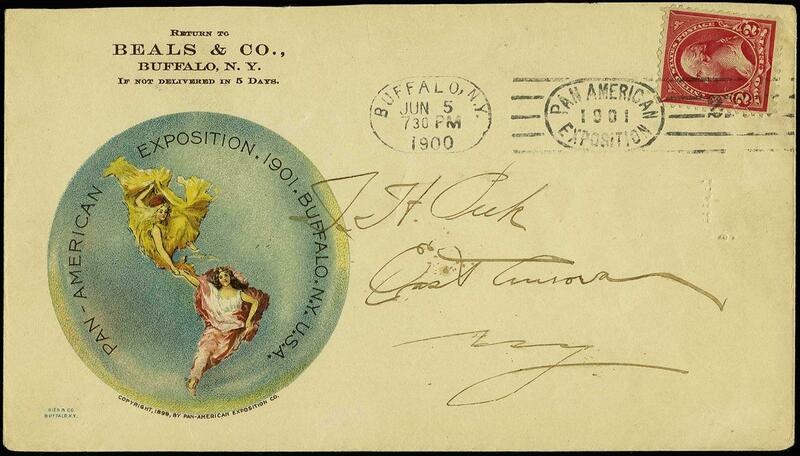 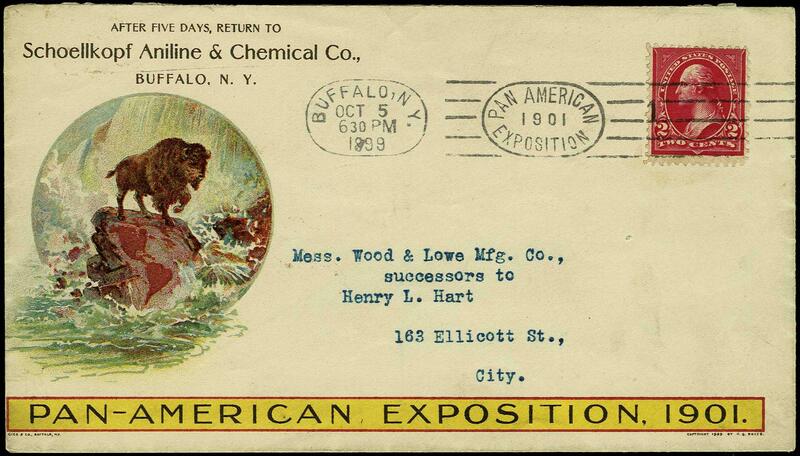 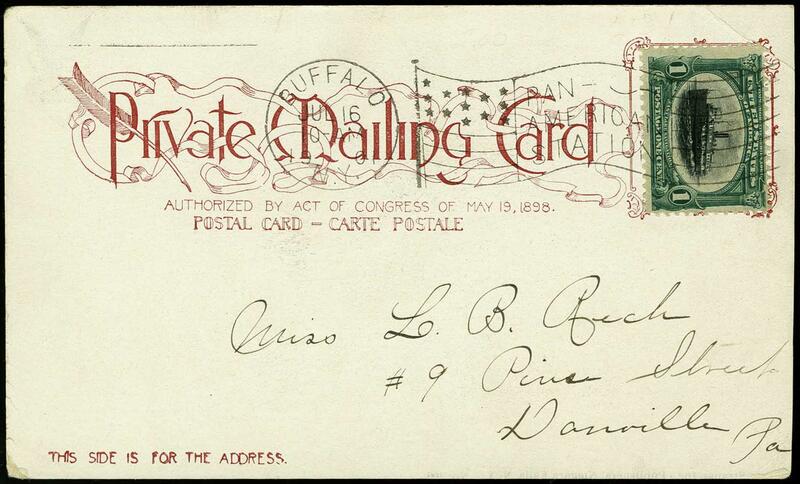 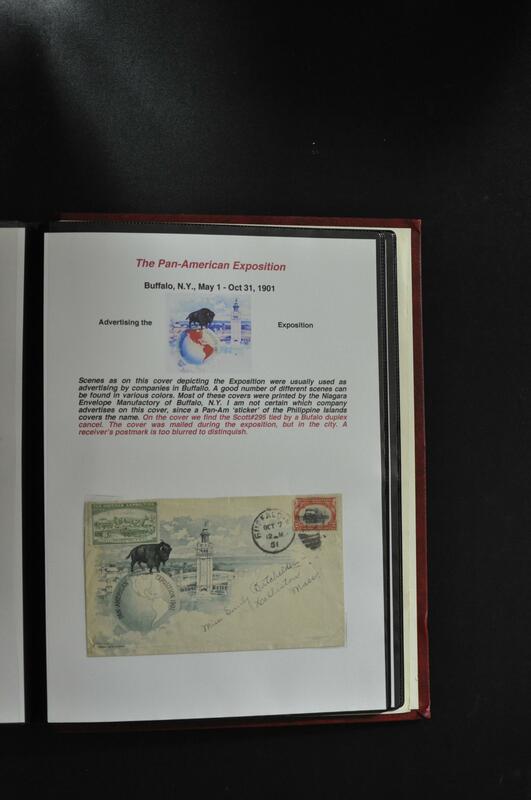 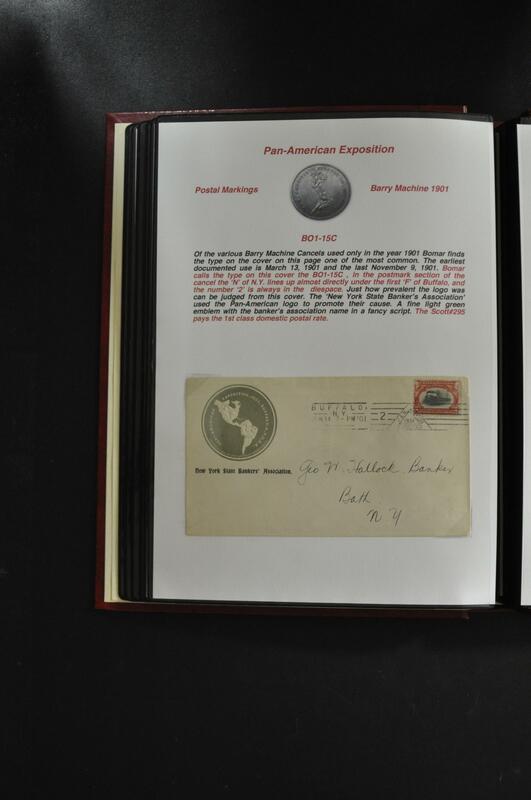 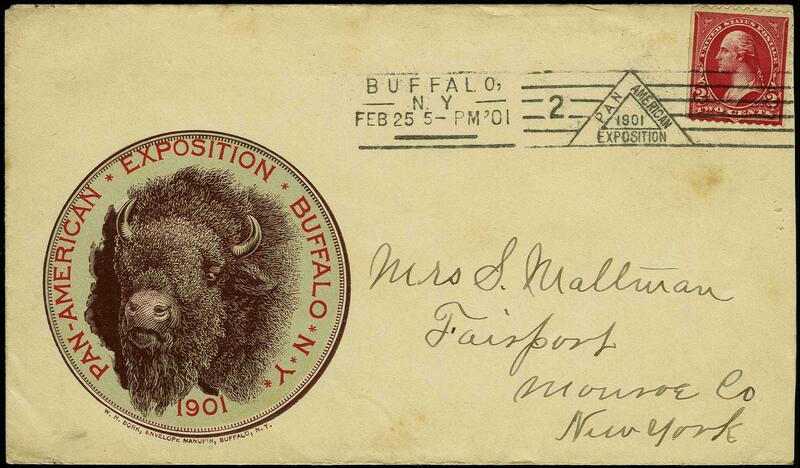 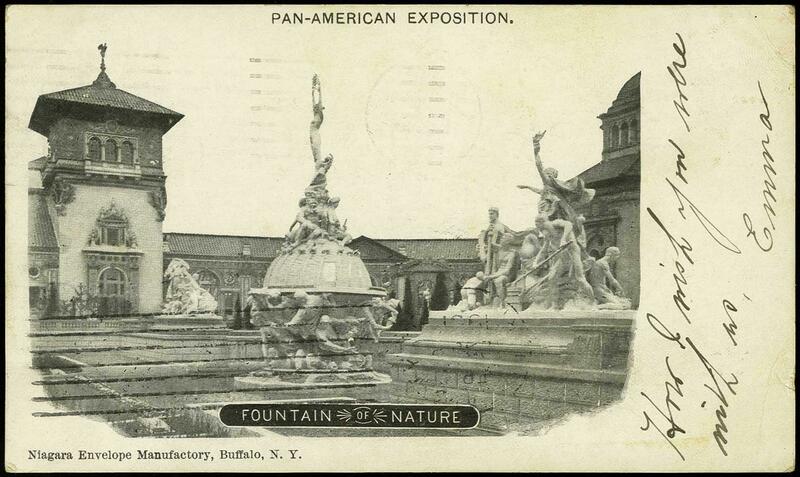 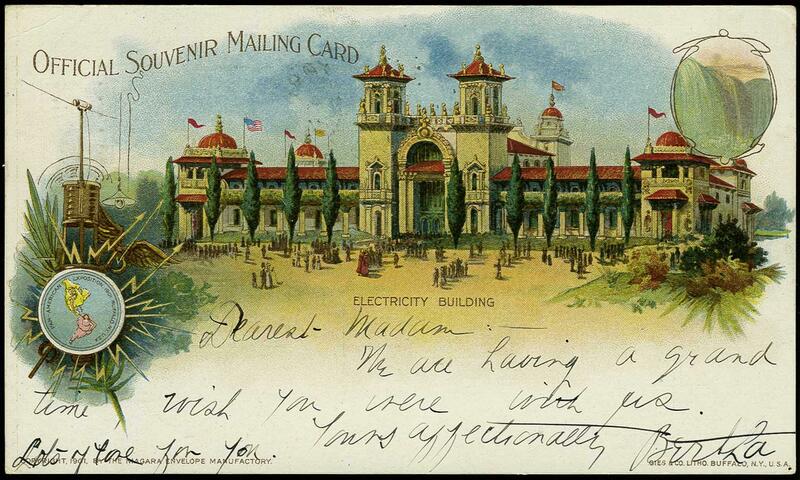 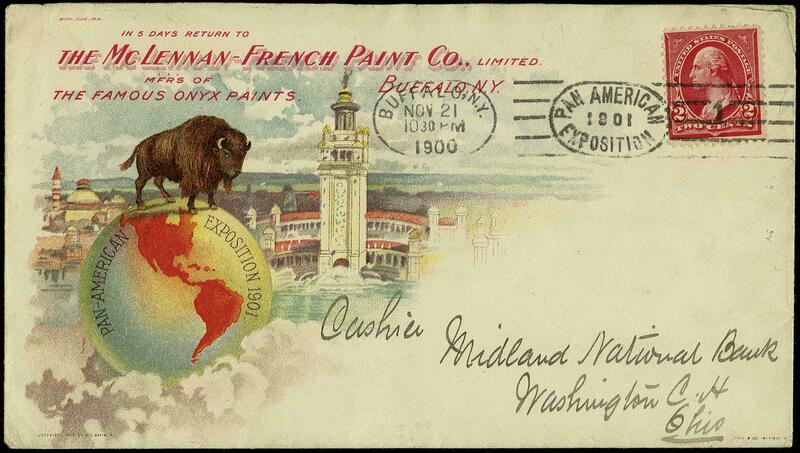 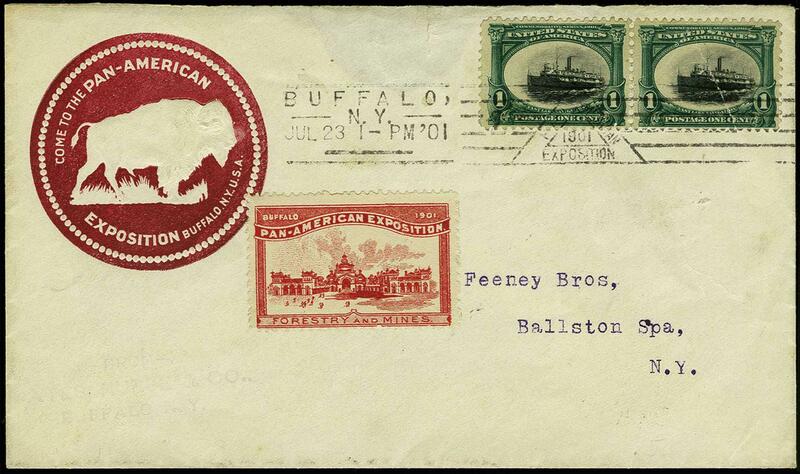 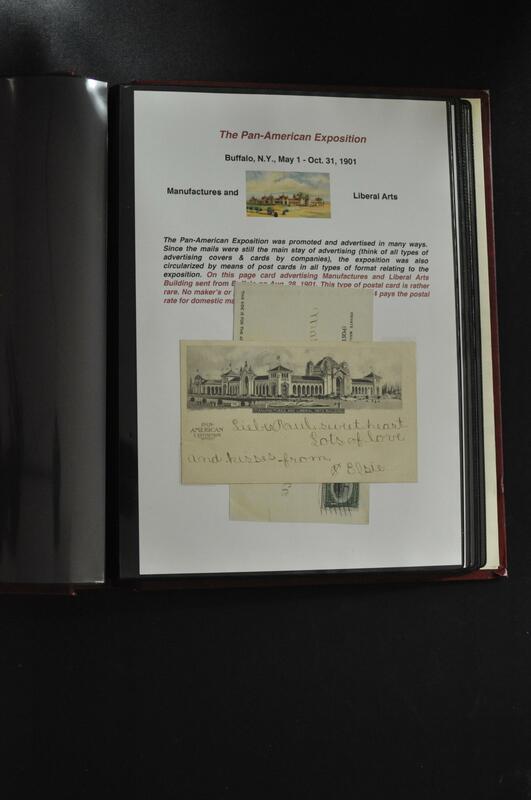 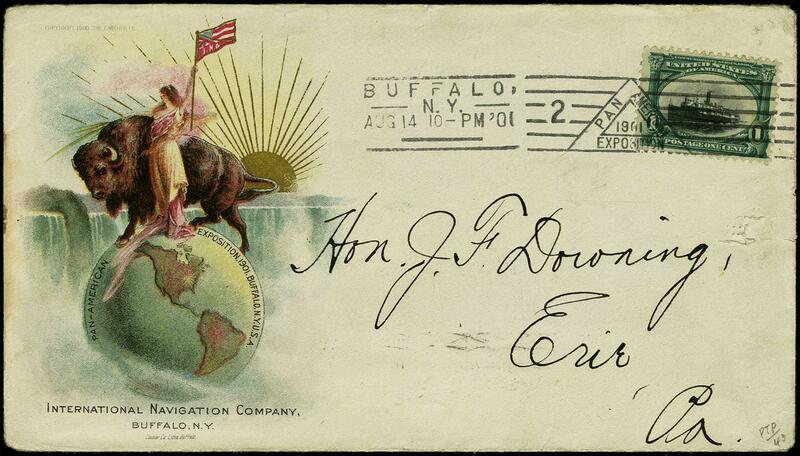 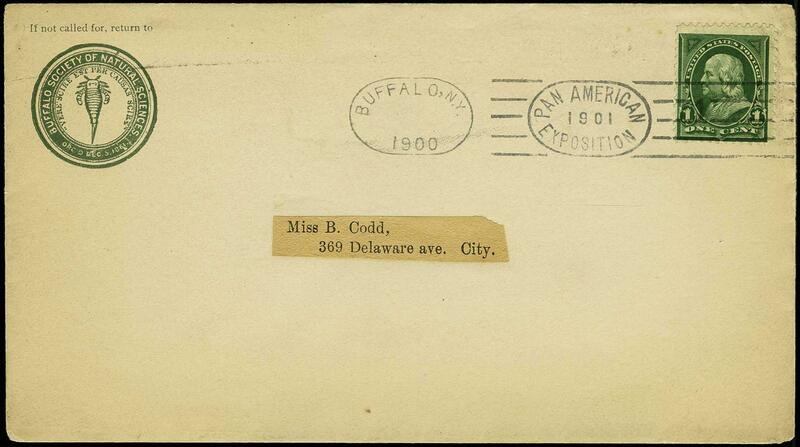 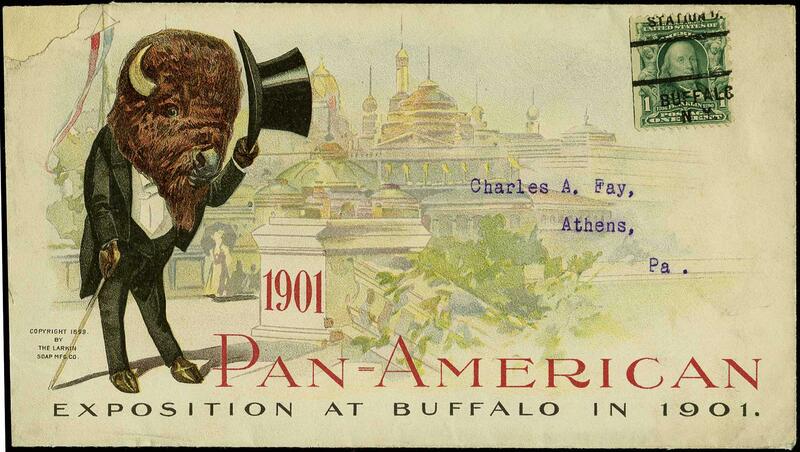 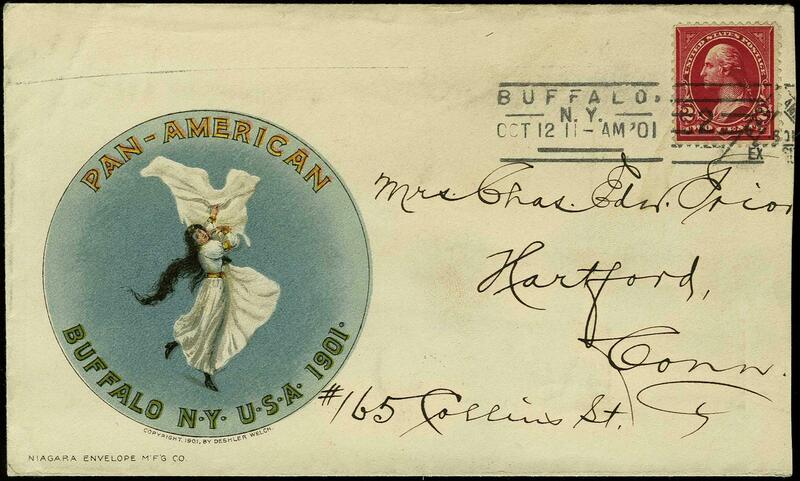 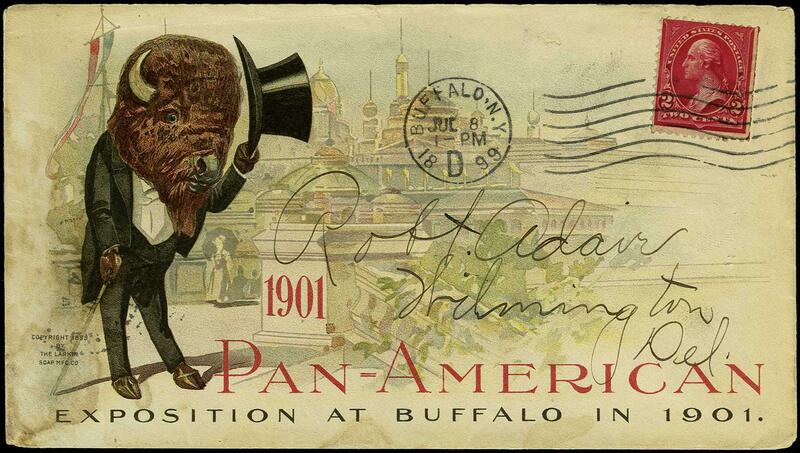 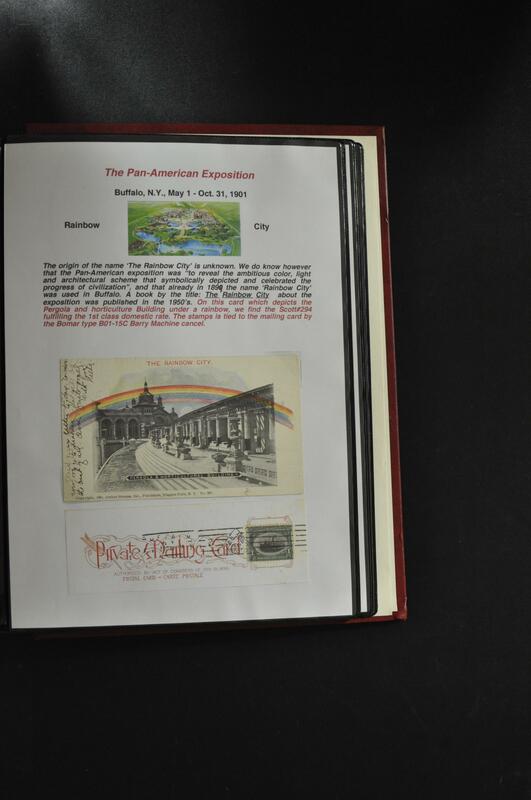 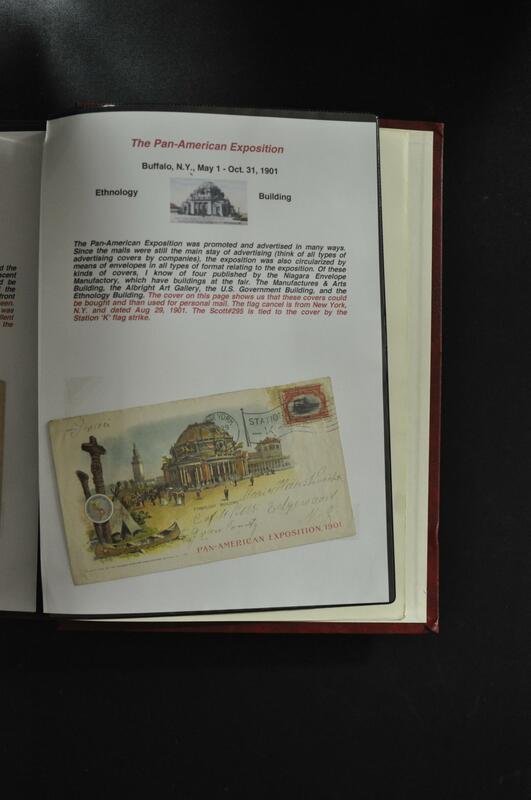 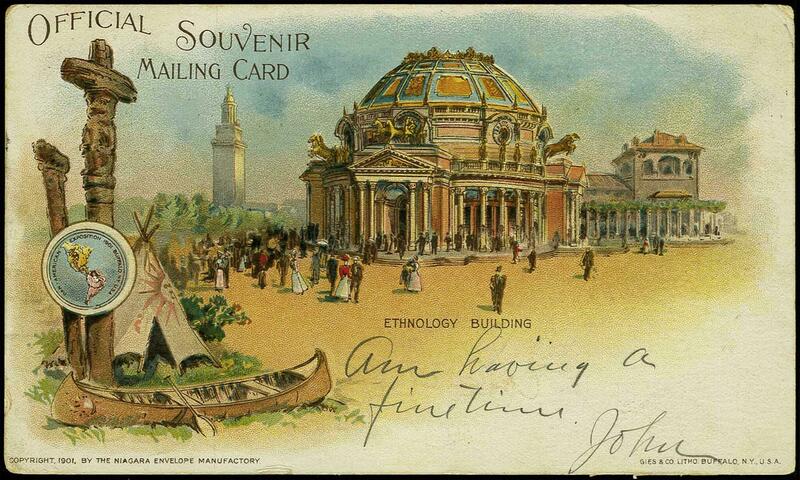 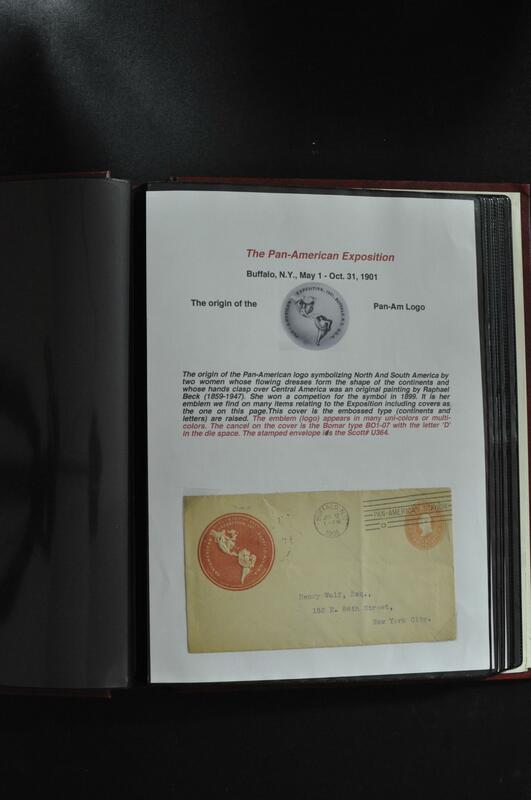 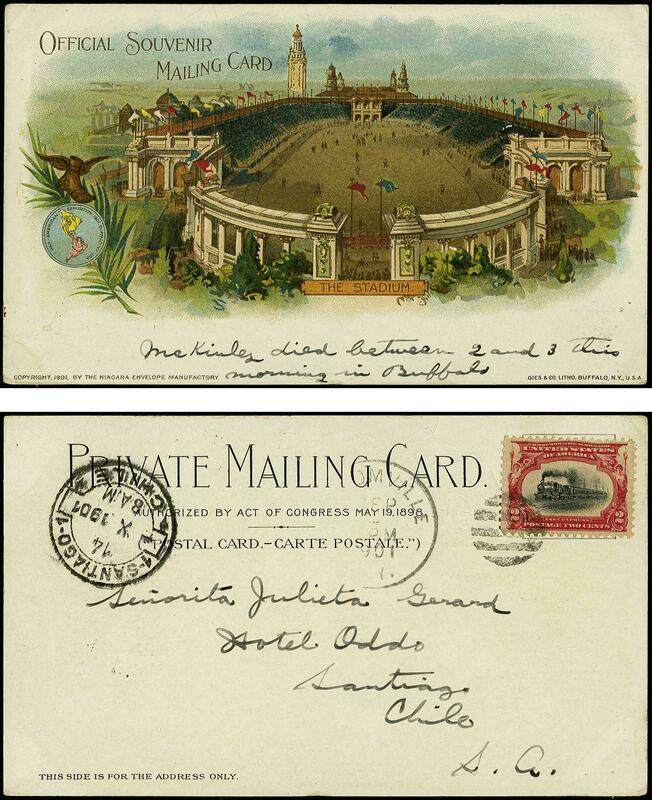 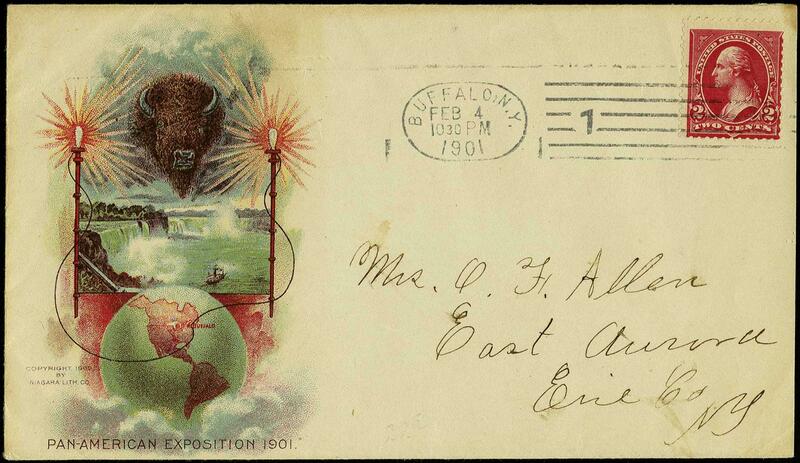 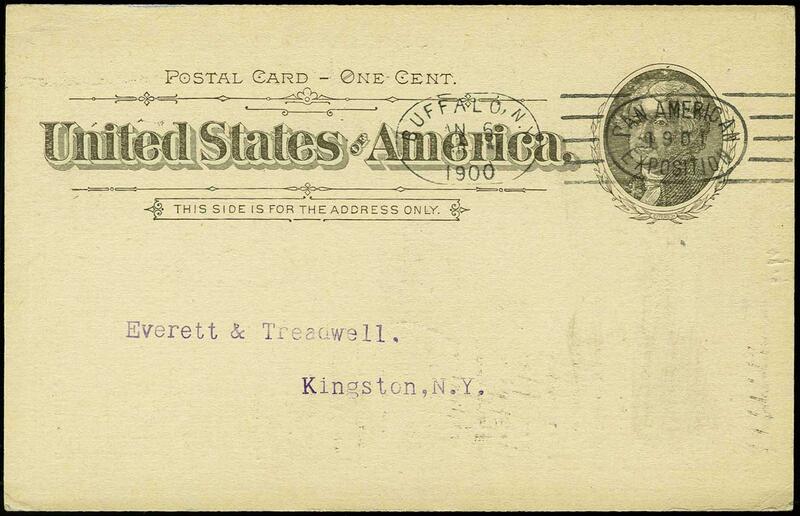 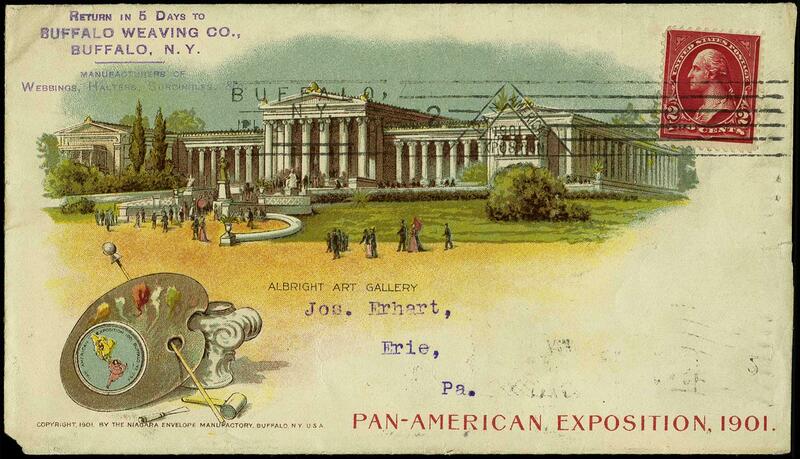 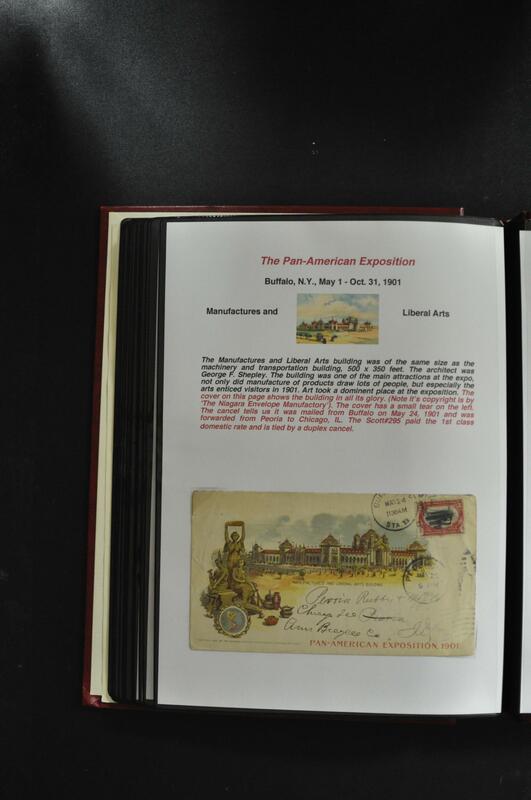 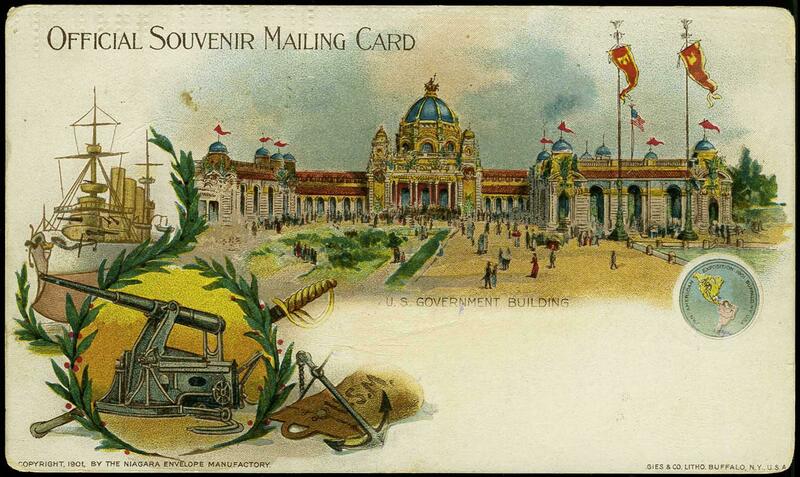 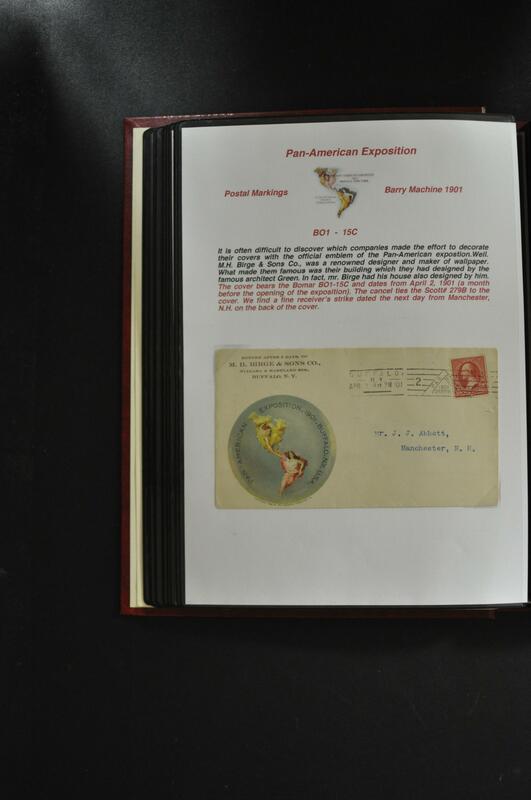 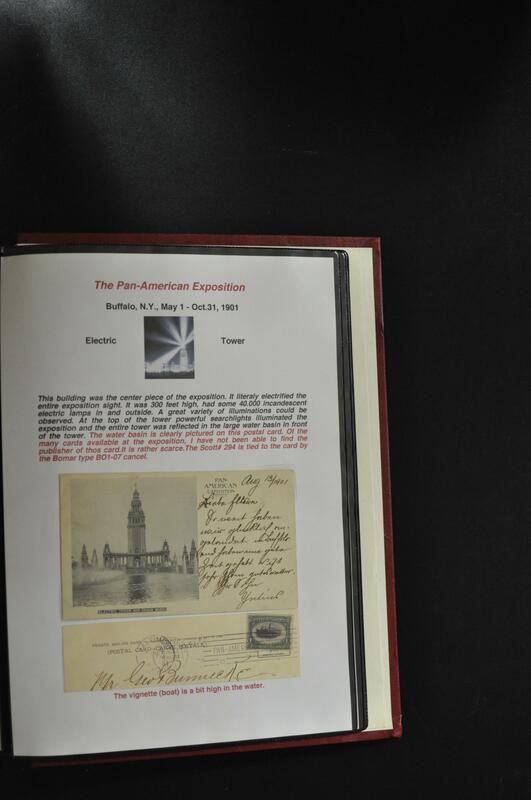 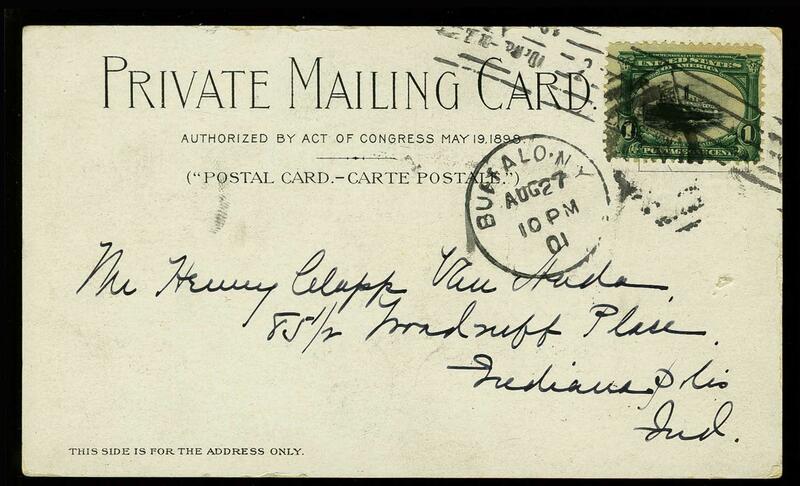 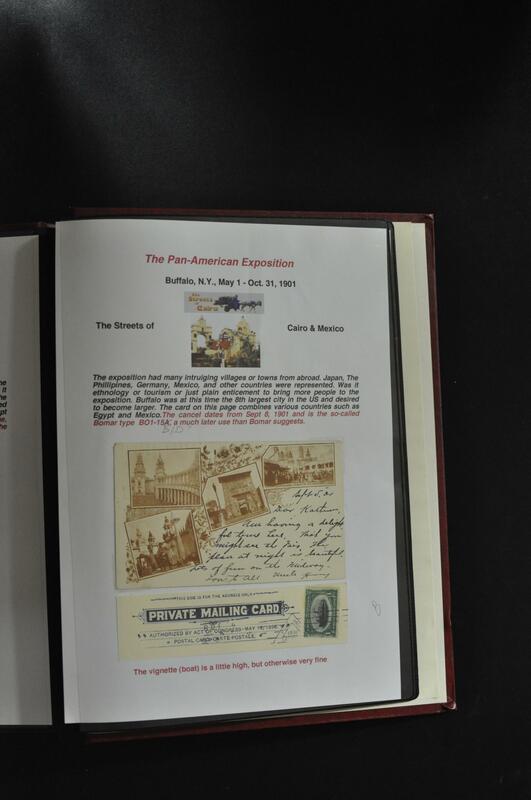 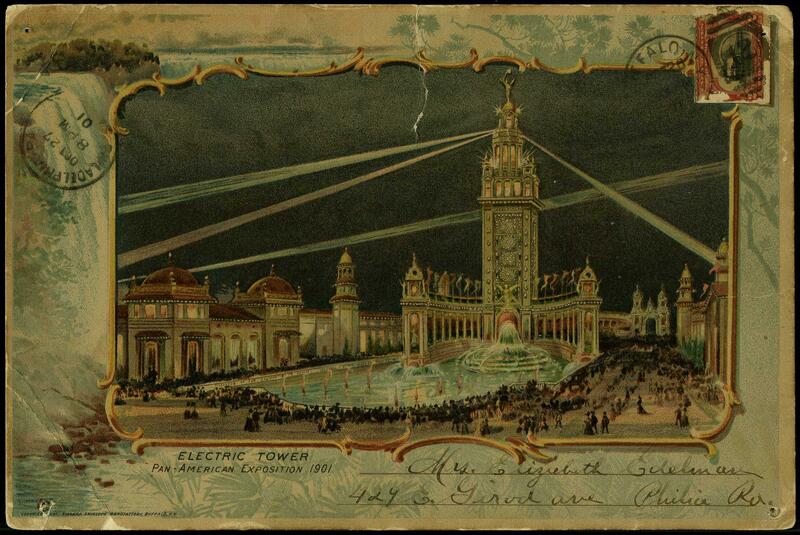 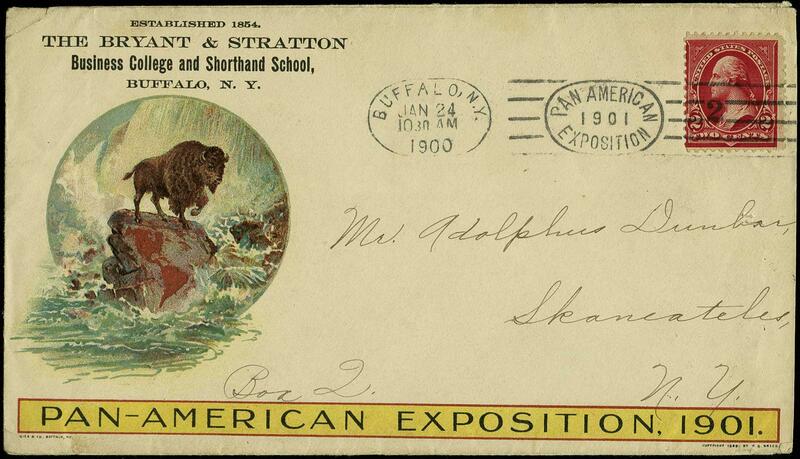 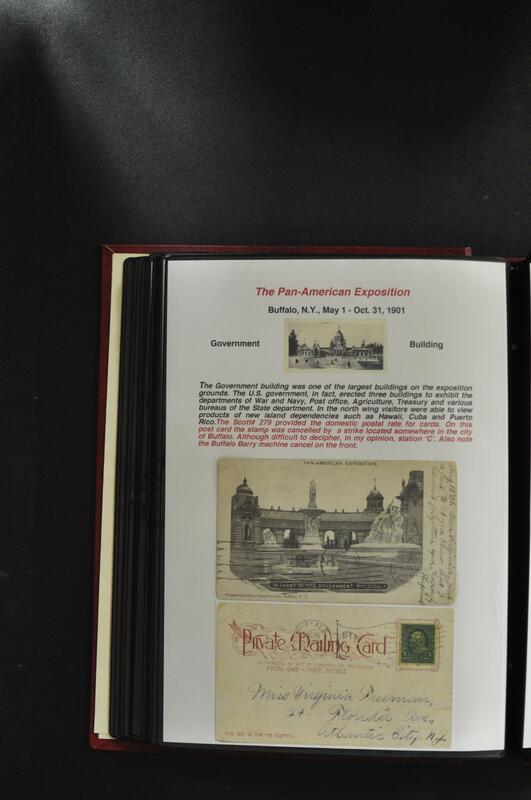 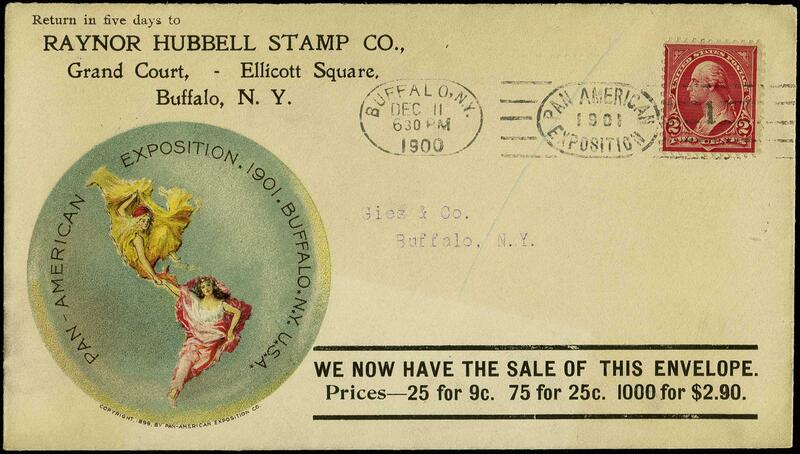 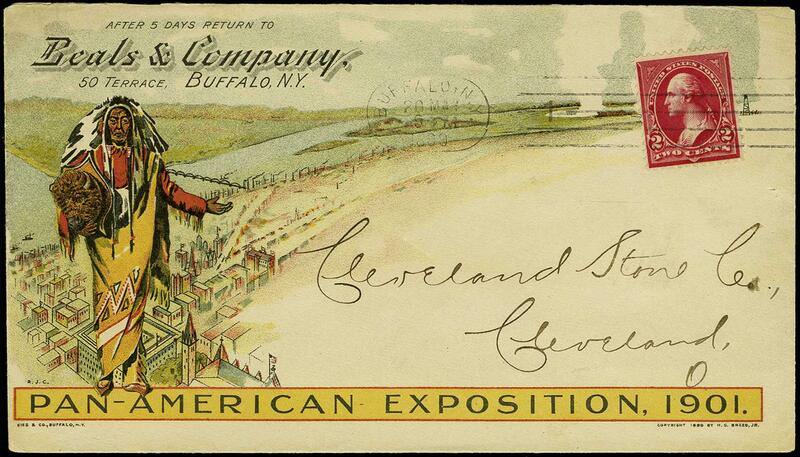 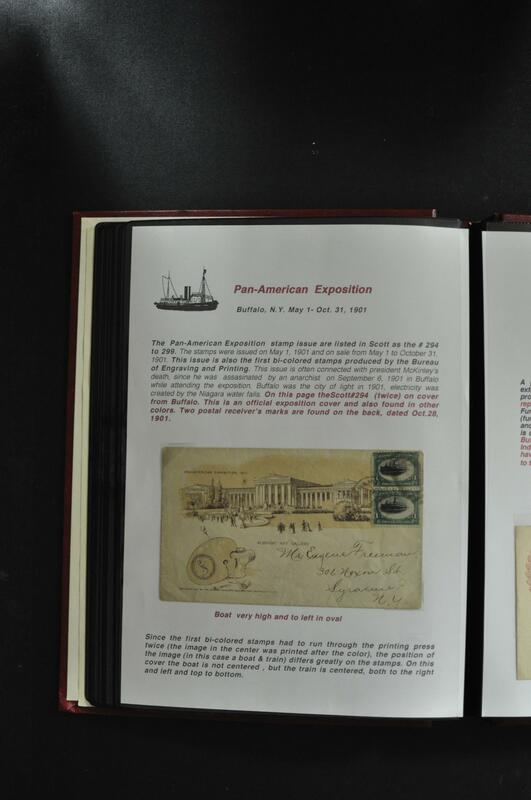 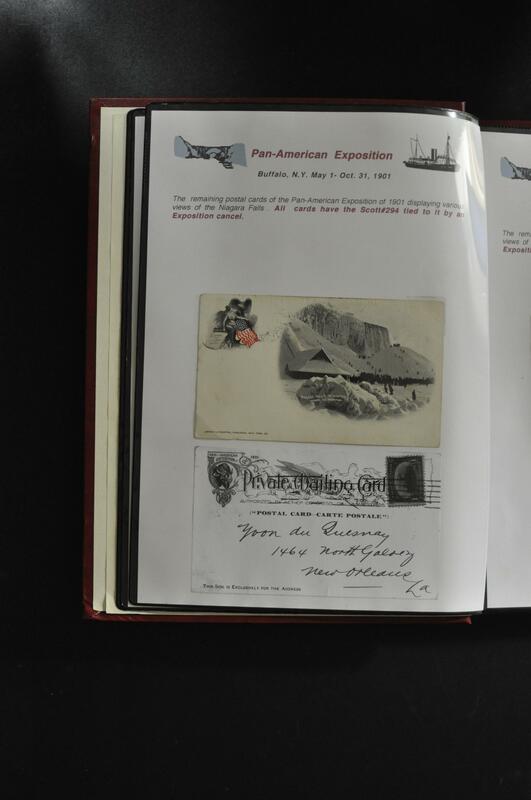 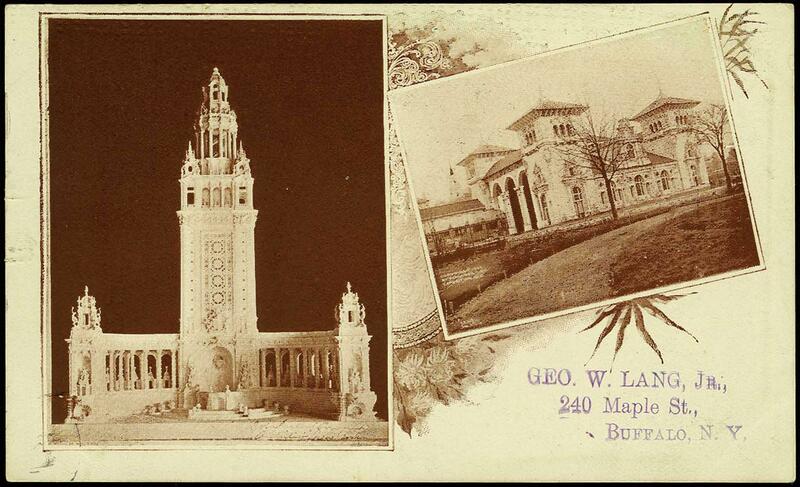 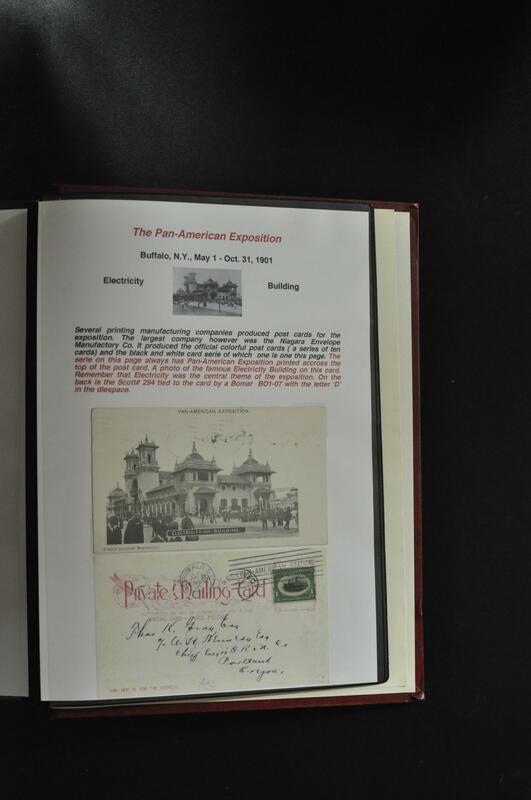 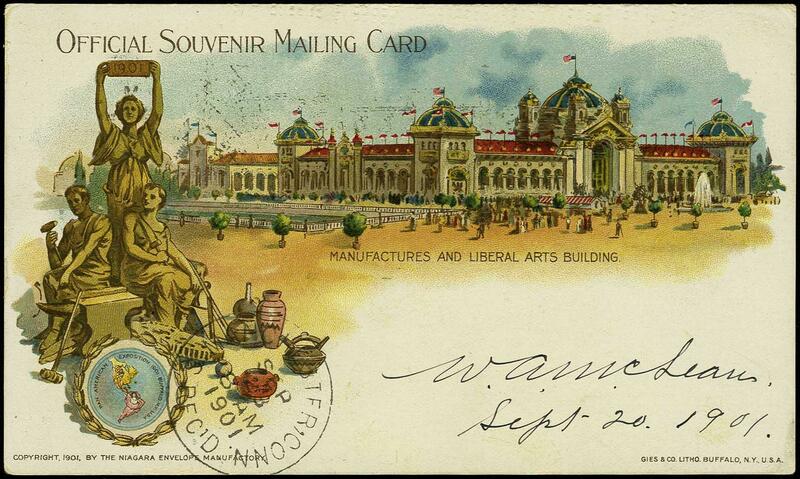 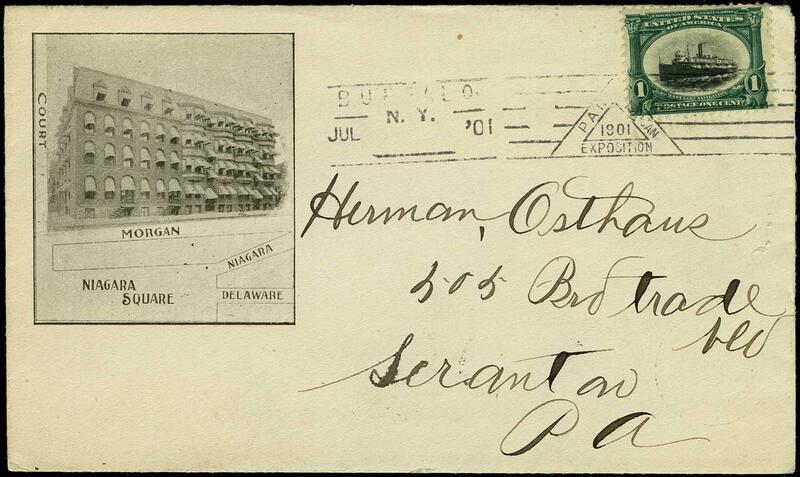 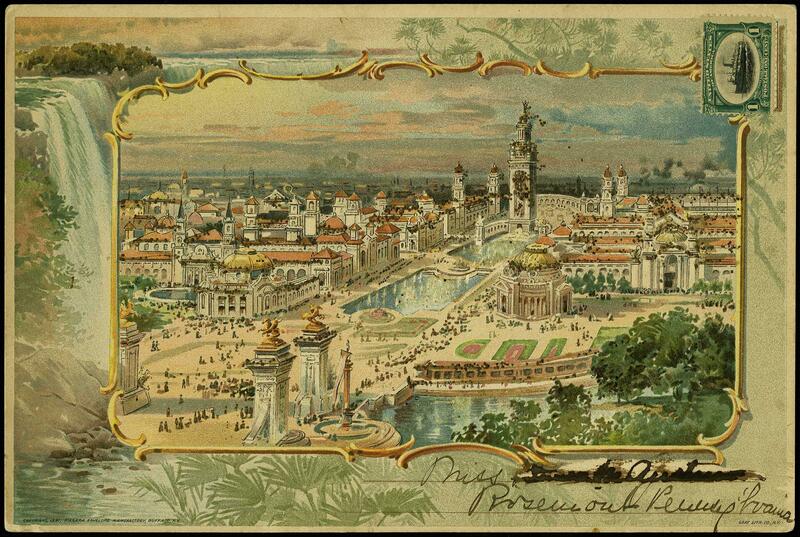 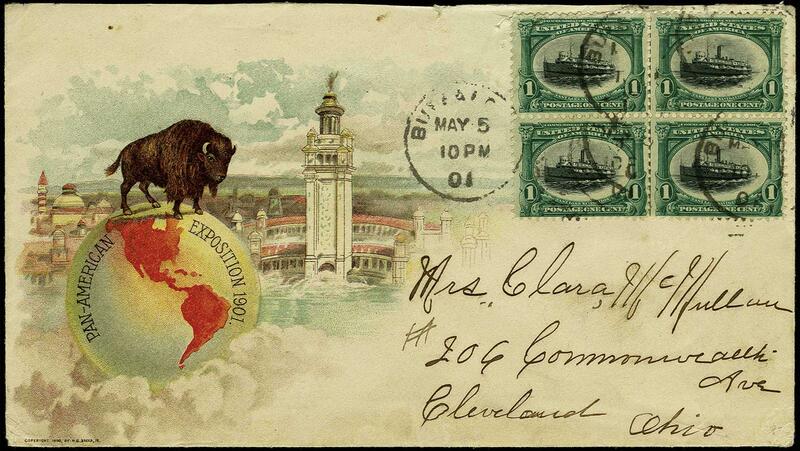 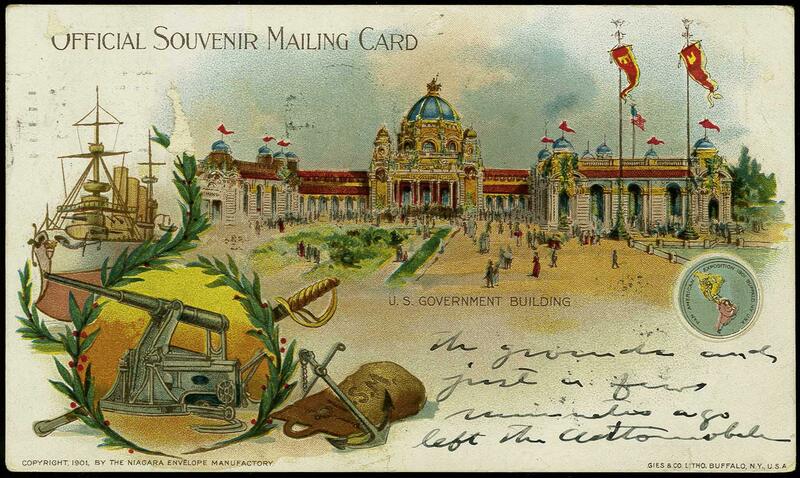 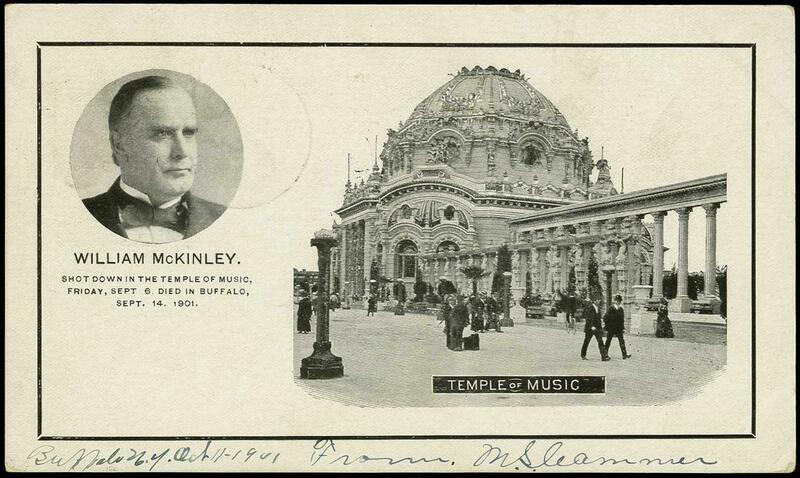 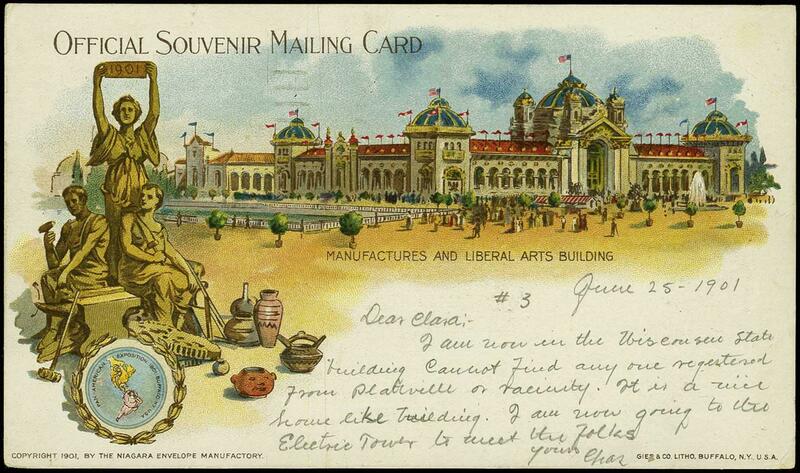 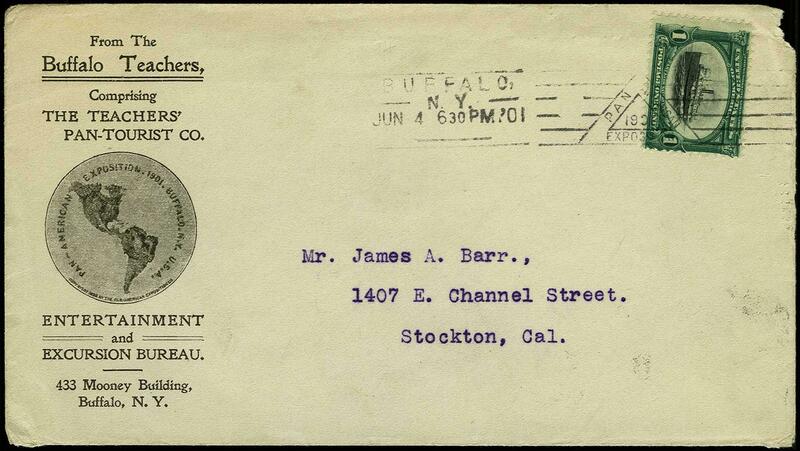 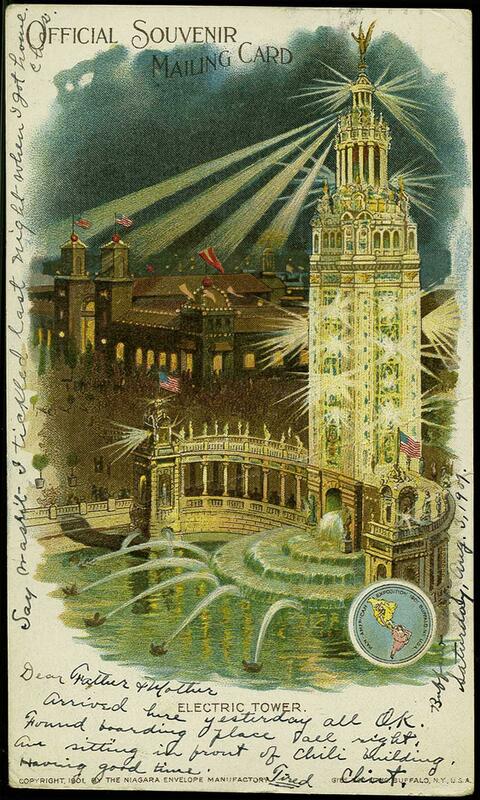 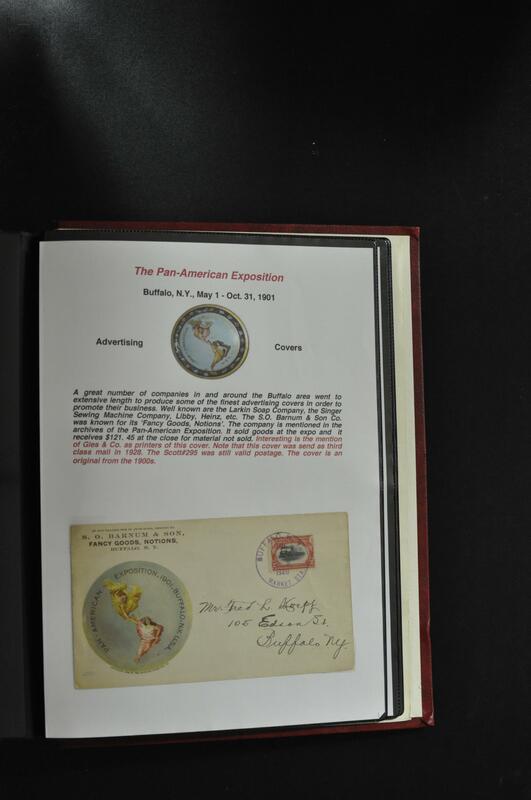 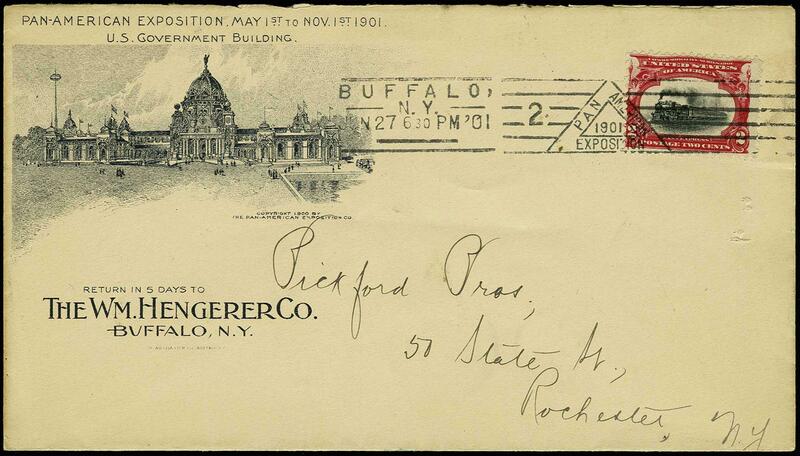 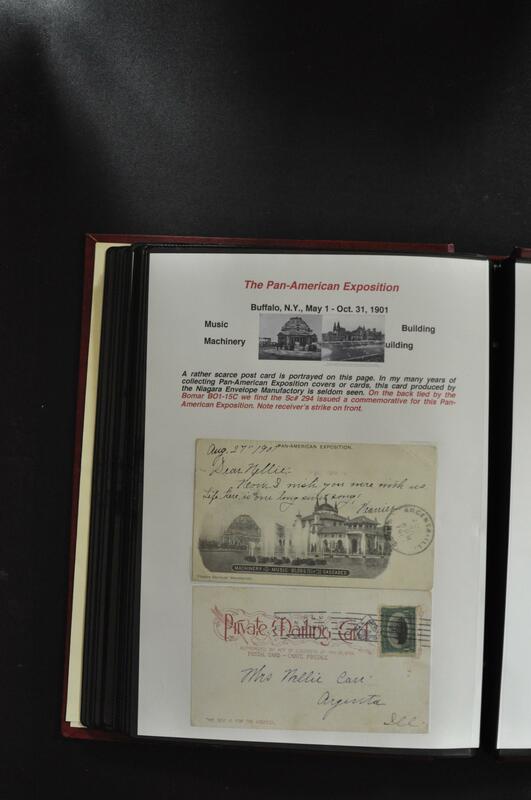 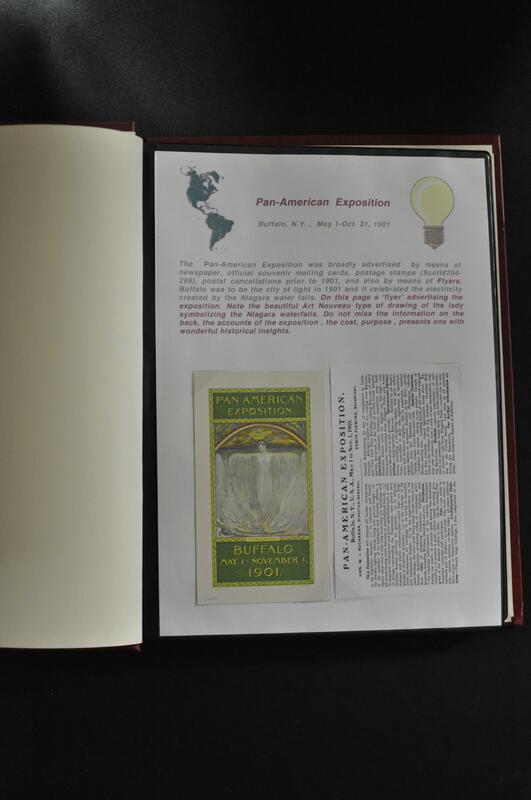 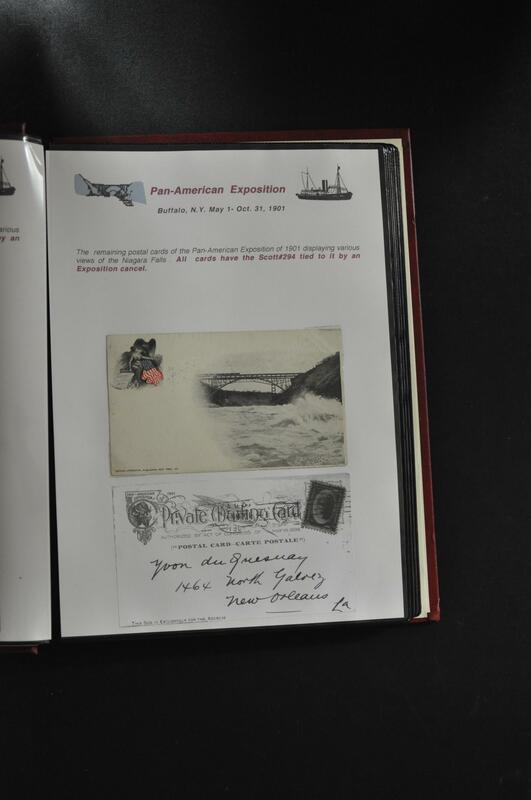 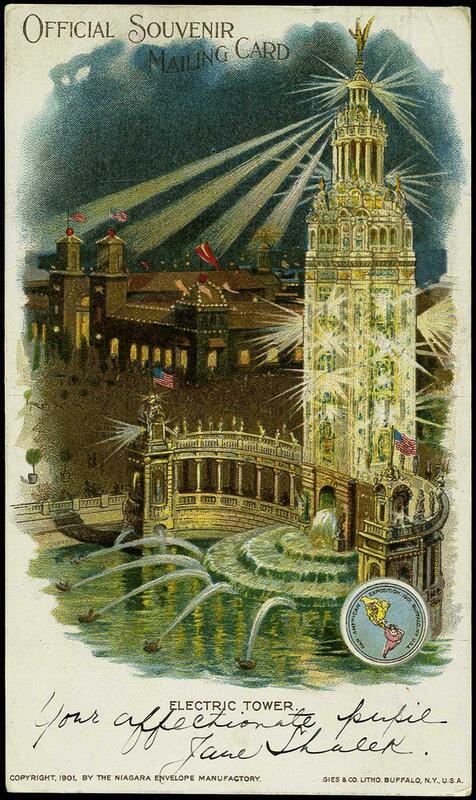 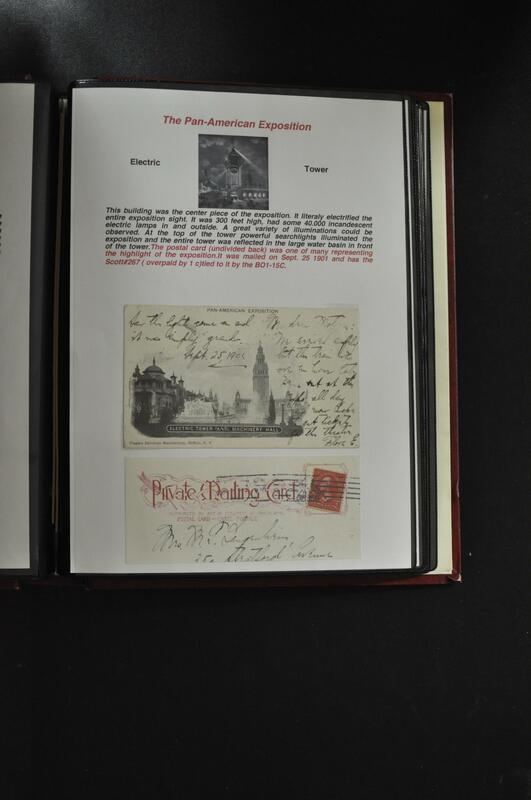 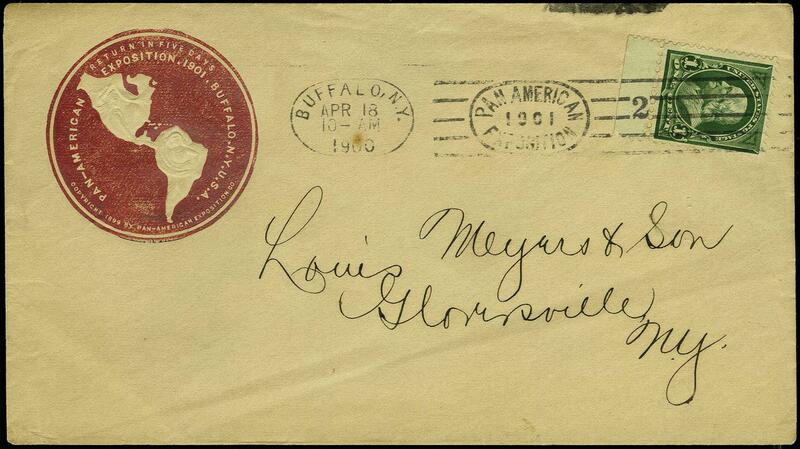 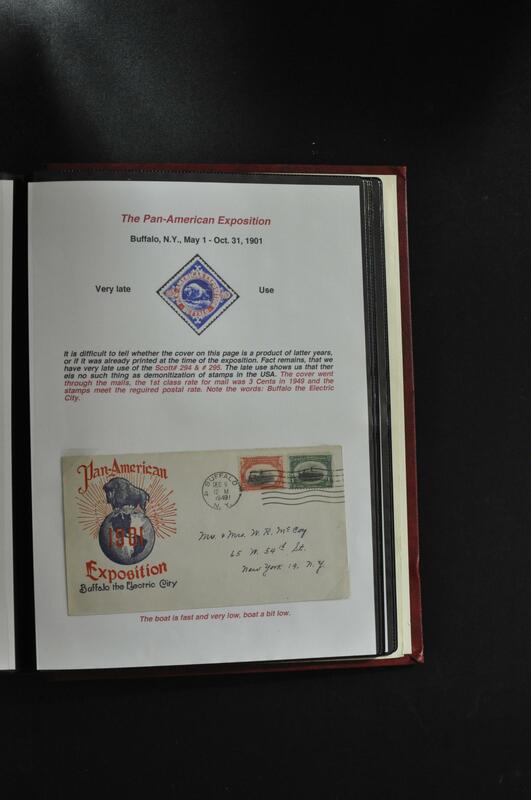 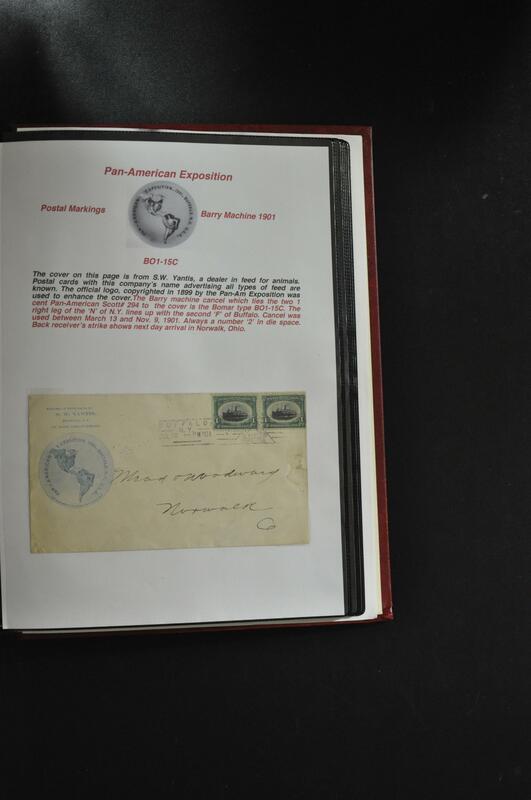 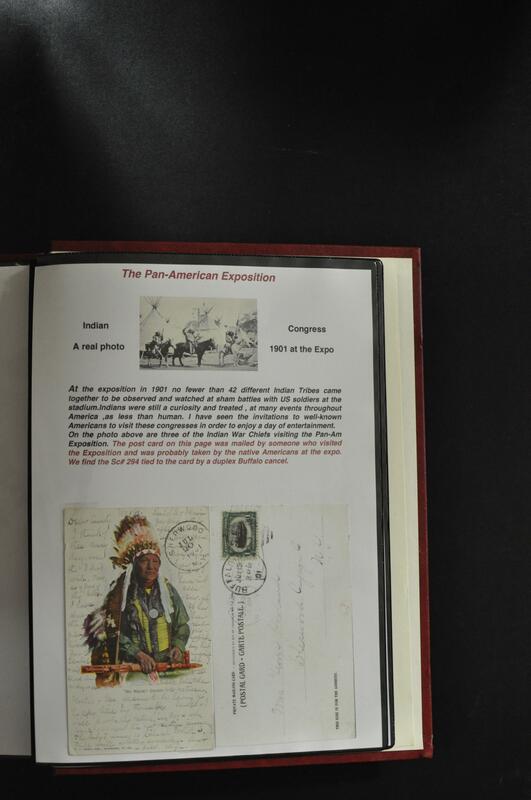 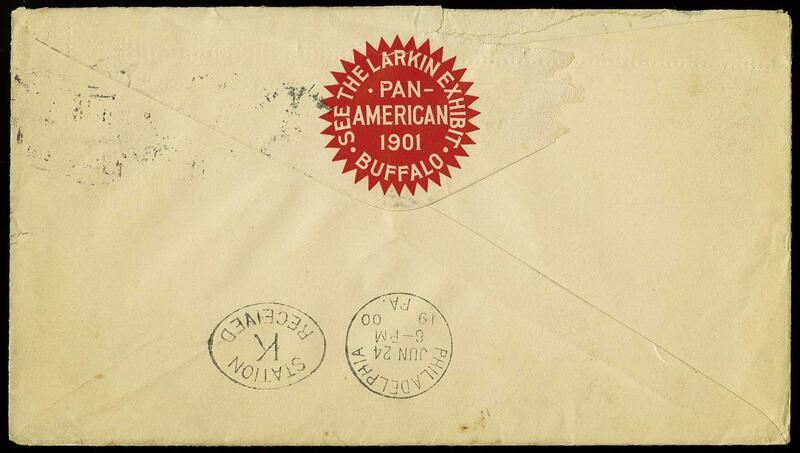 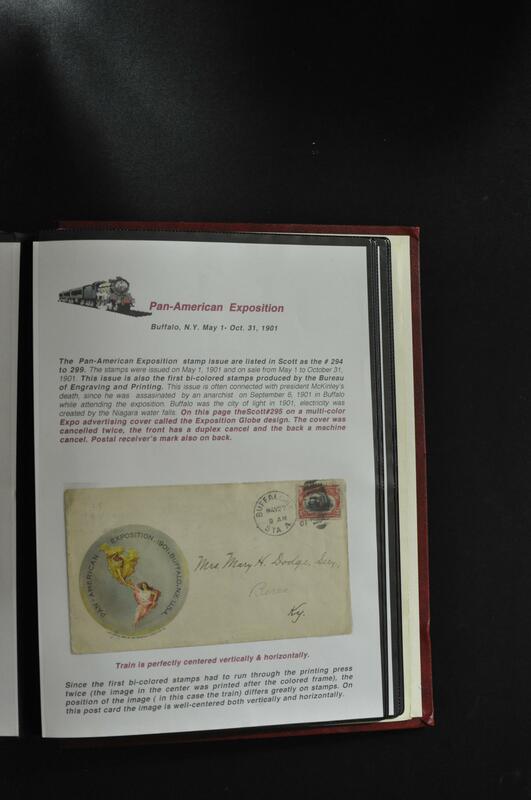 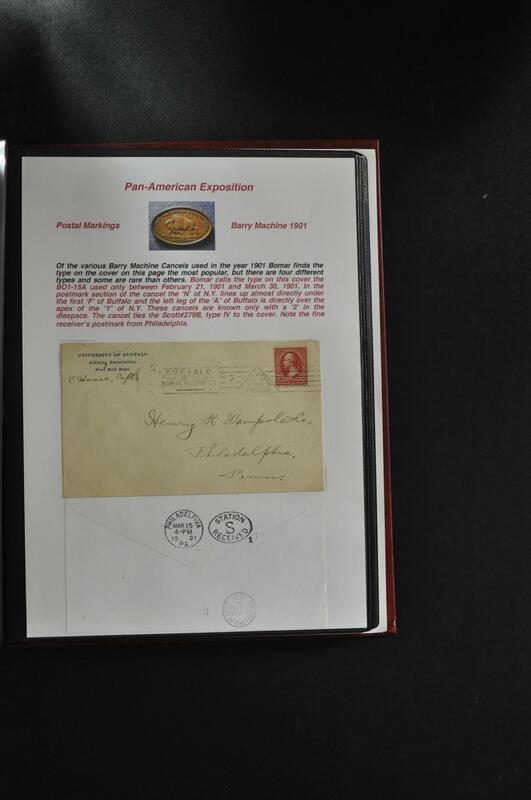 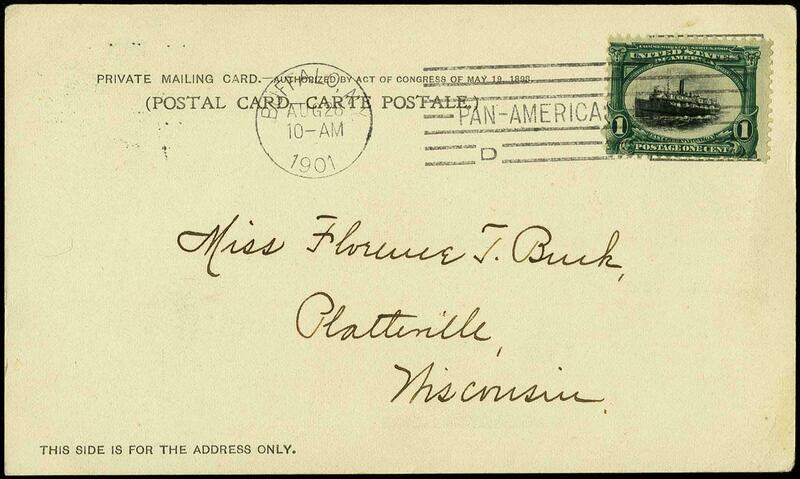 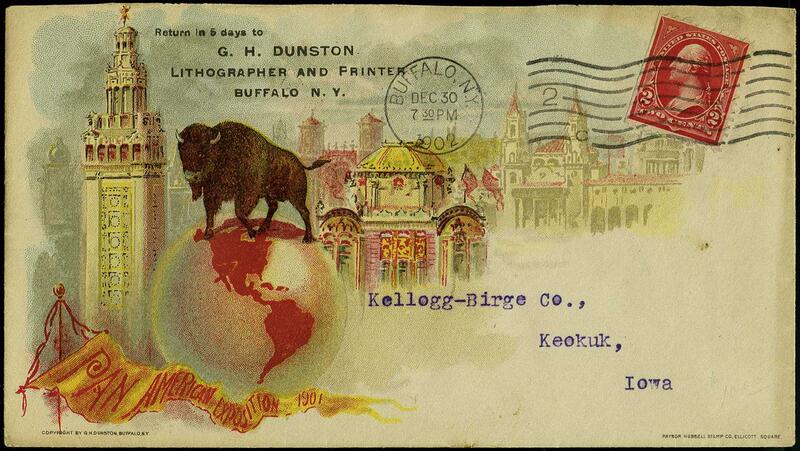 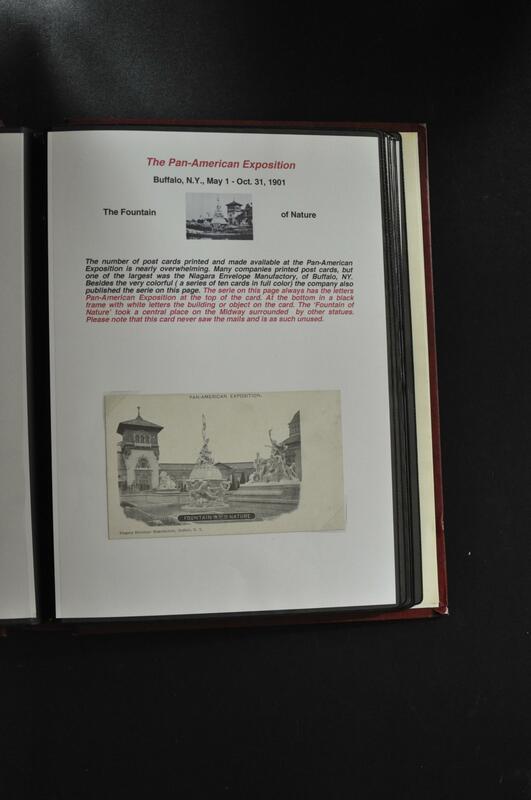 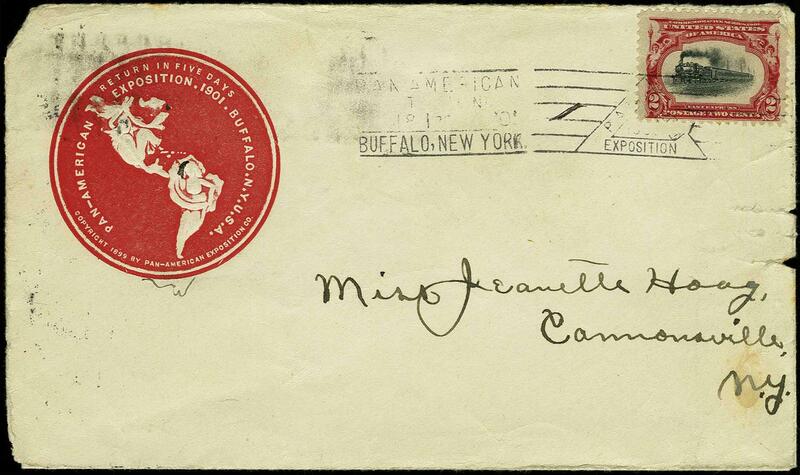 1901 1¢ Pan American "Buffalo N. Y. Jun 4 '01 Pan American Exposition" Barry machine cancel with die space blank (Bomar B01-15B) ties stamp to Buffalo Teachers corner card illustrated with Globe showing North and South hemispheres, addressed to Stockton Cal. 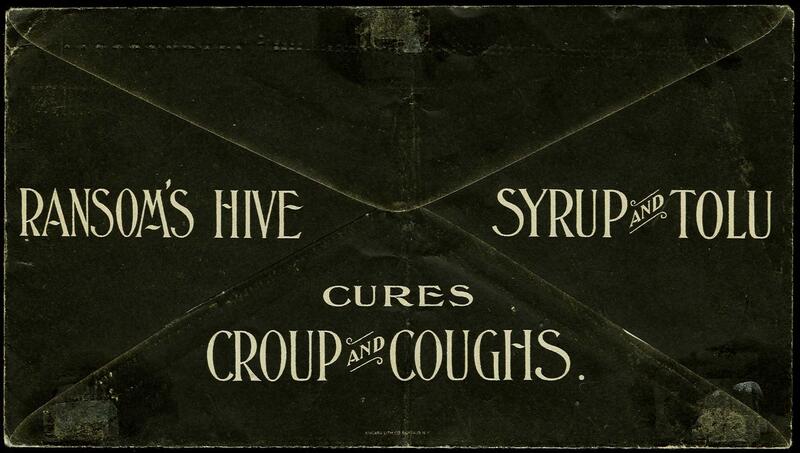 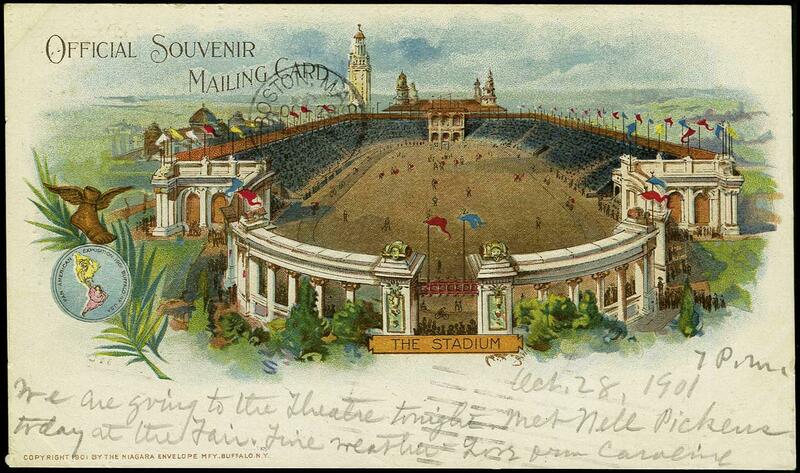 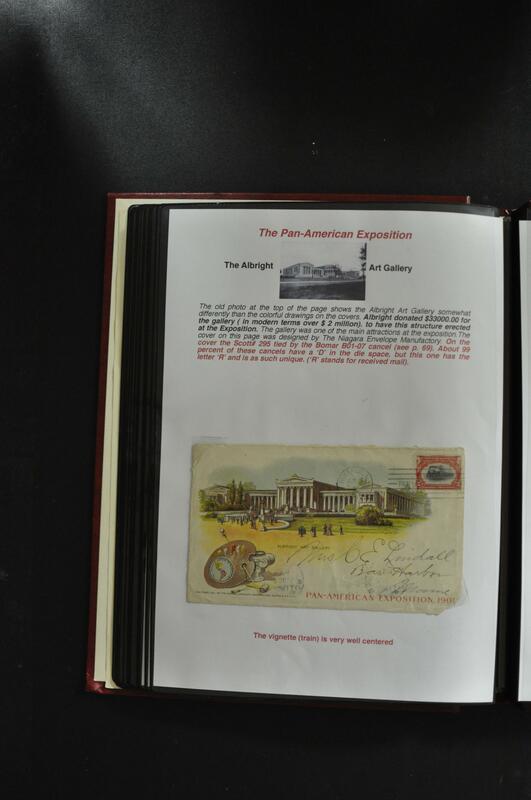 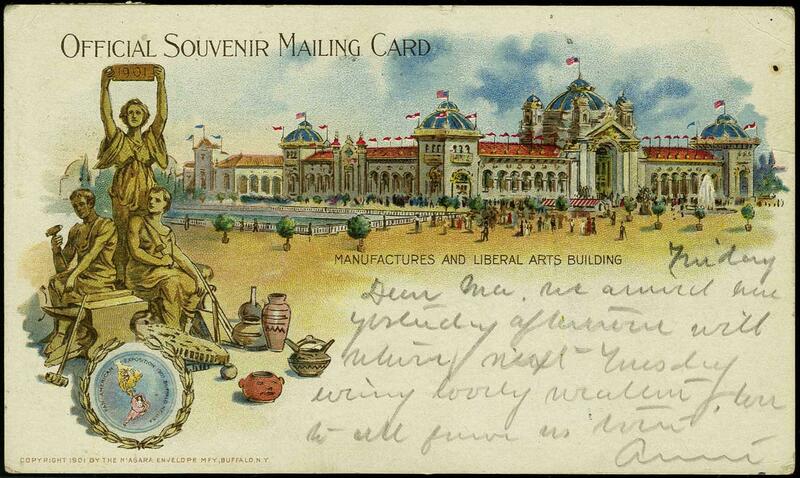 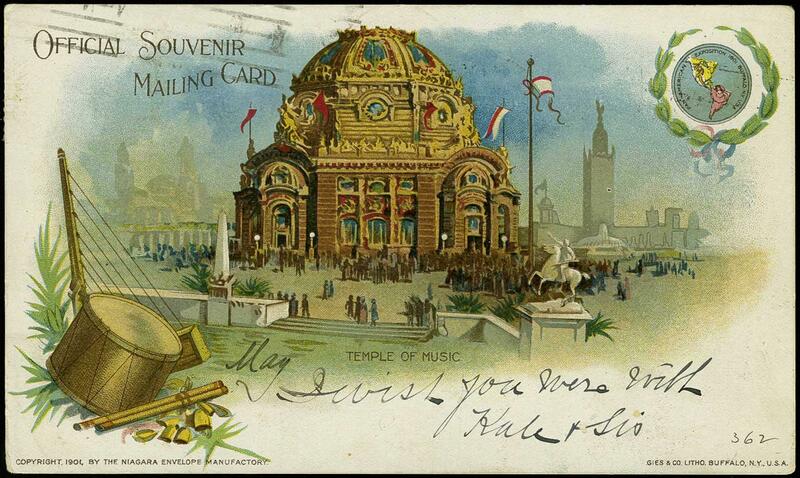 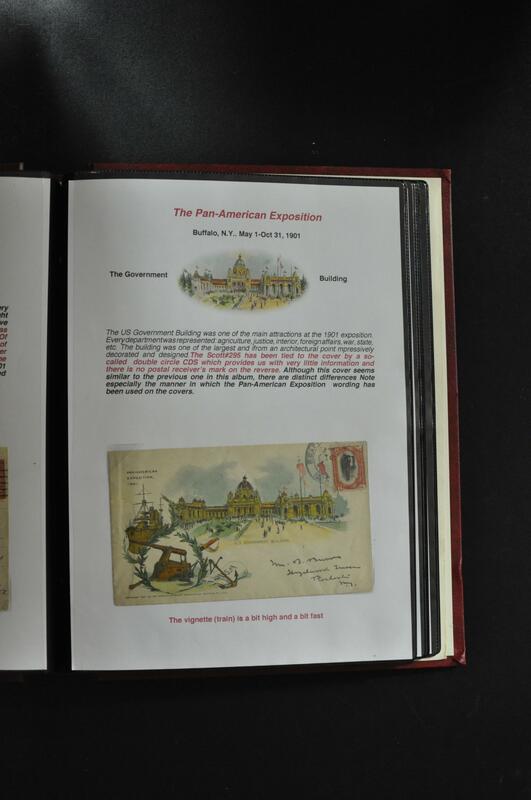 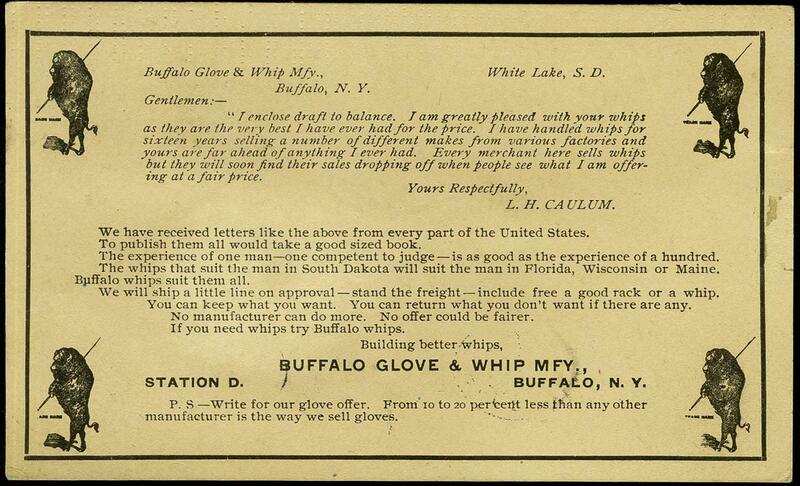 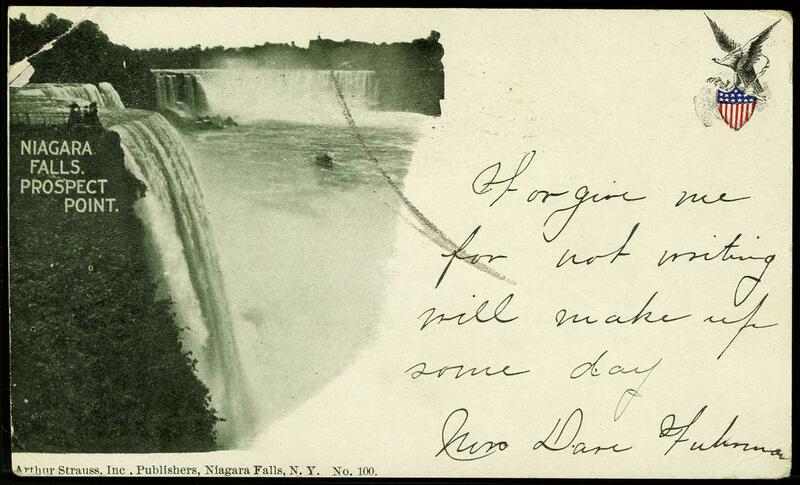 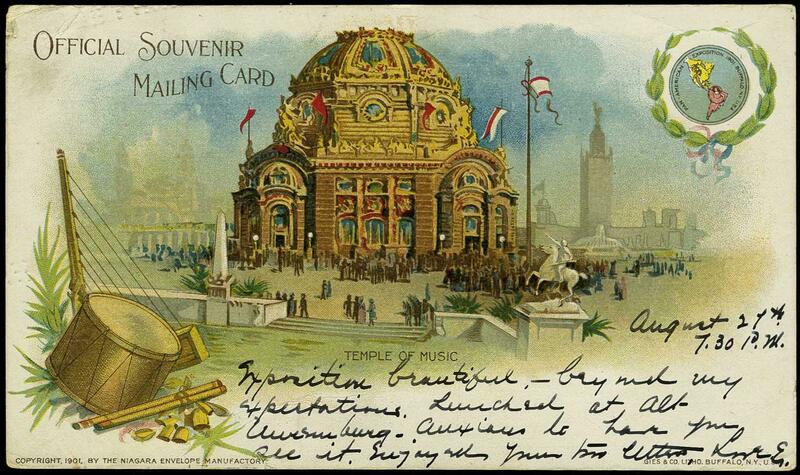 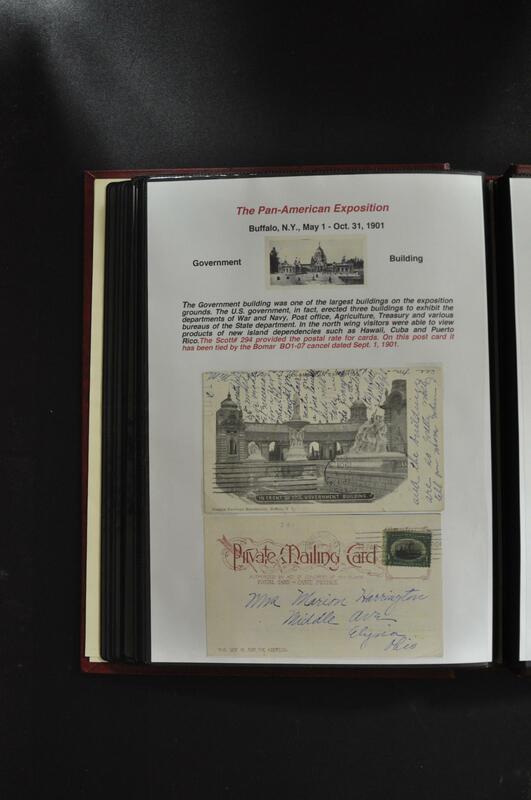 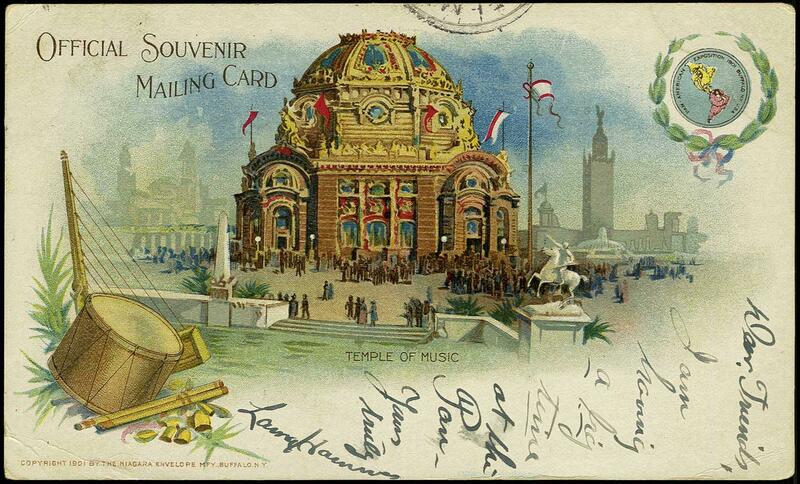 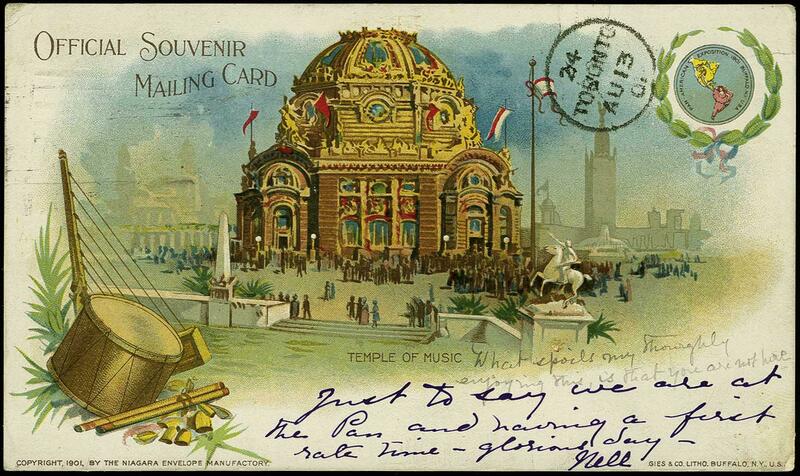 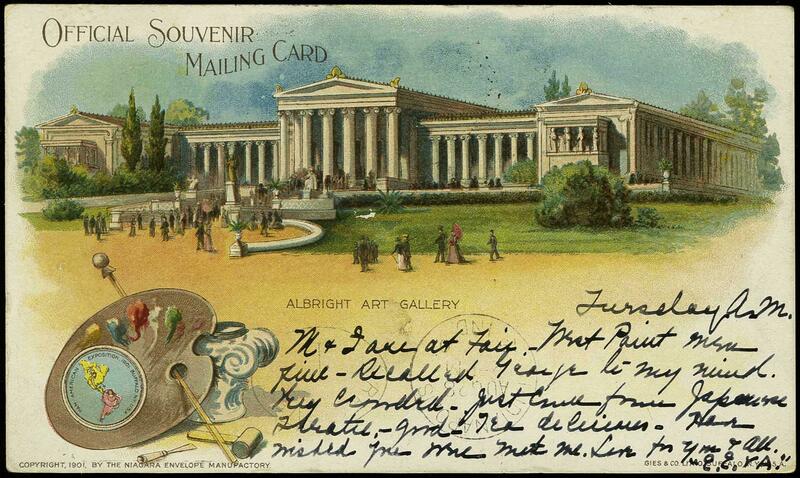 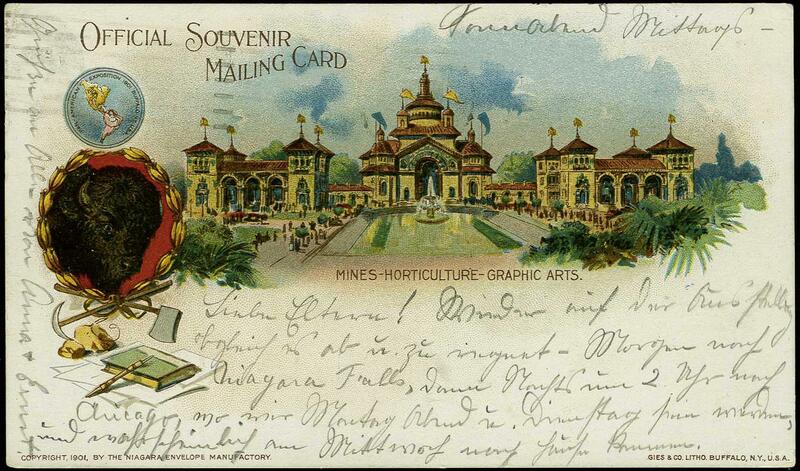 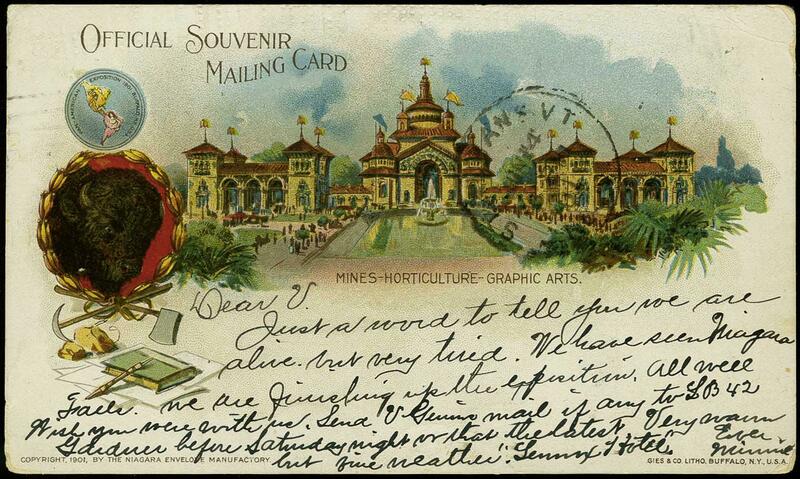 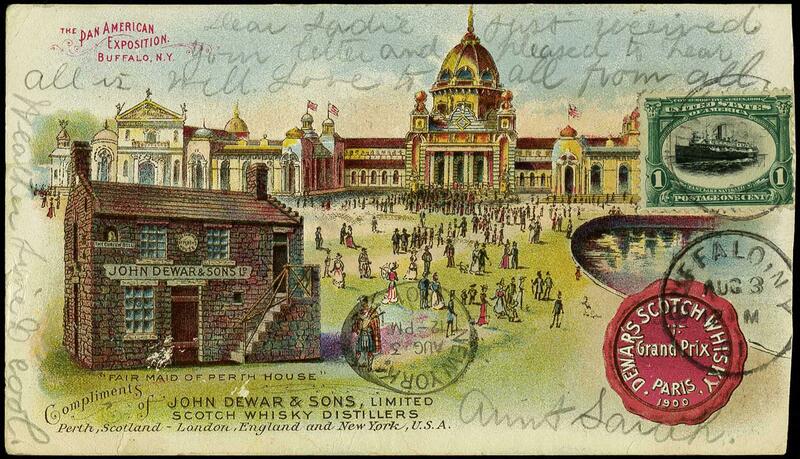 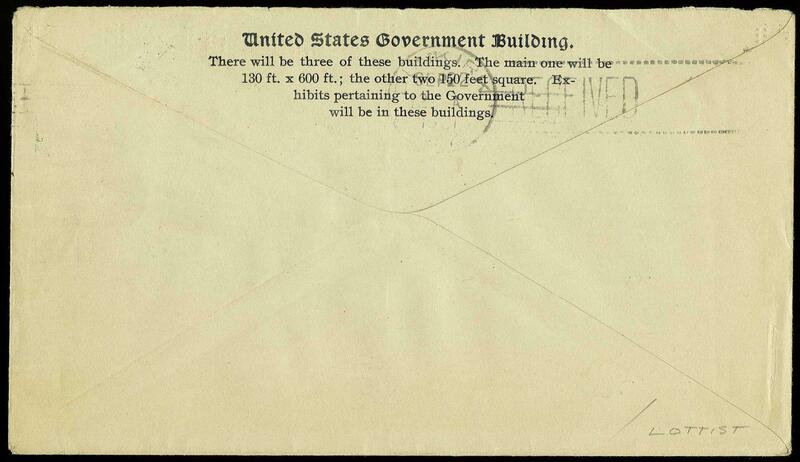 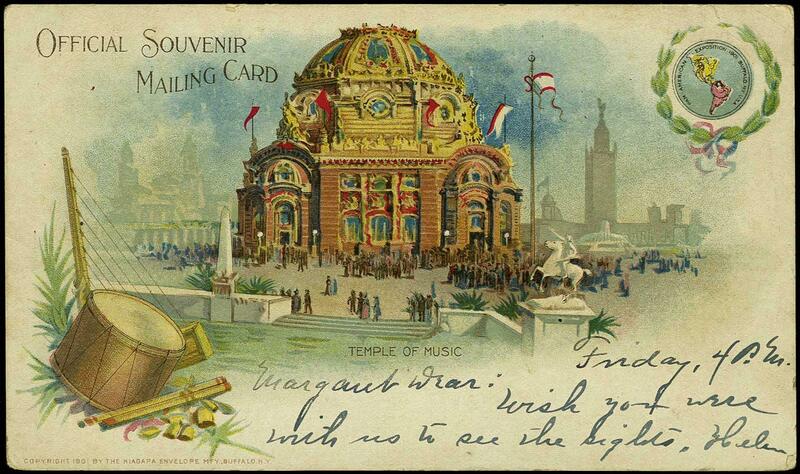 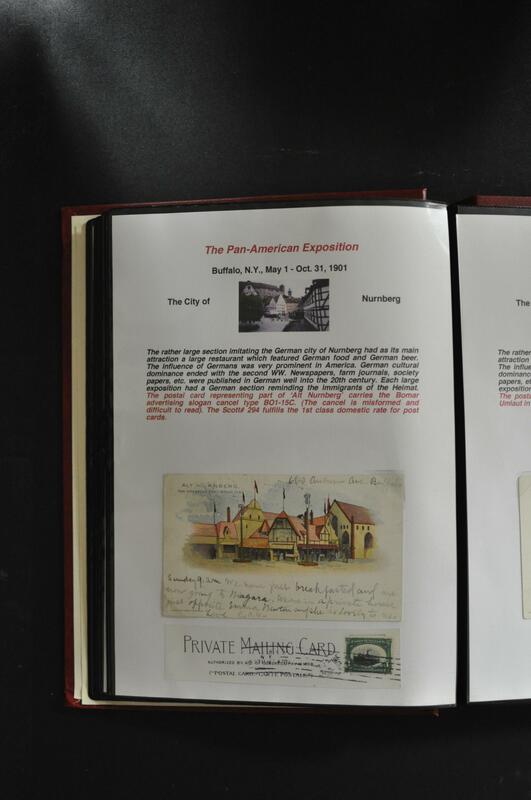 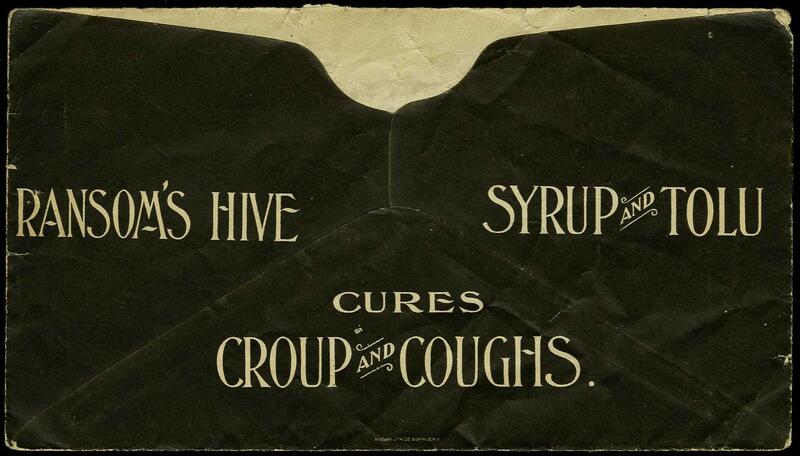 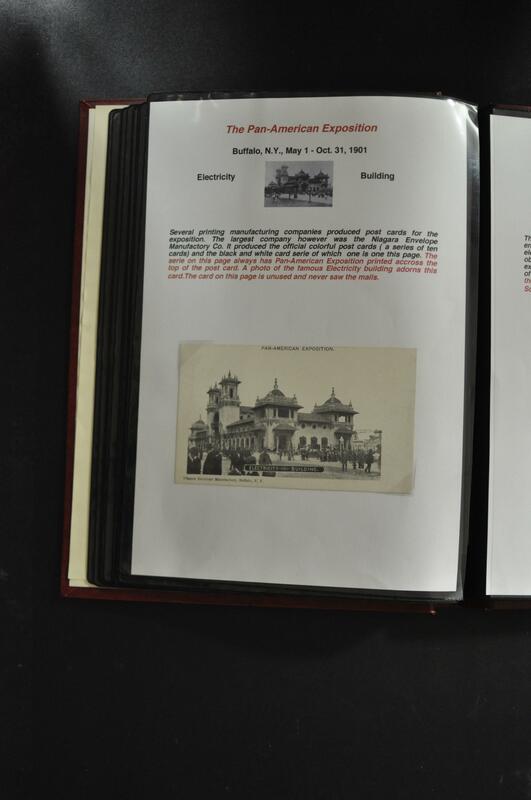 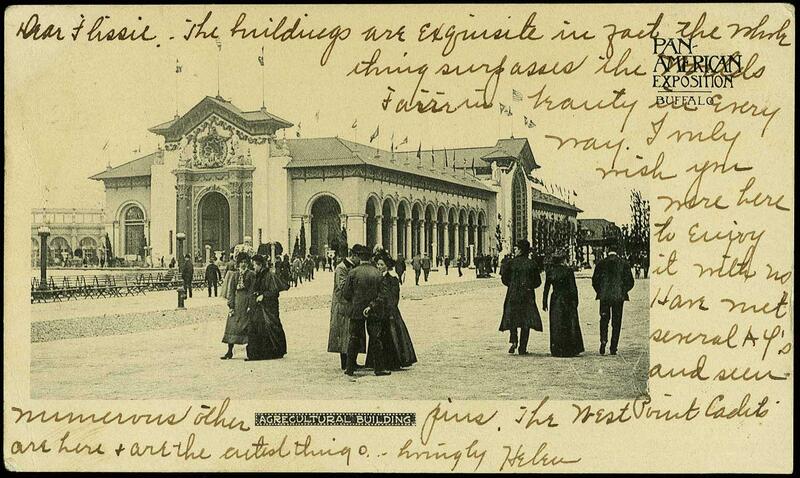 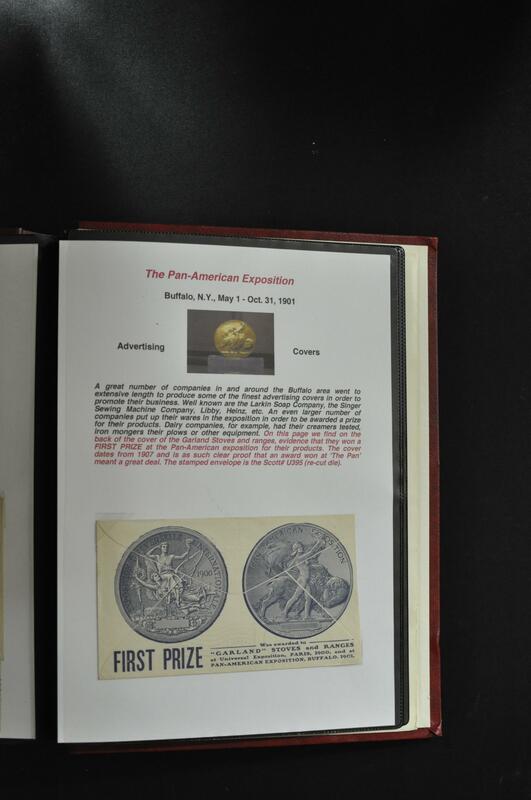 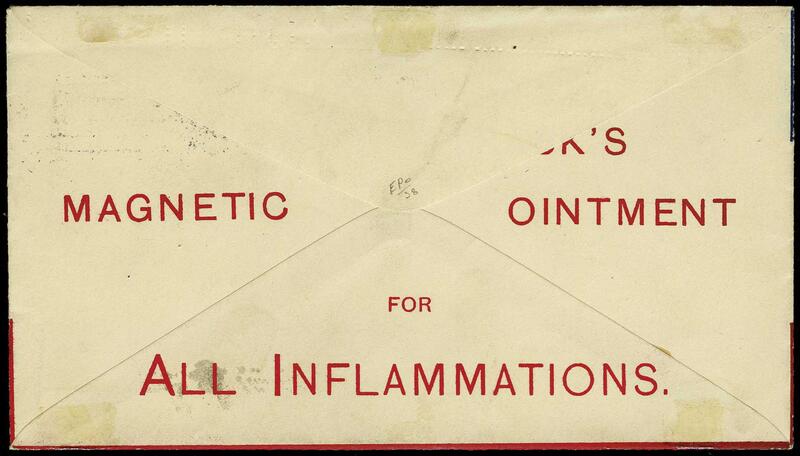 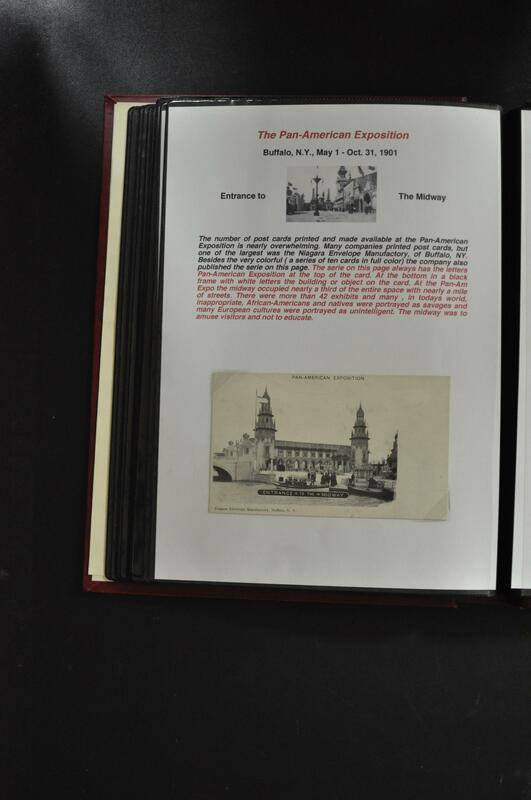 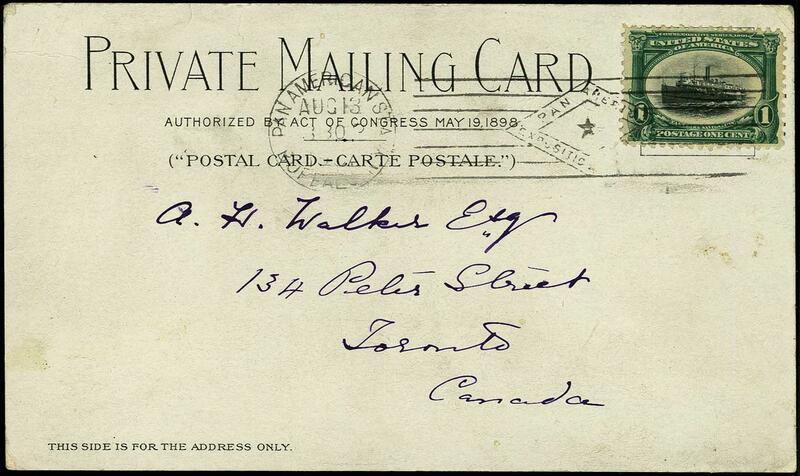 Cover with small flaws otherwise Very Fine and Scarce. 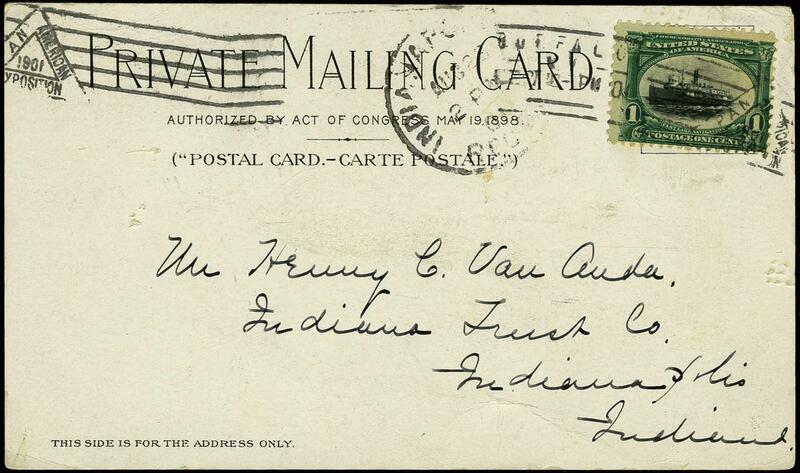 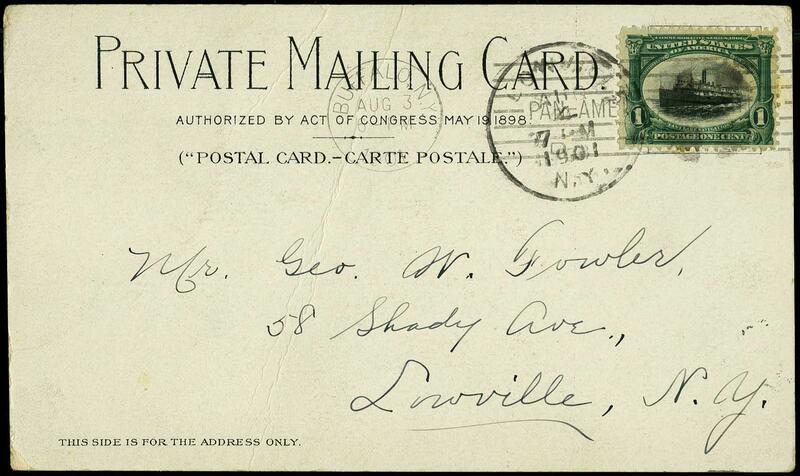 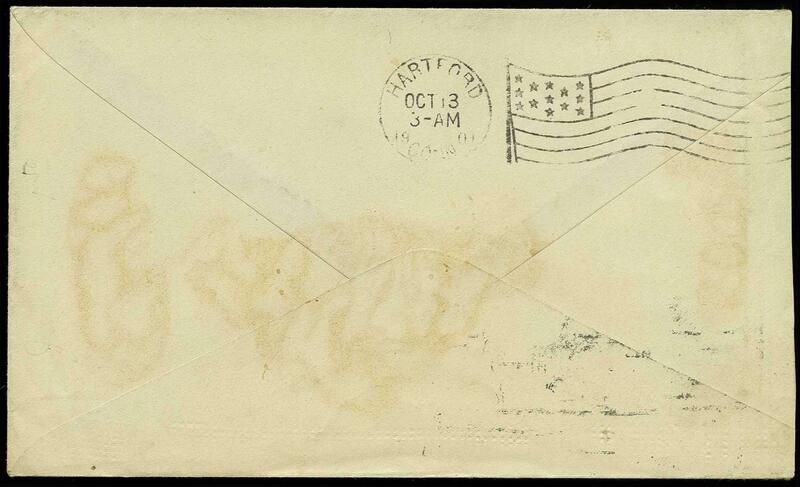 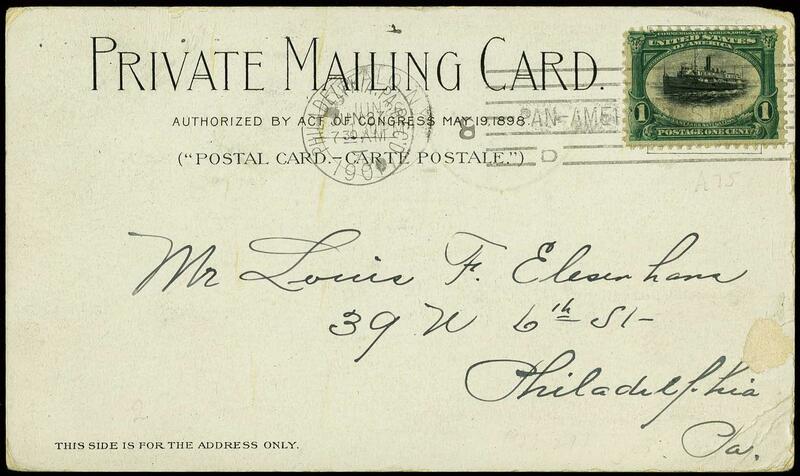 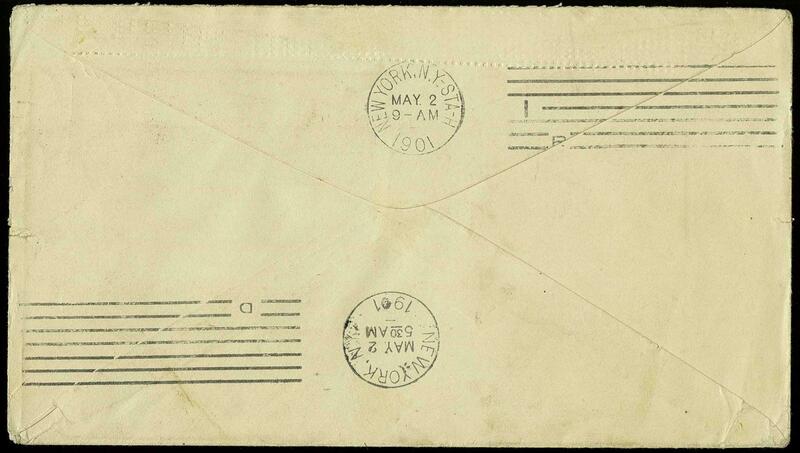 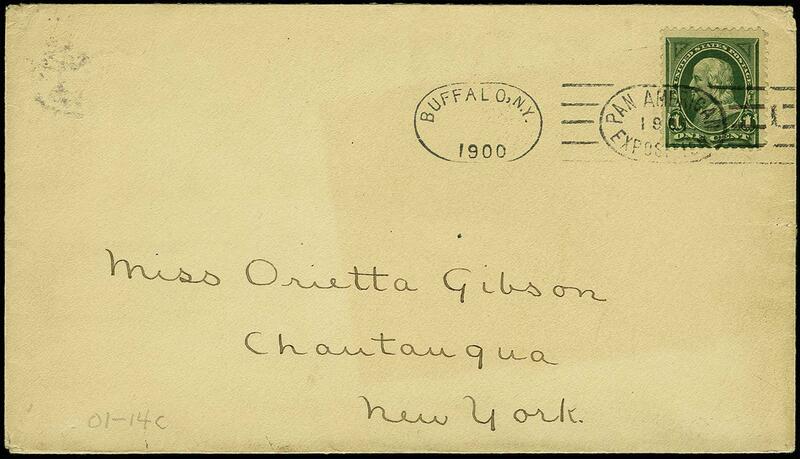 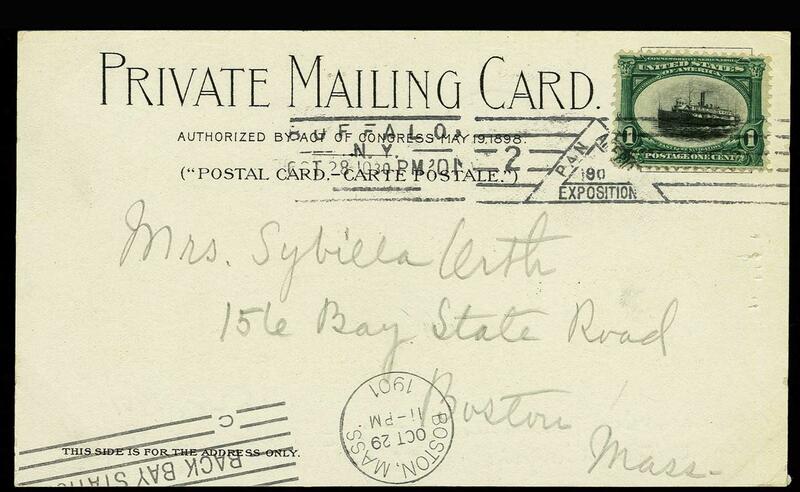 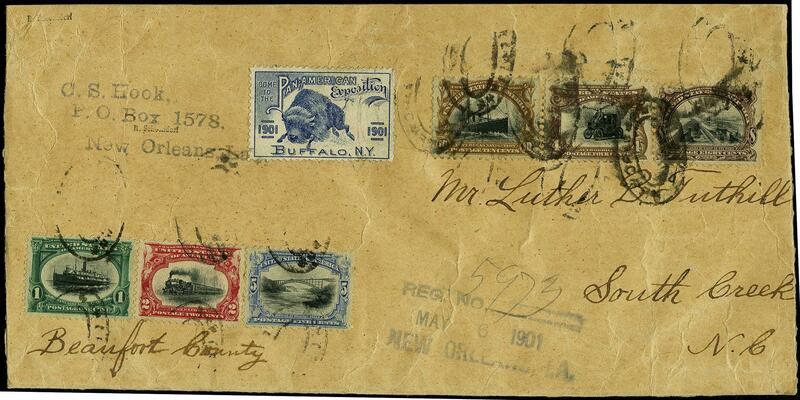 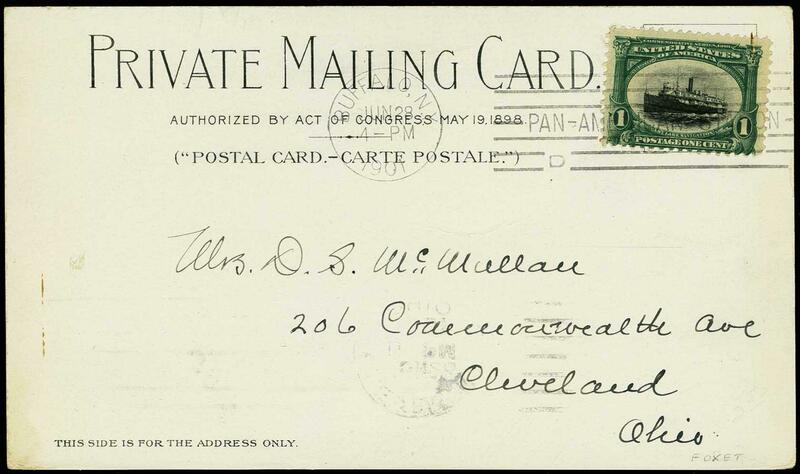 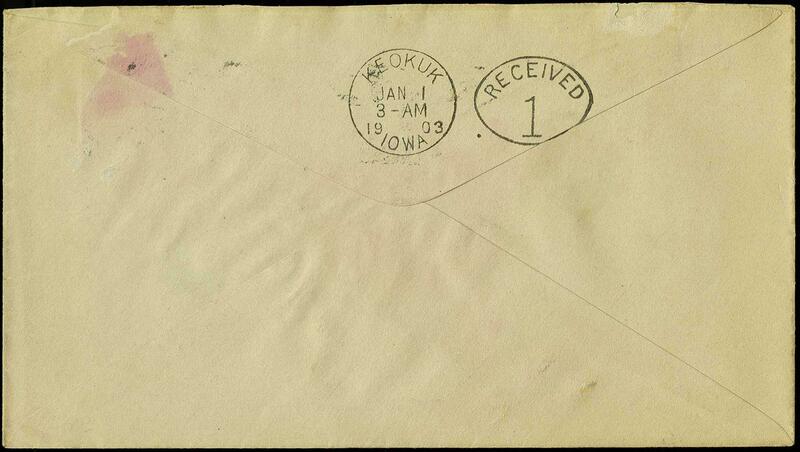 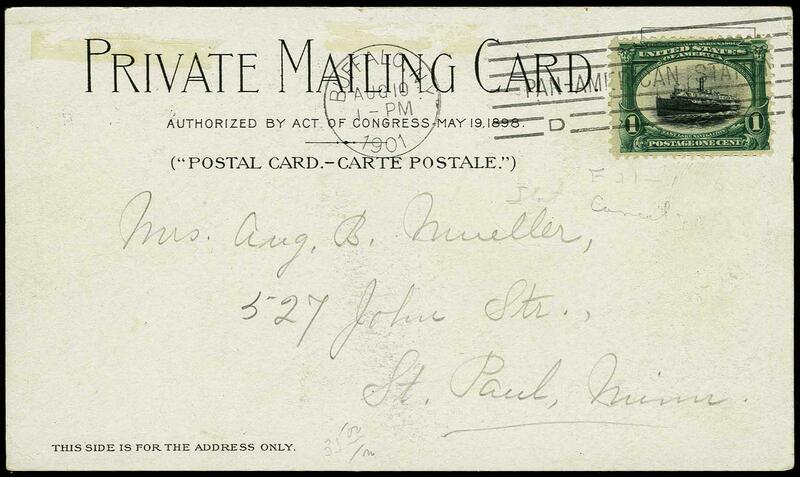 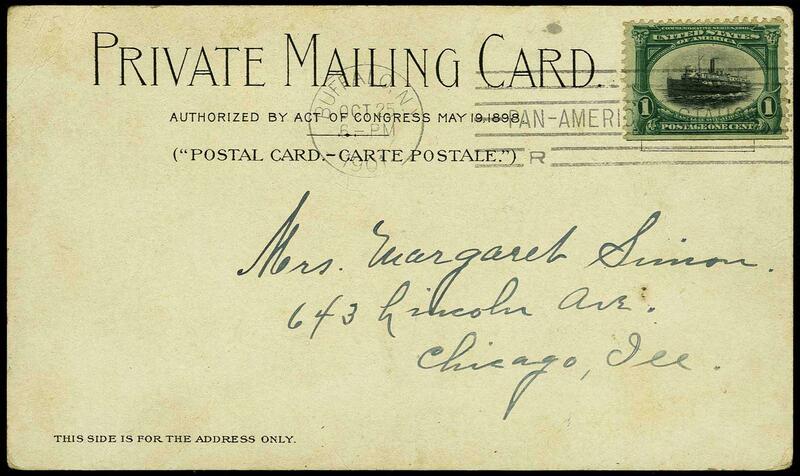 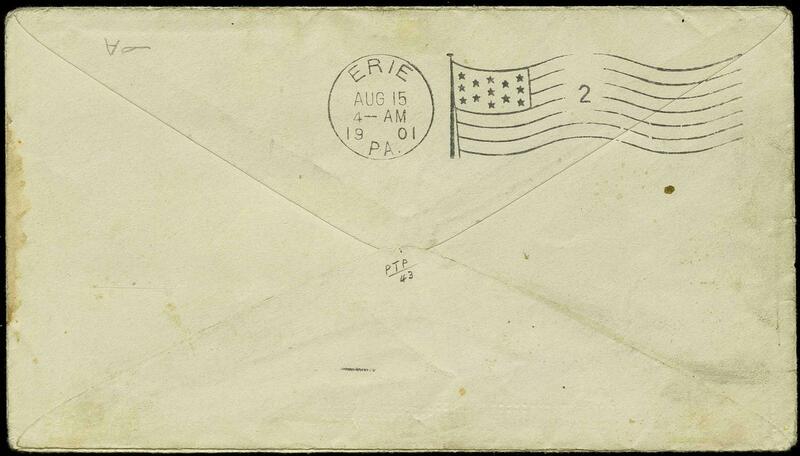 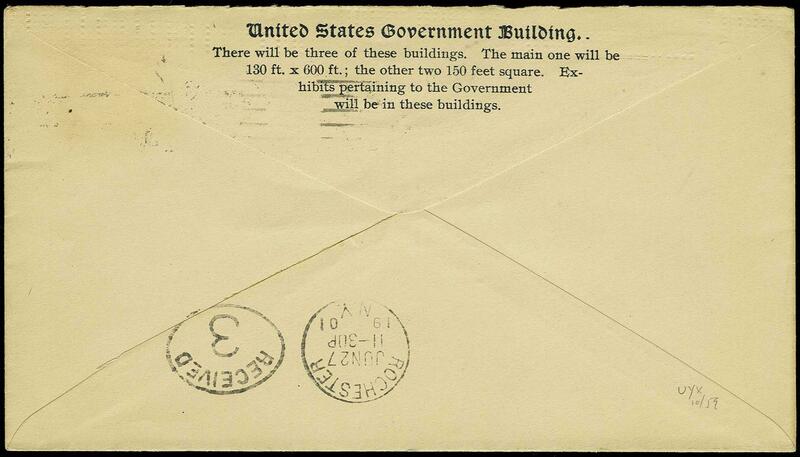 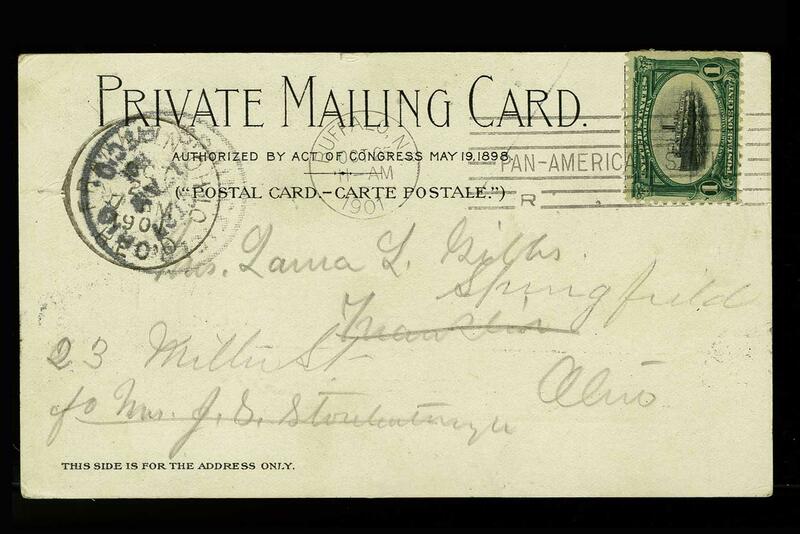 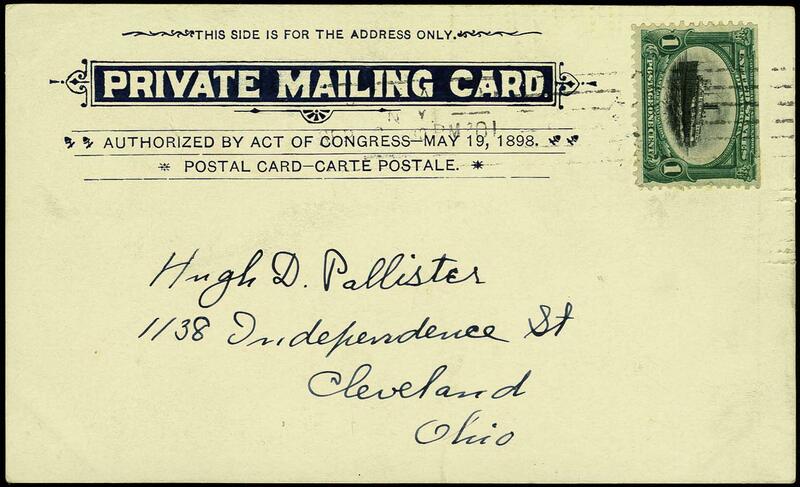 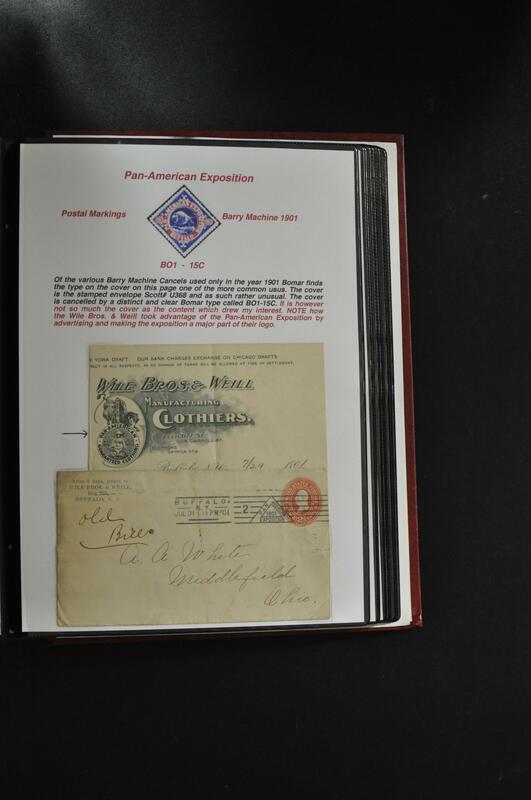 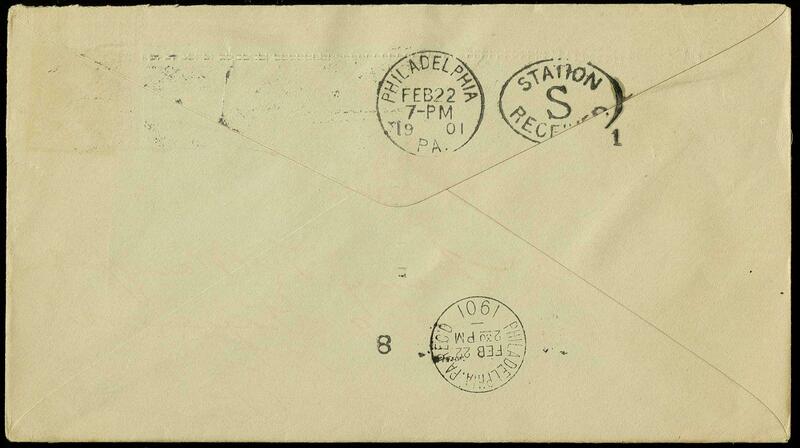 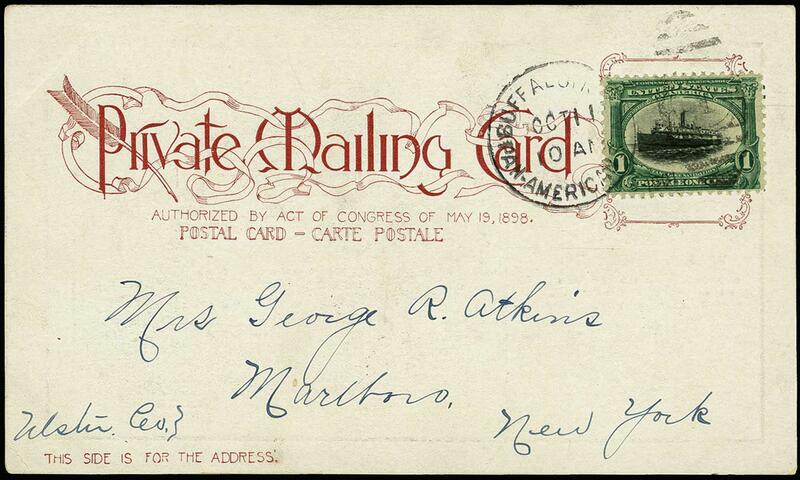 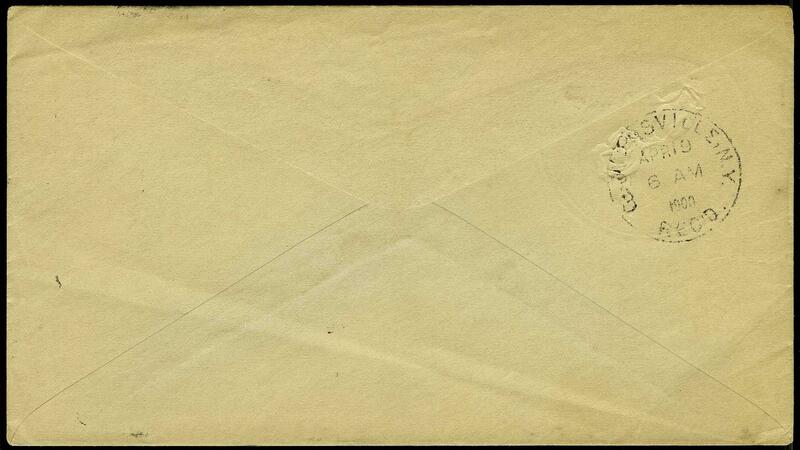 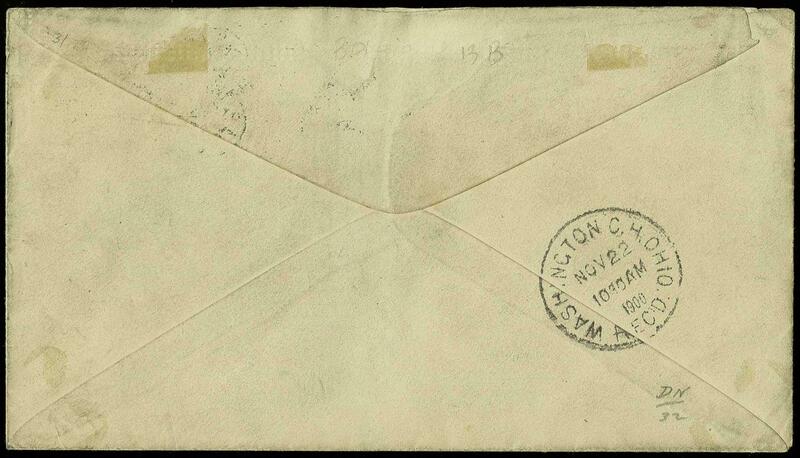 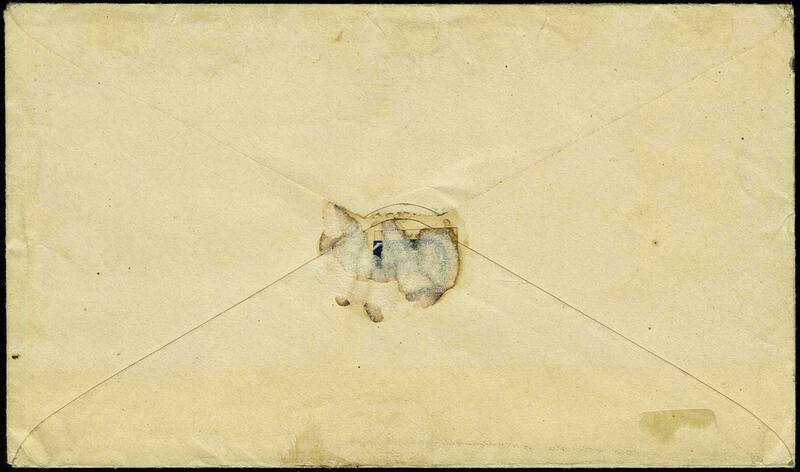 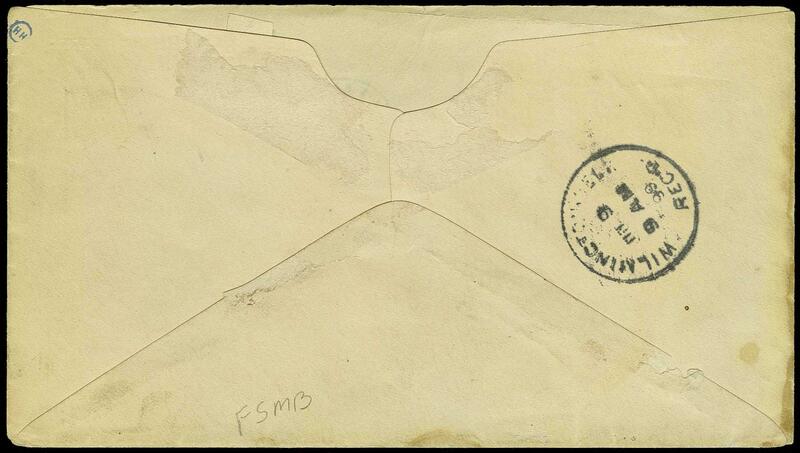 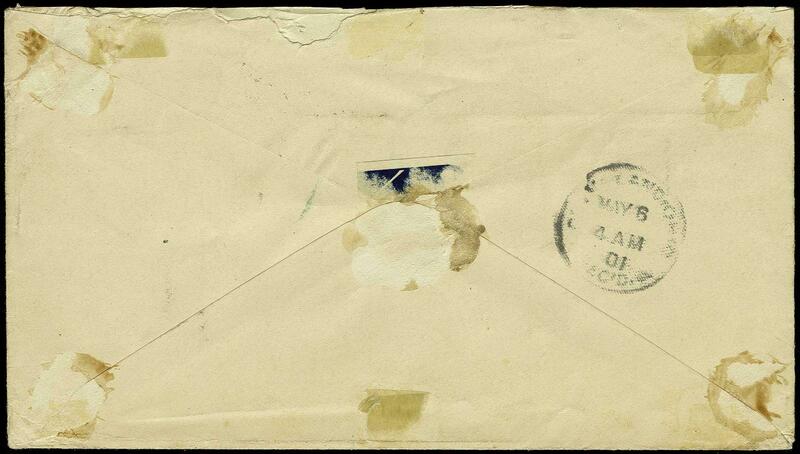 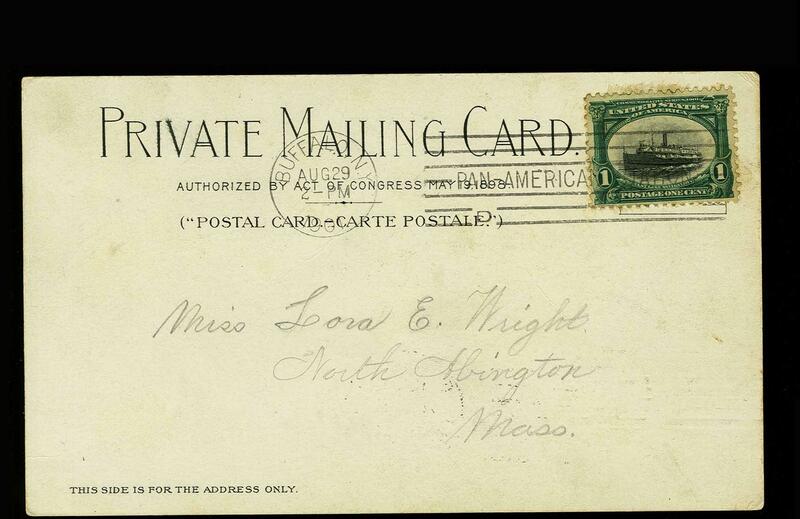 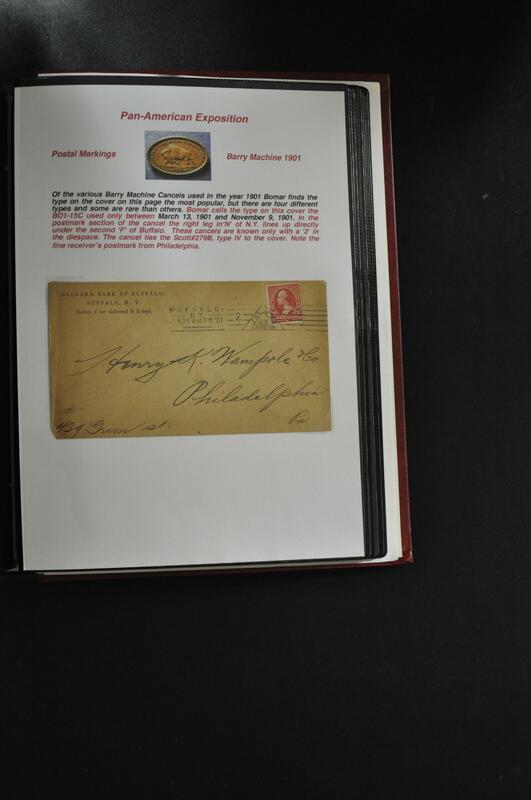 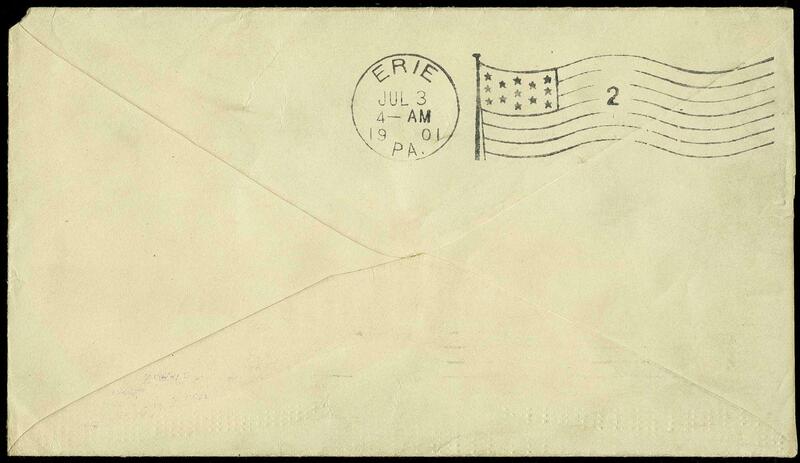 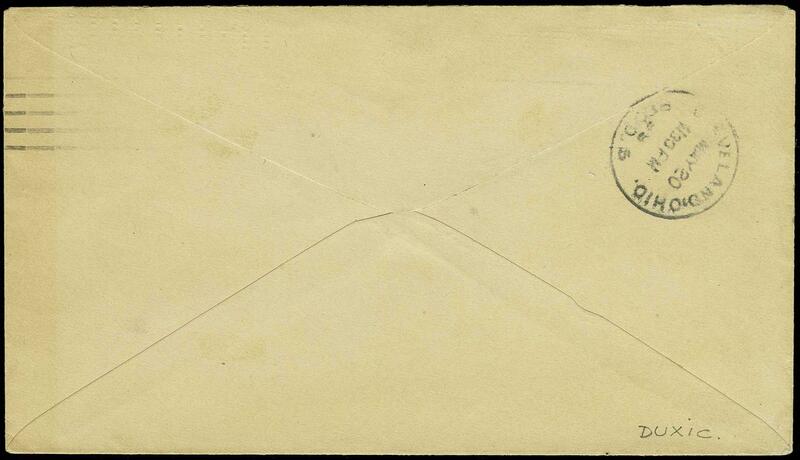 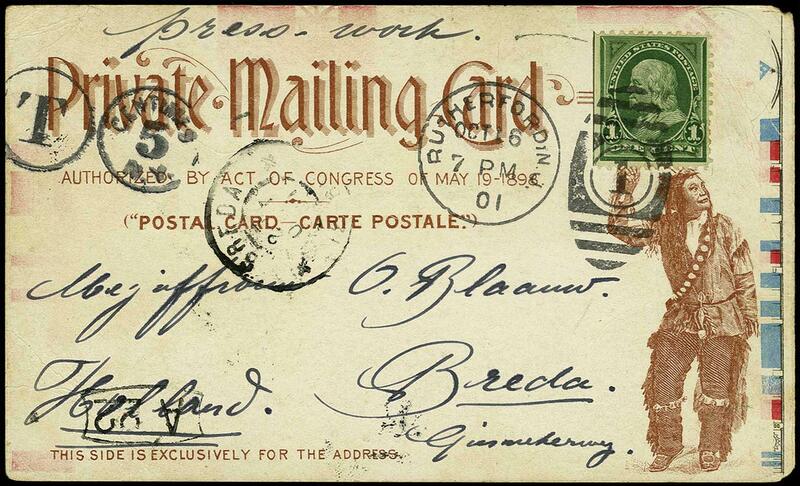 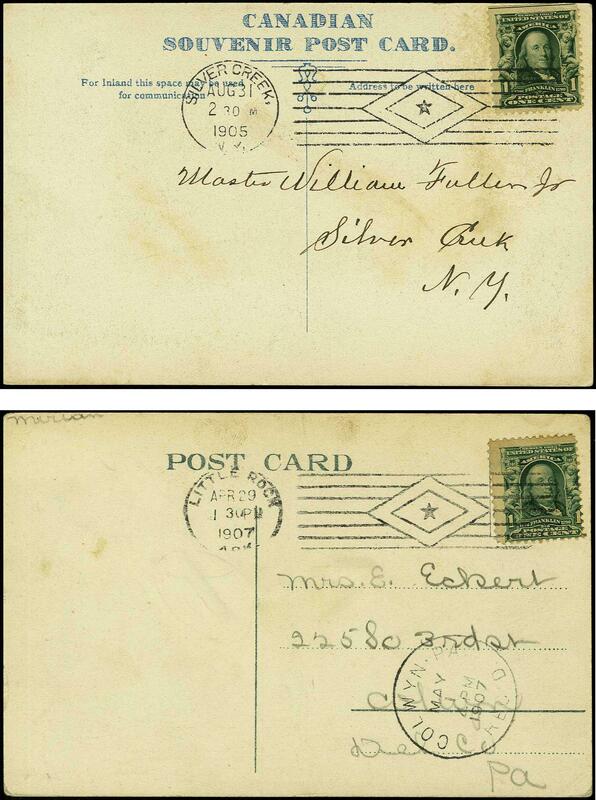 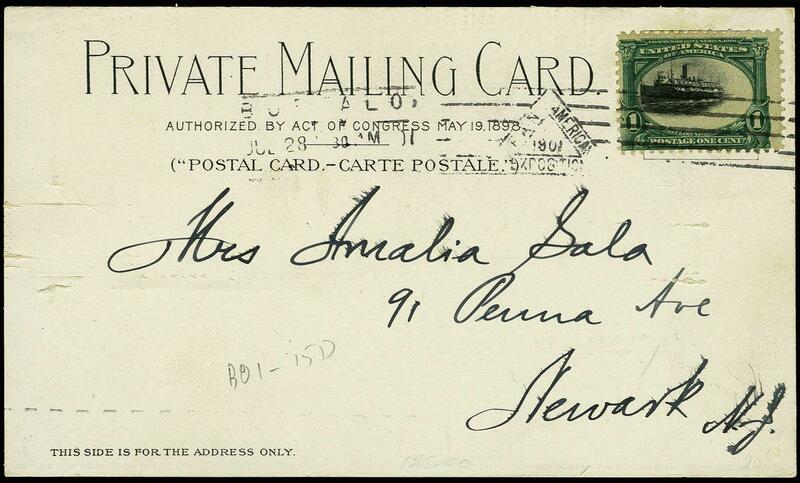 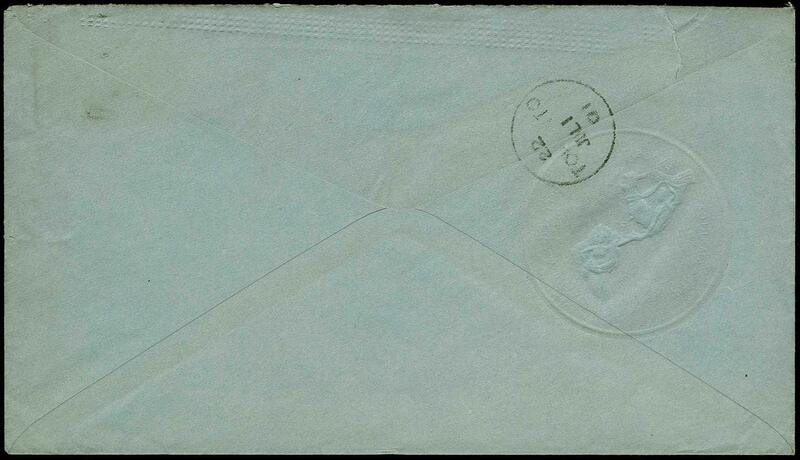 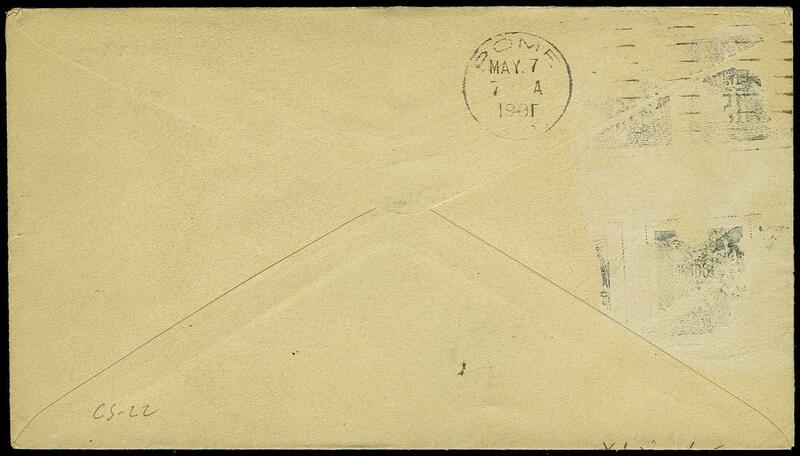 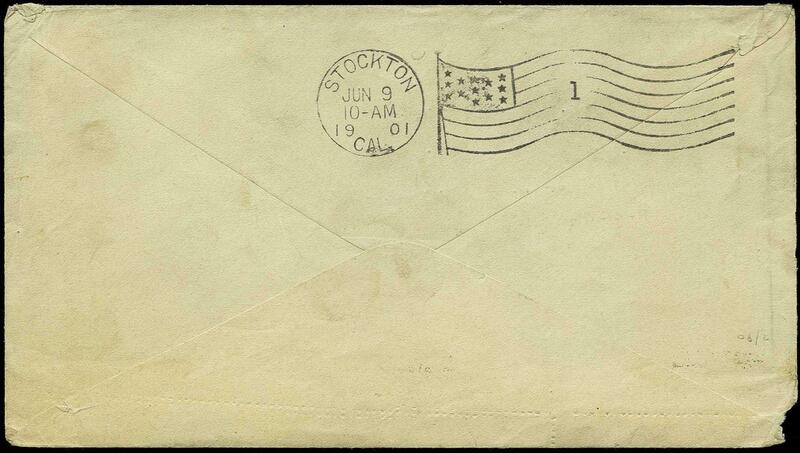 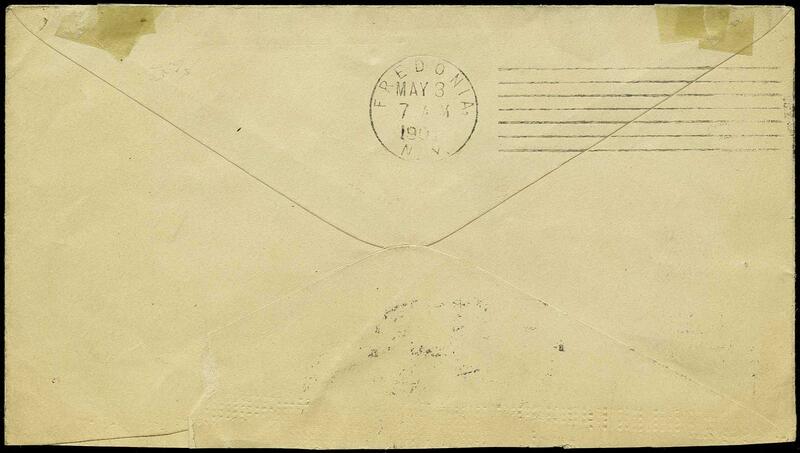 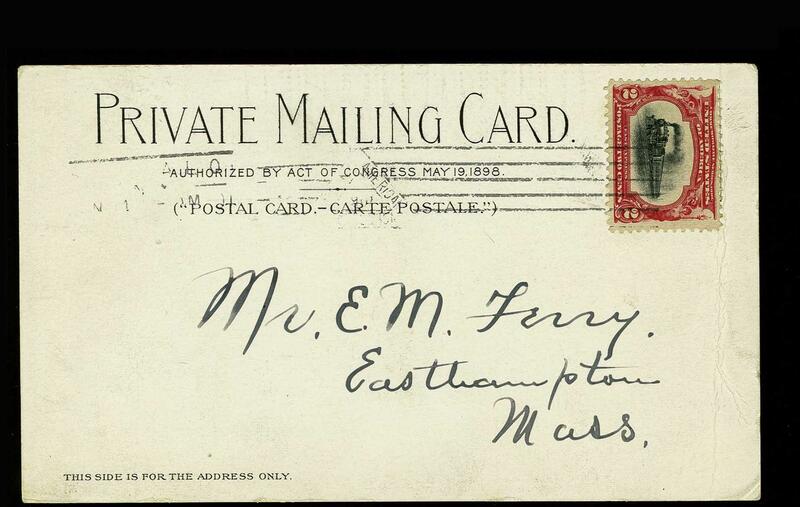 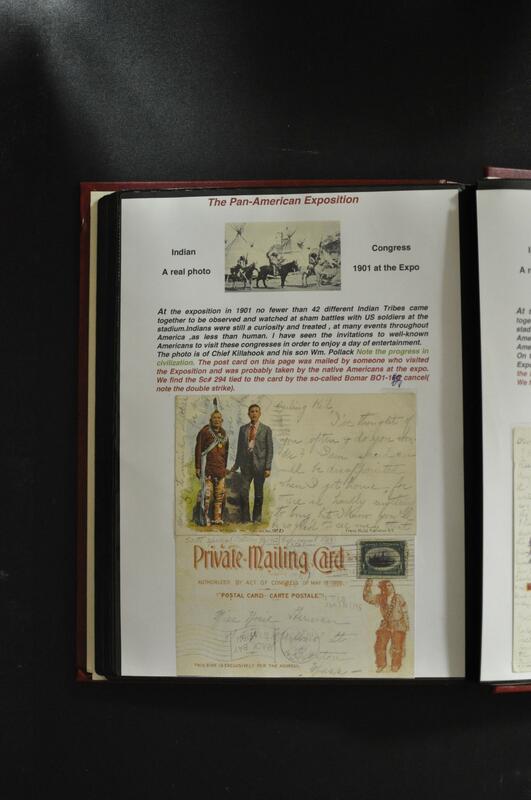 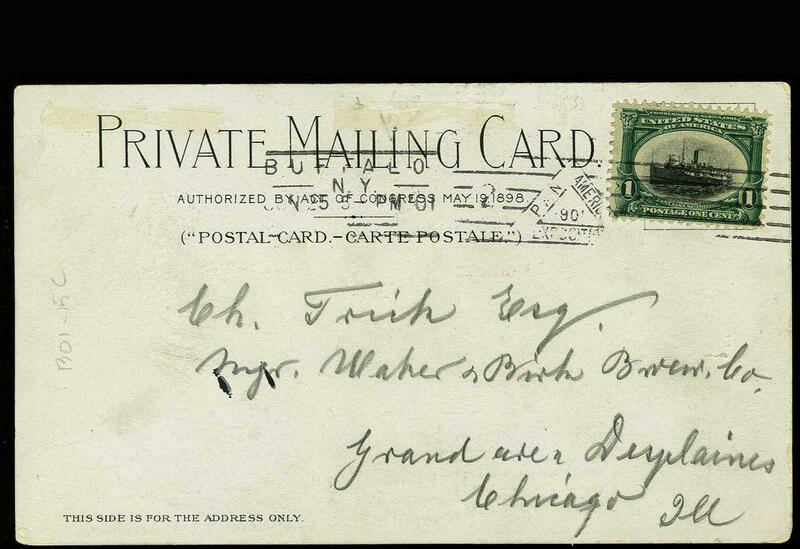 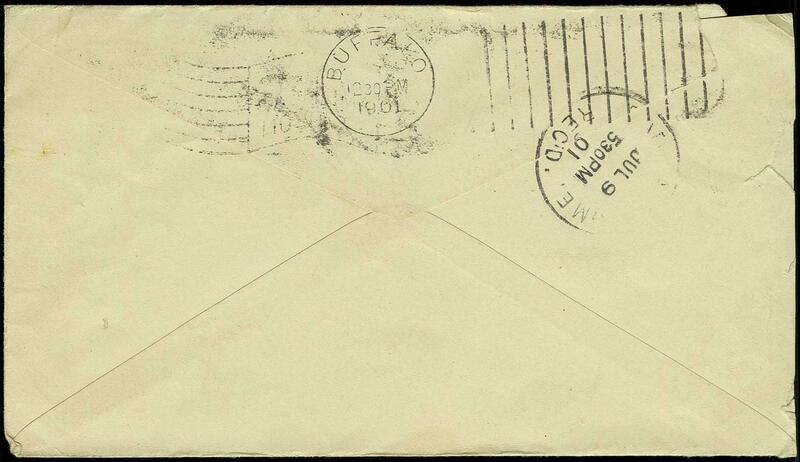 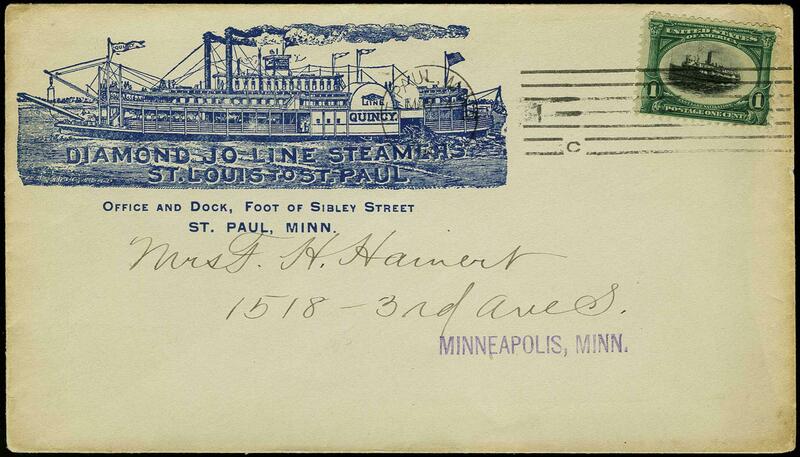 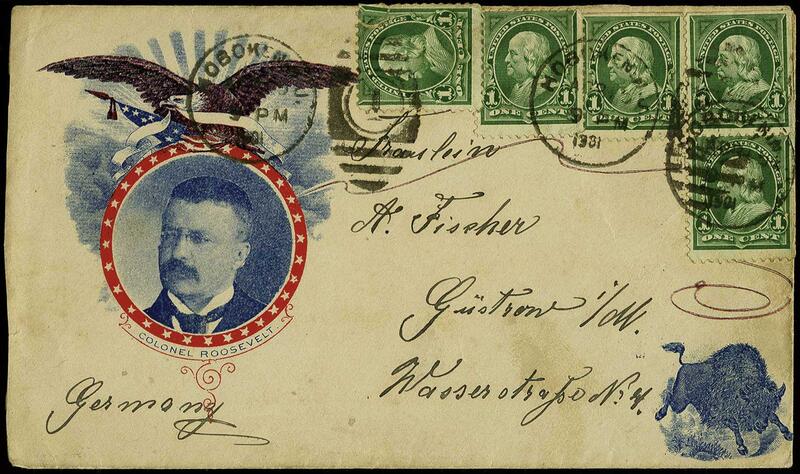 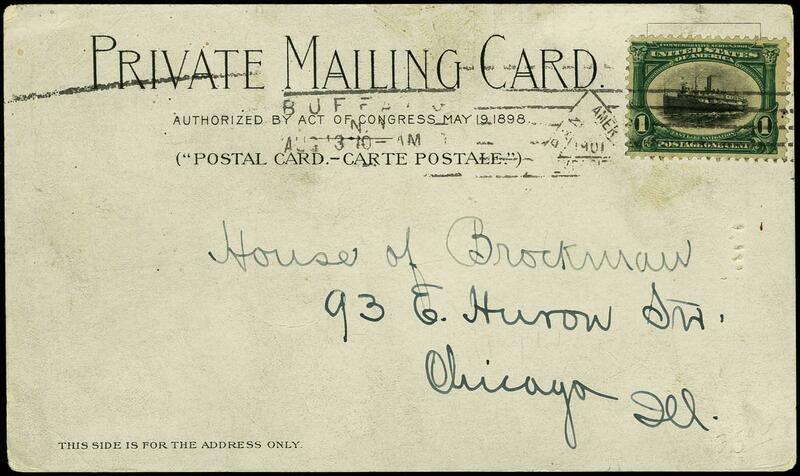 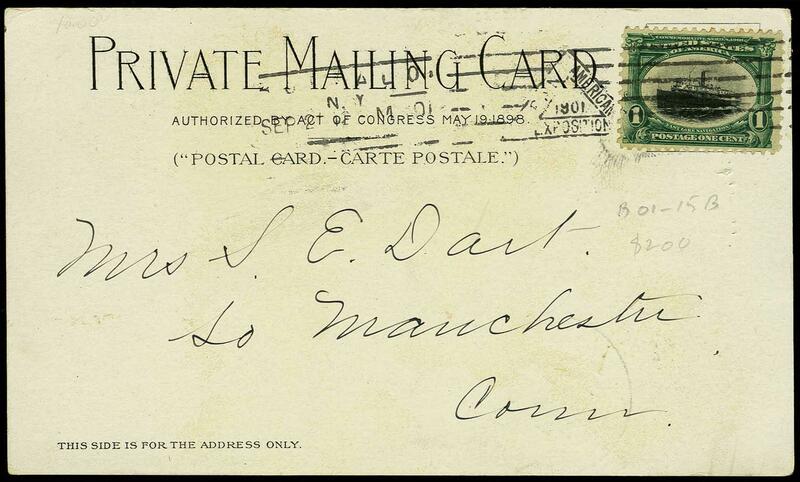 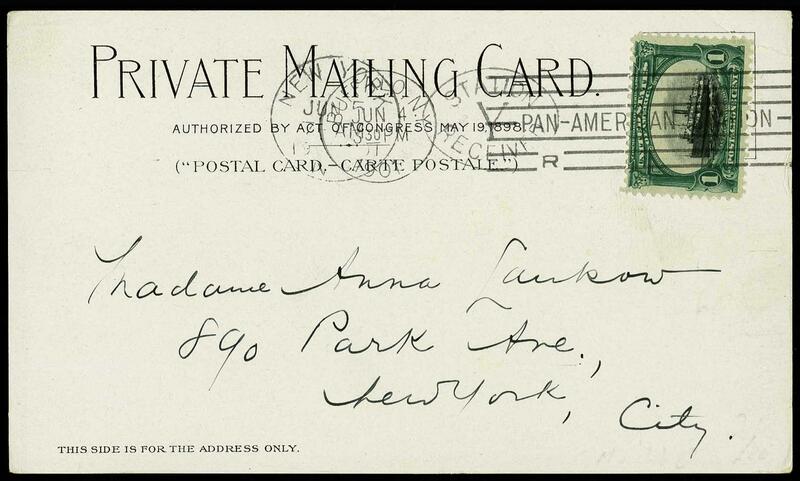 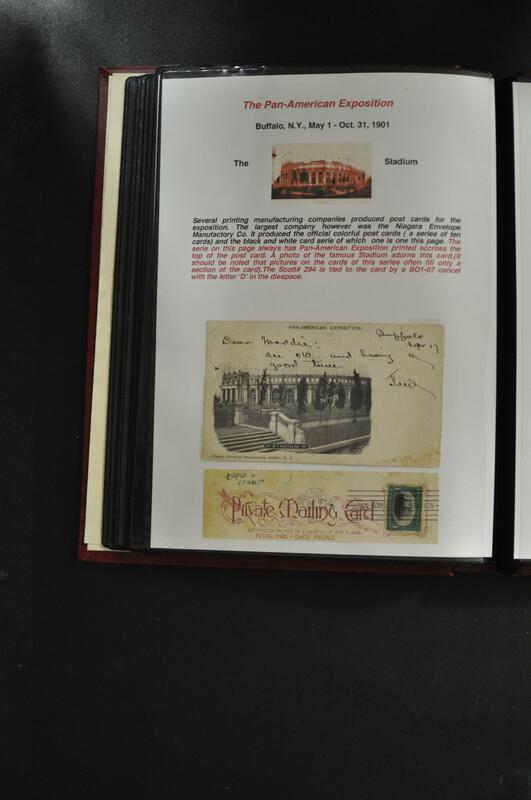 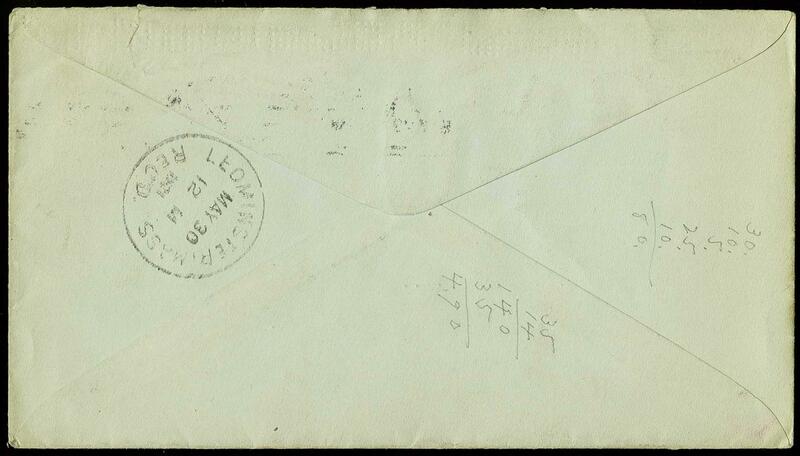 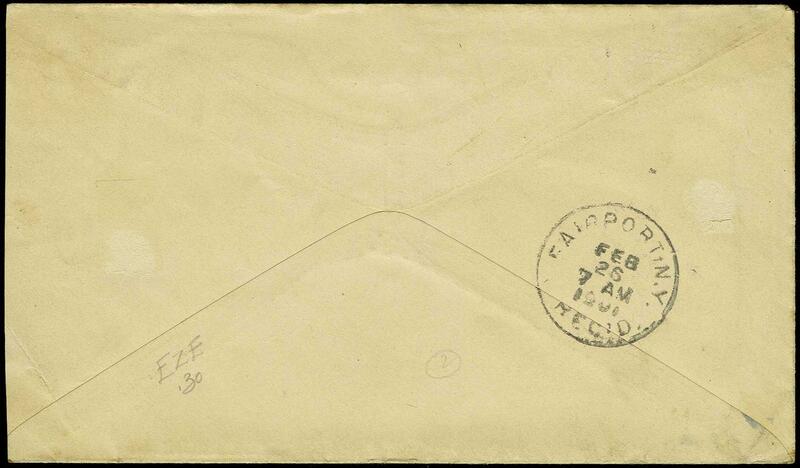 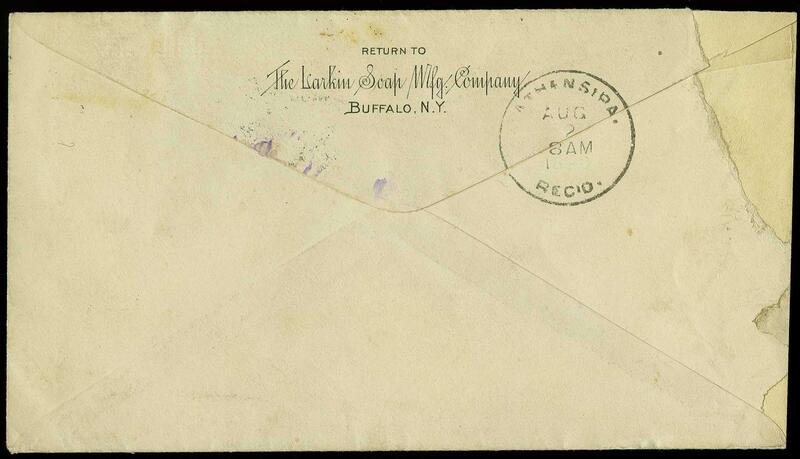 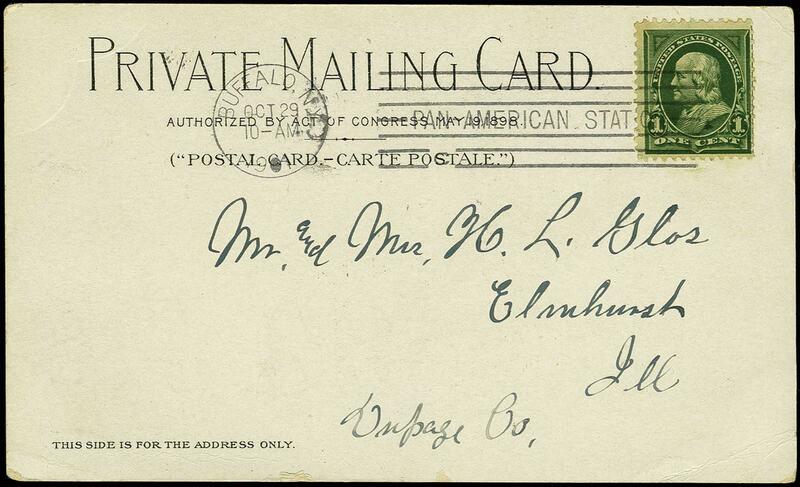 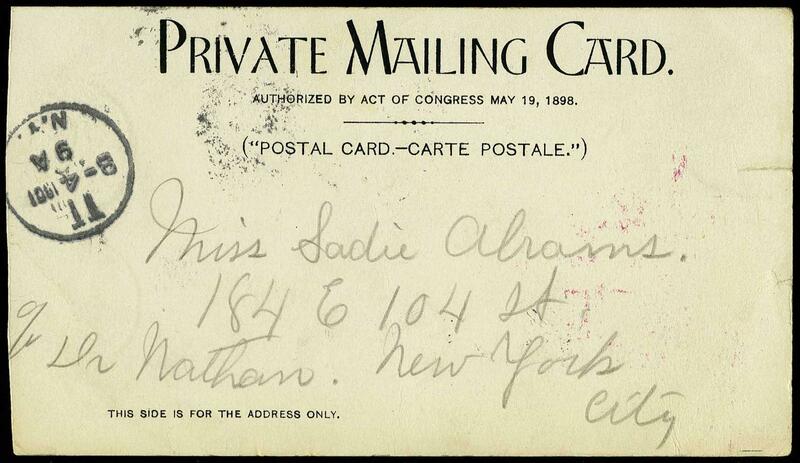 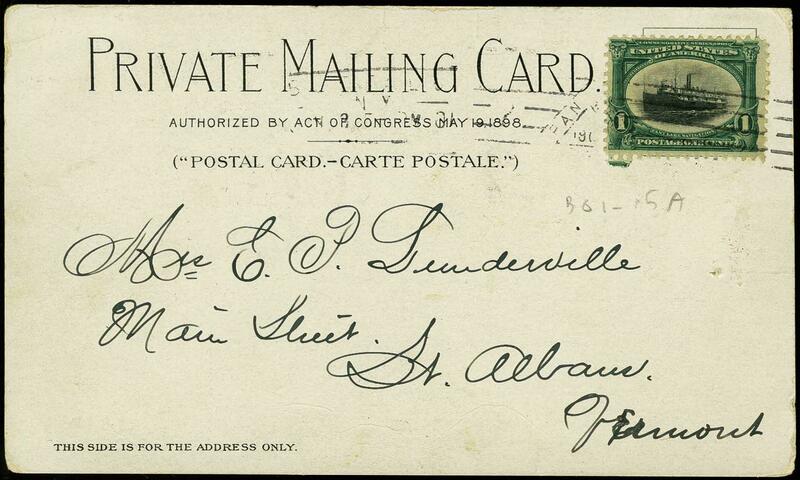 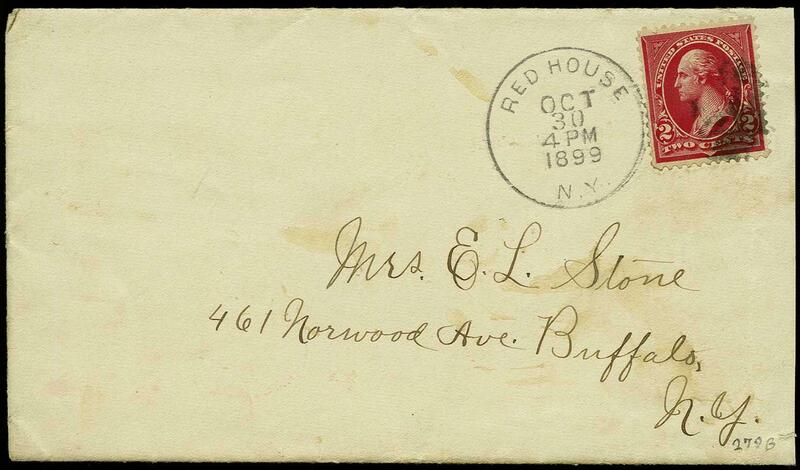 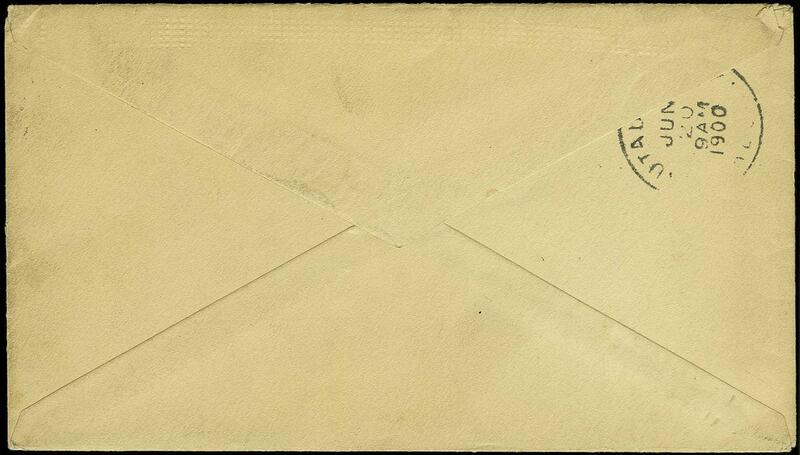 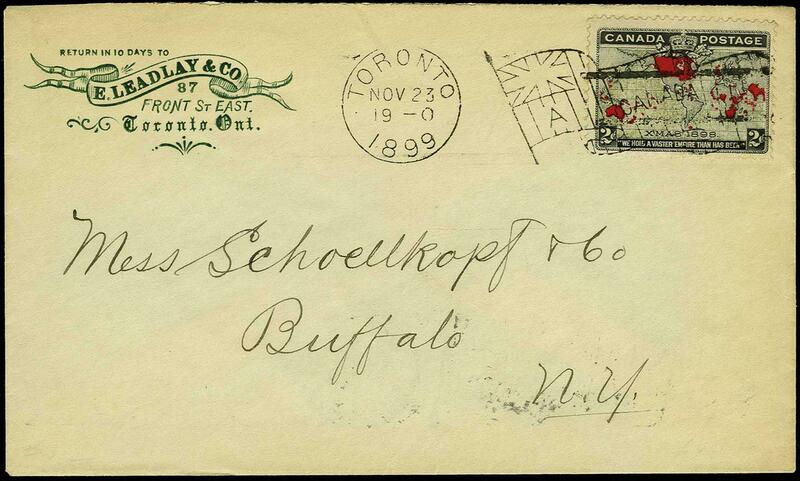 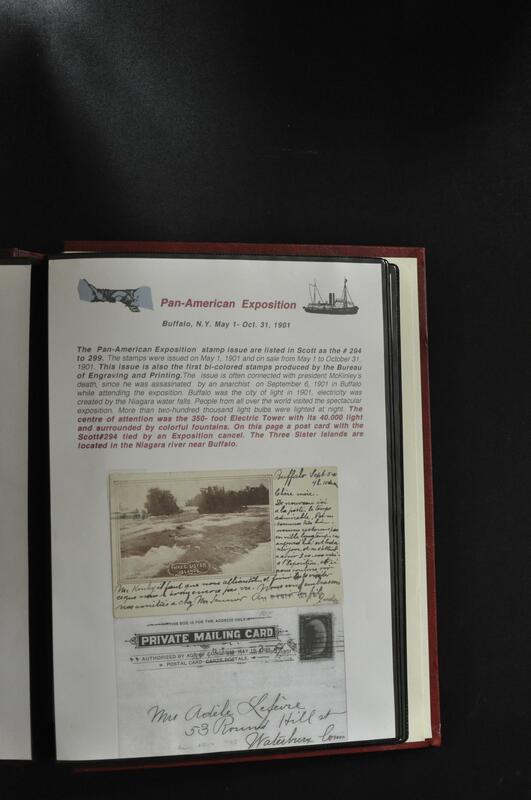 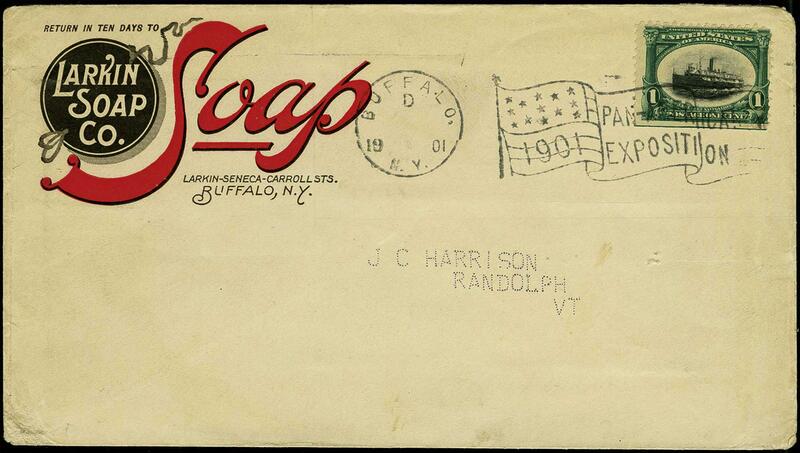 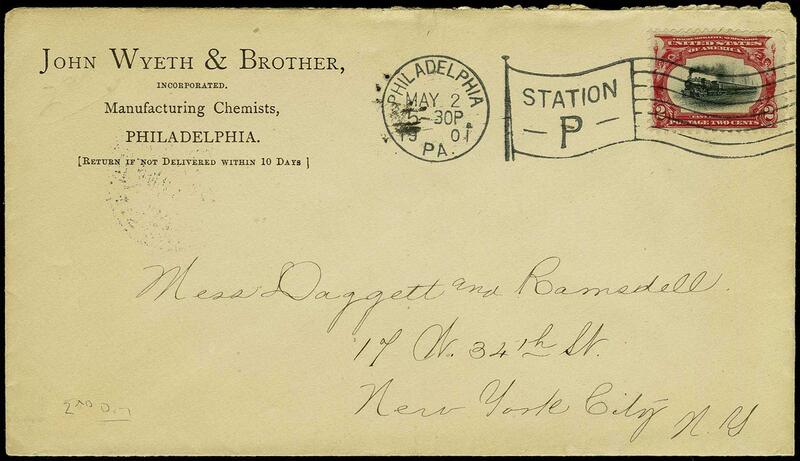 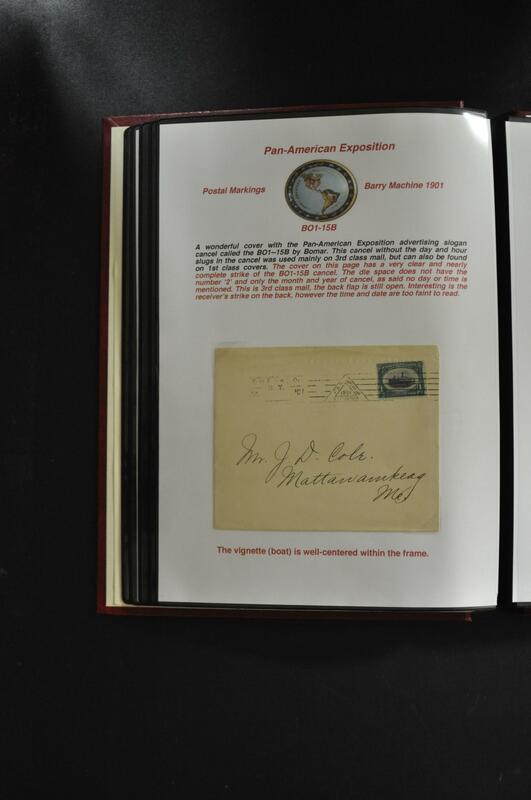 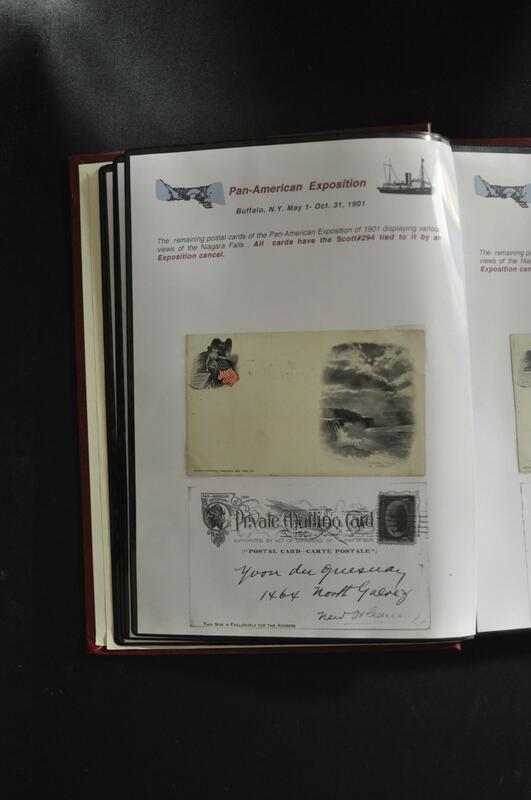 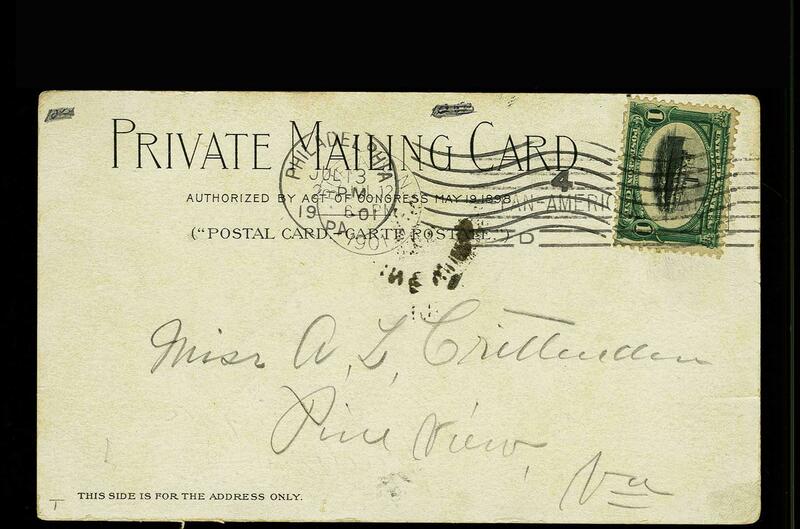 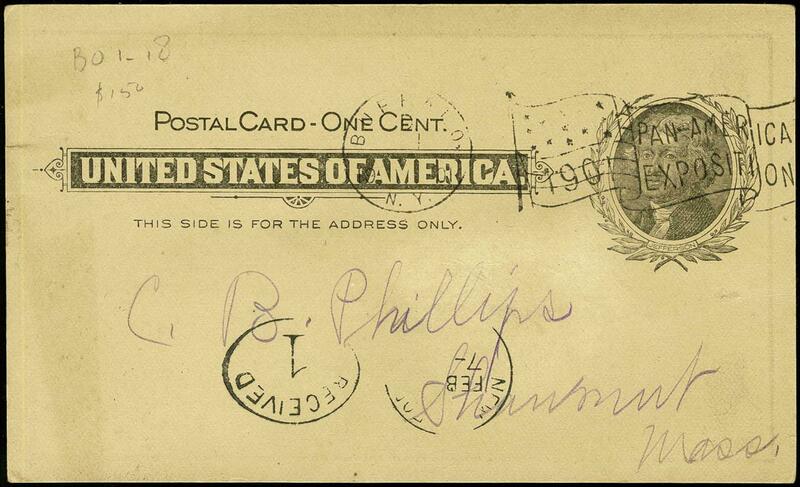 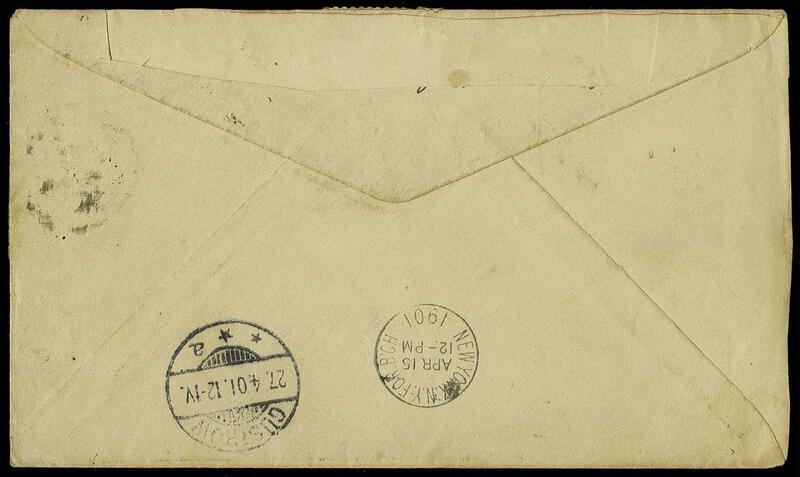 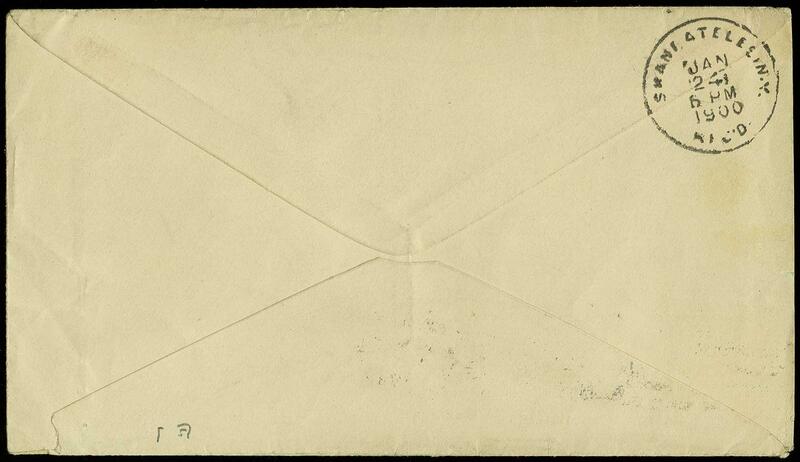 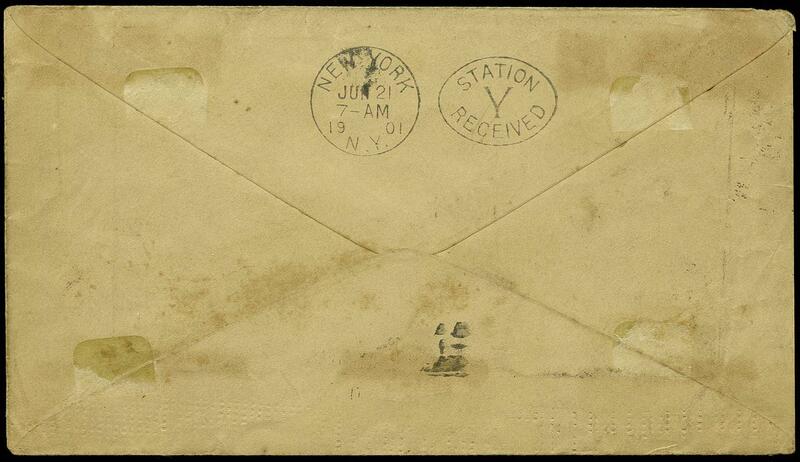 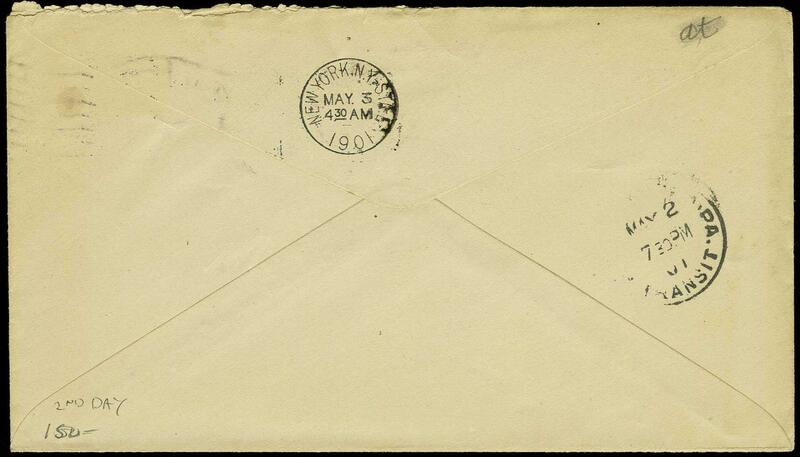 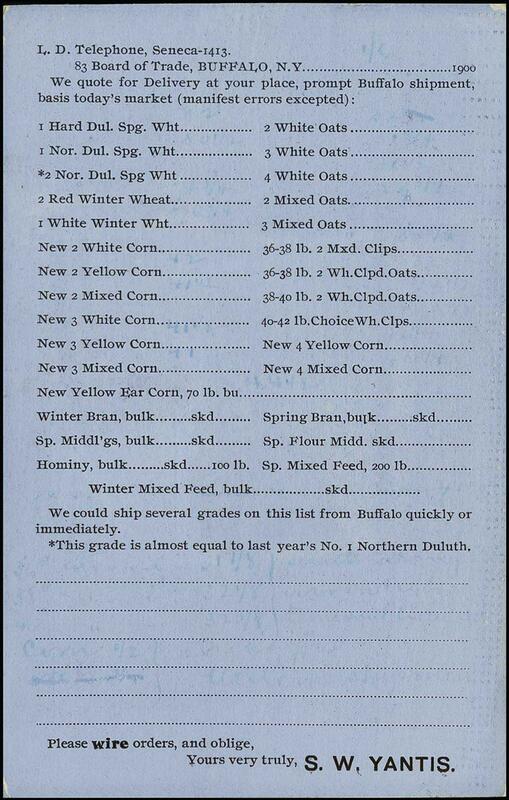 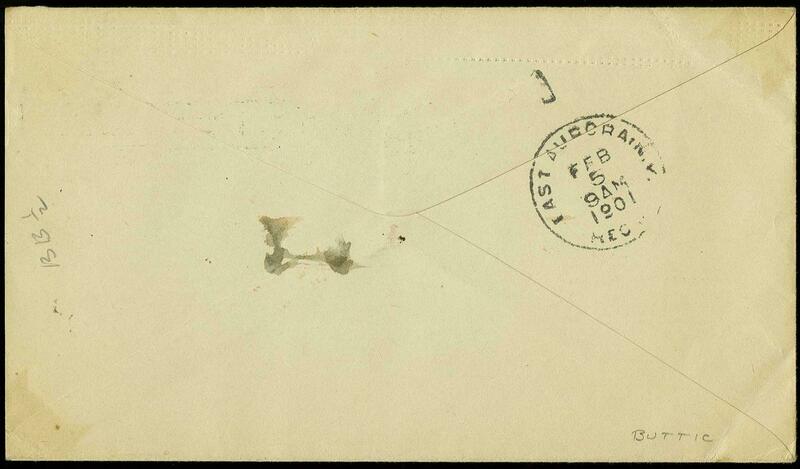 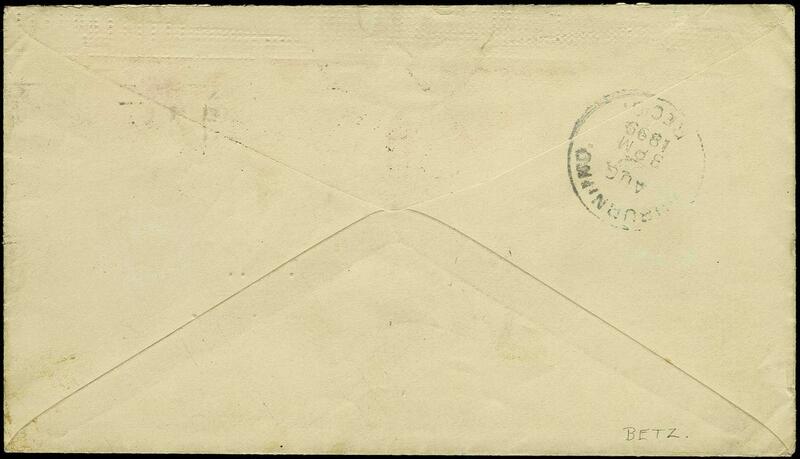 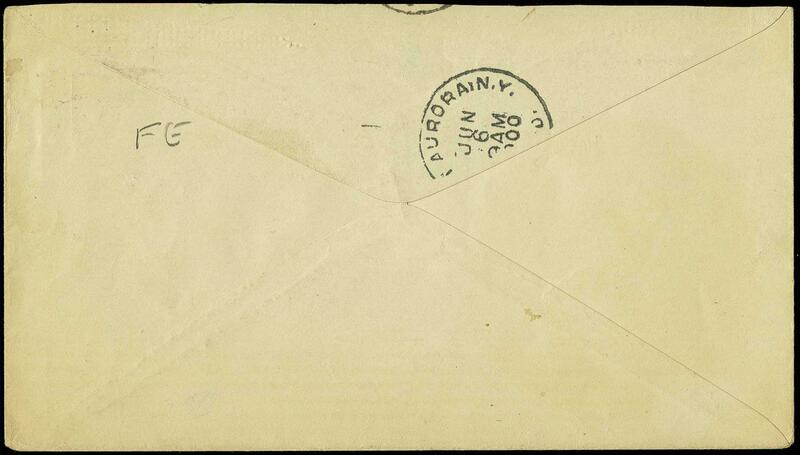 This is the first recorded example of this marking used on a third class mail cover and may be the only recorded example, there are approximately 20 examples used on first class mail. 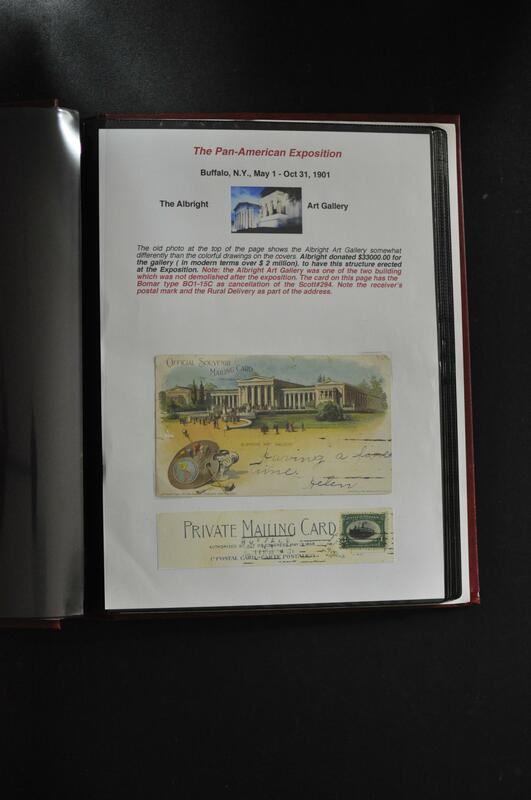 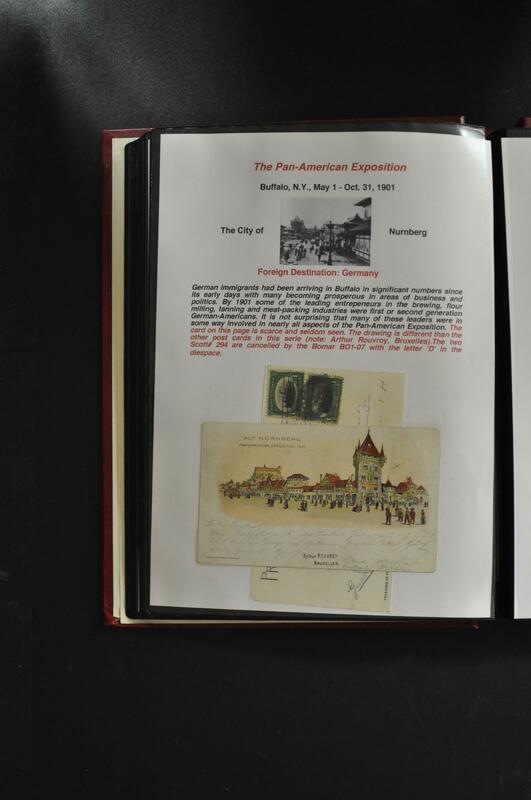 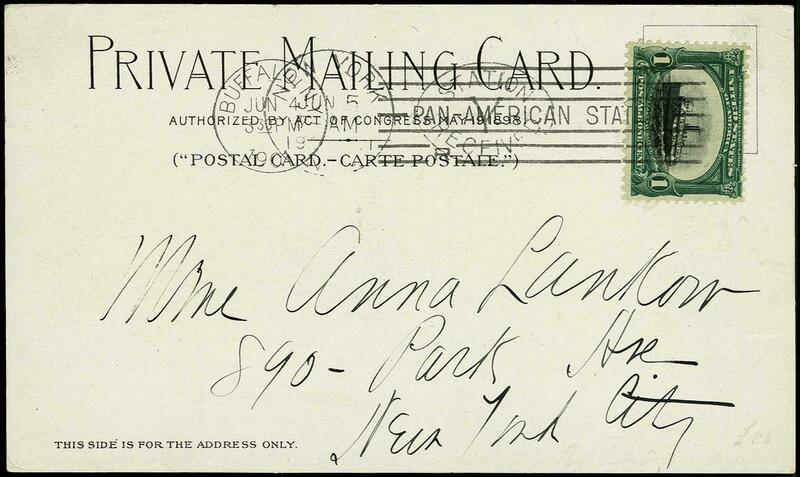 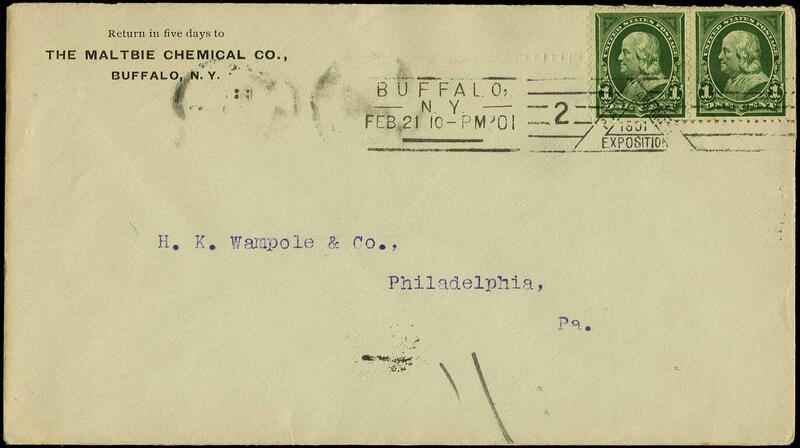 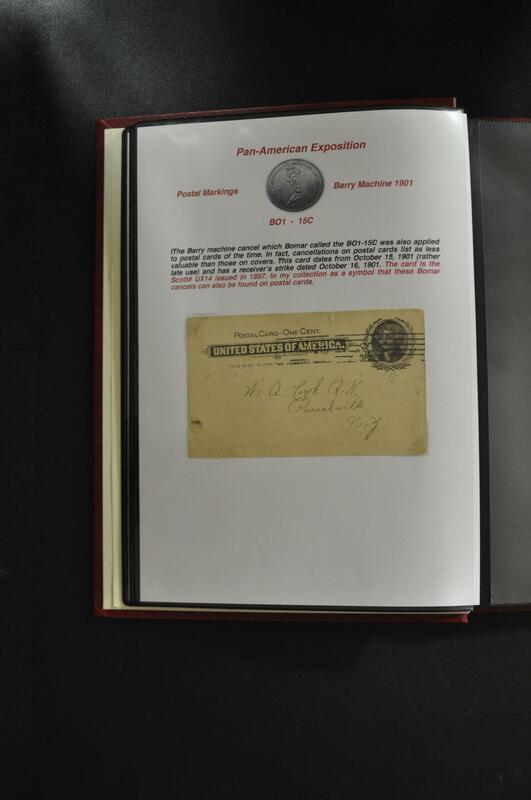 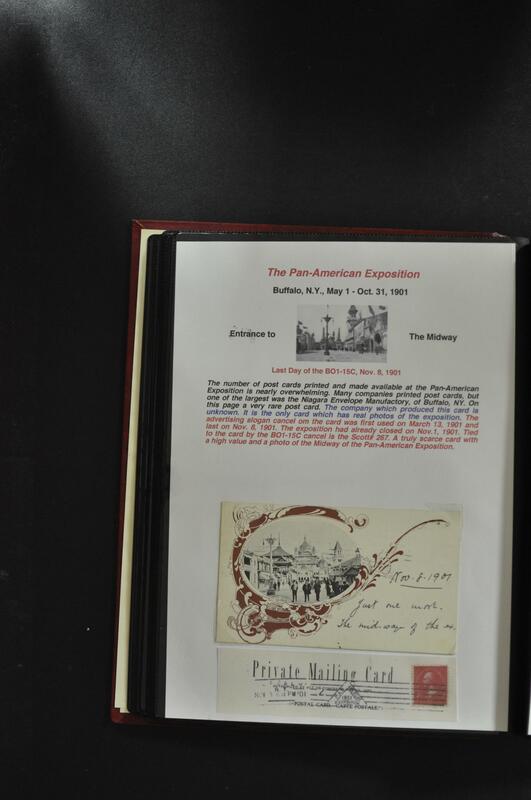 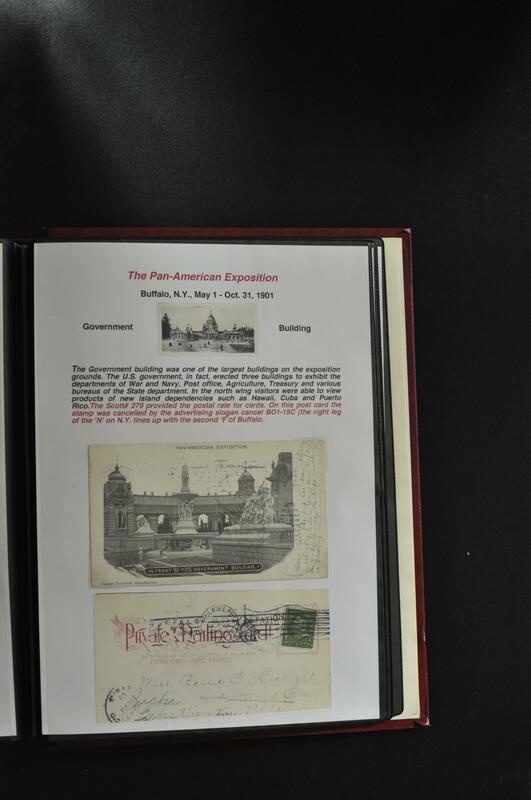 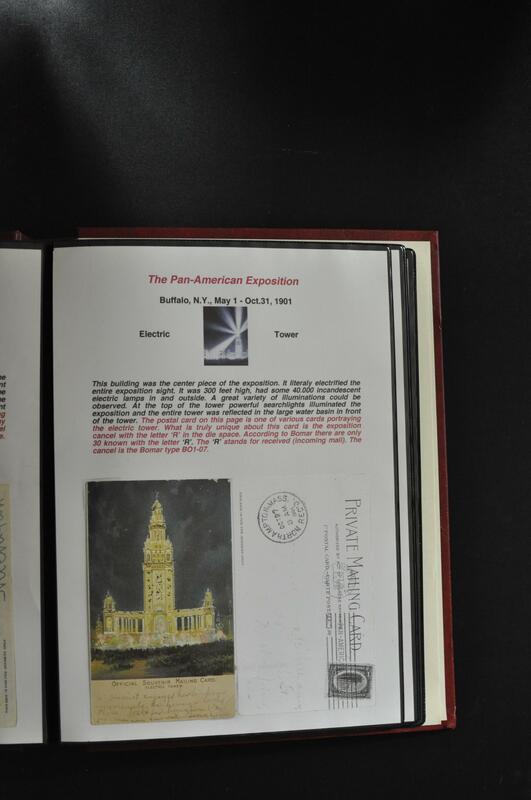 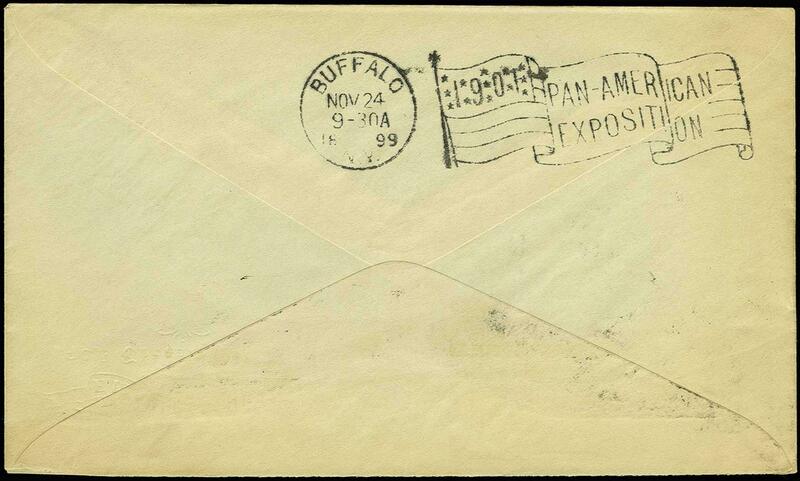 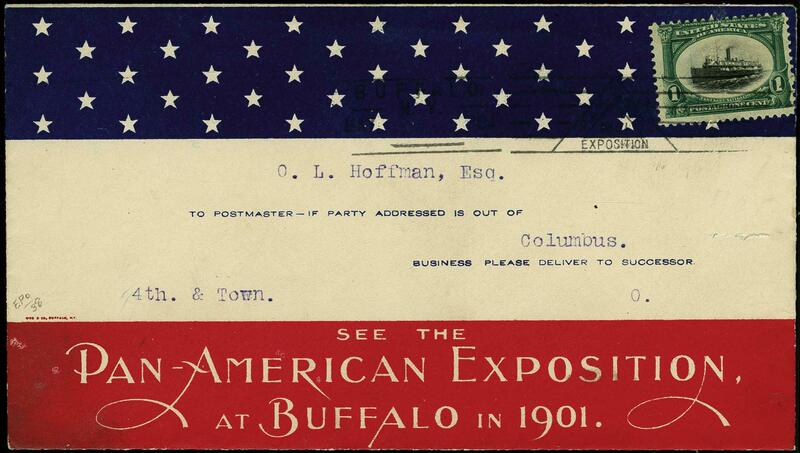 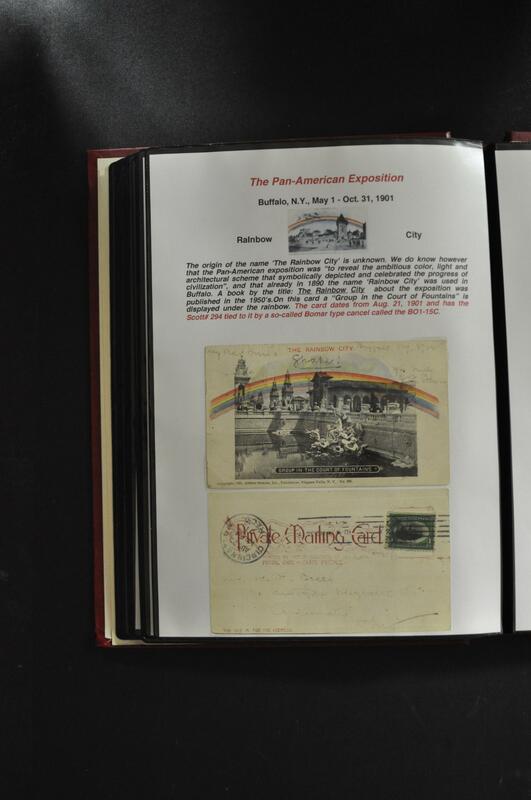 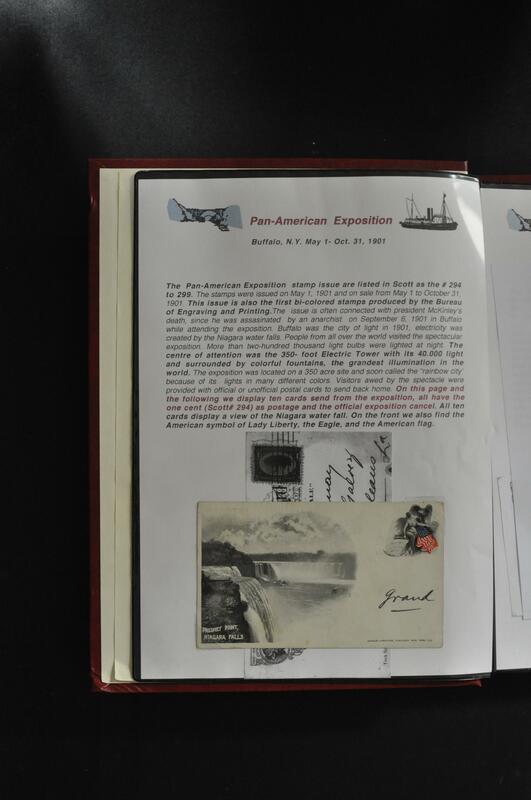 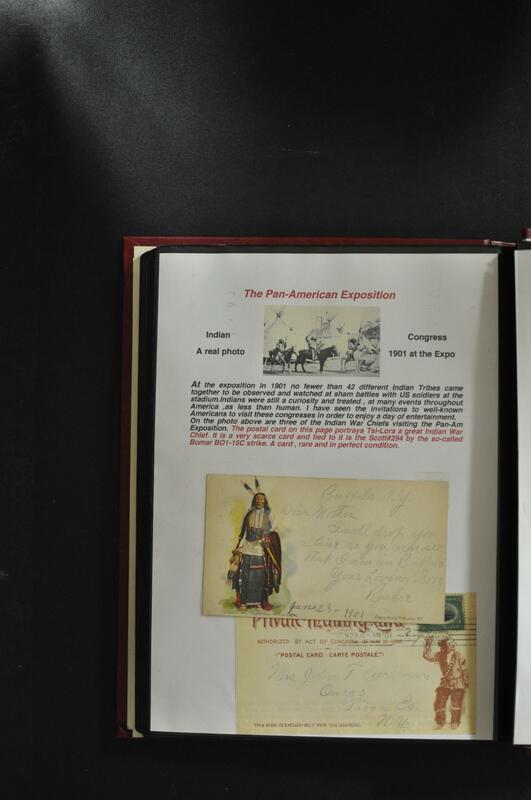 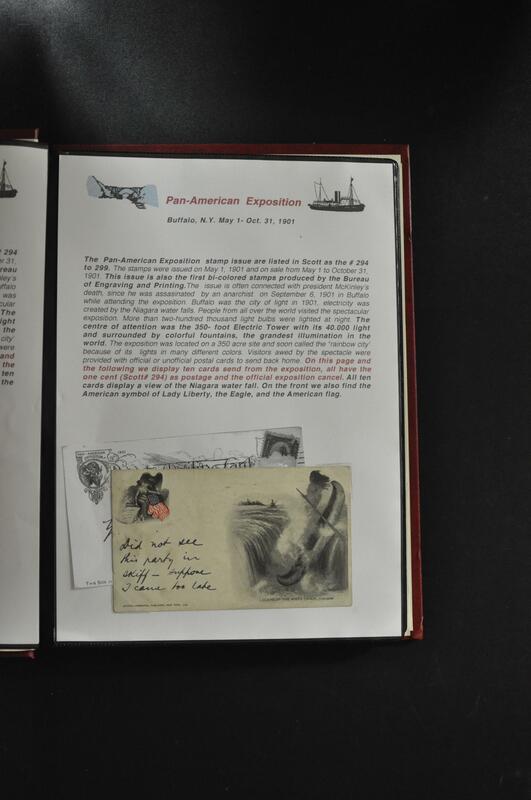 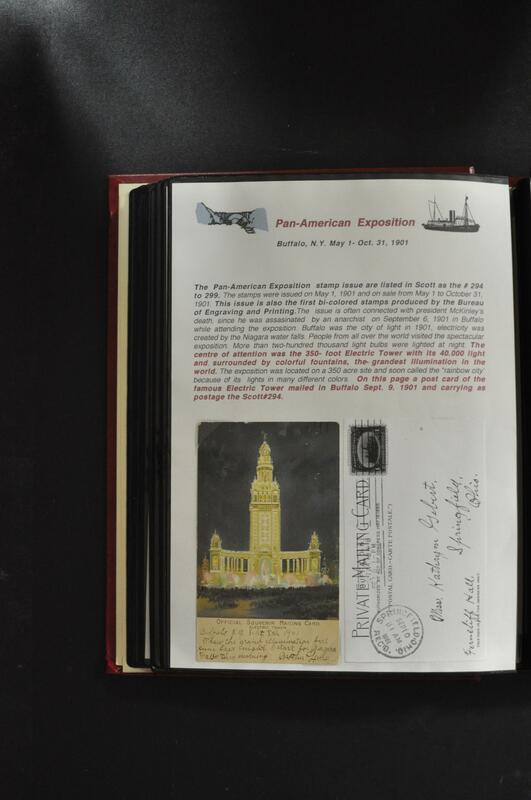 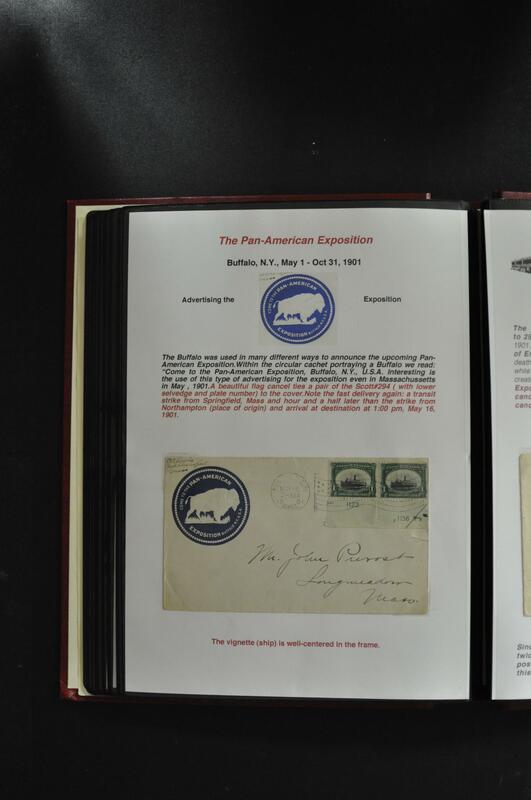 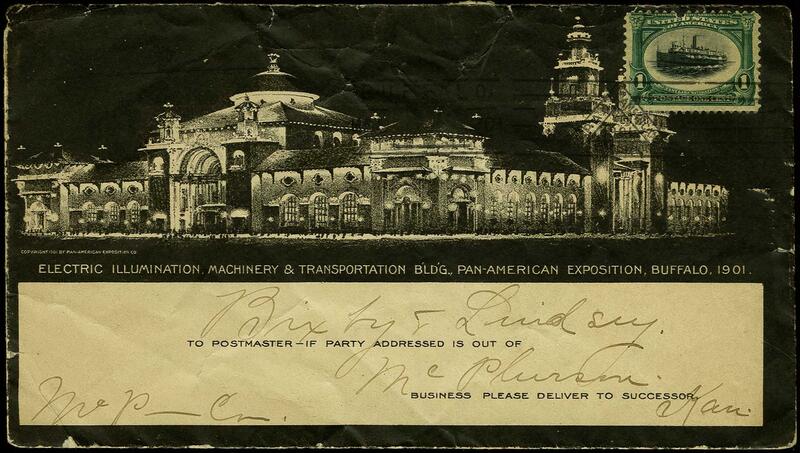 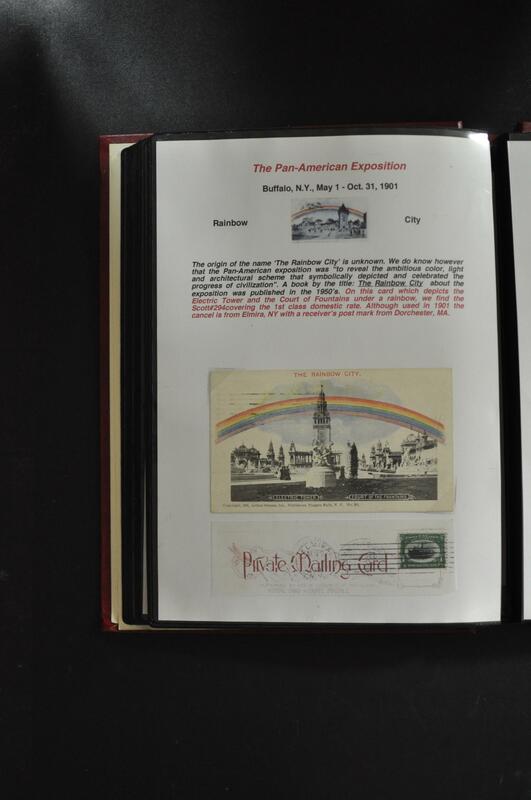 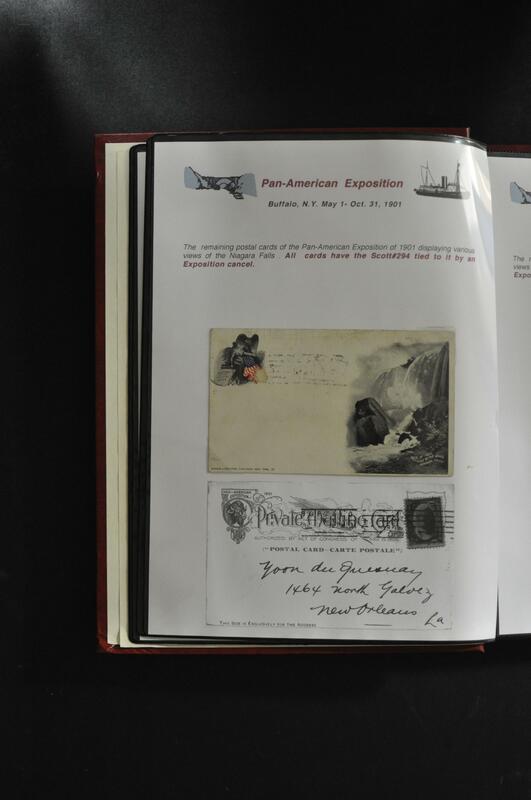 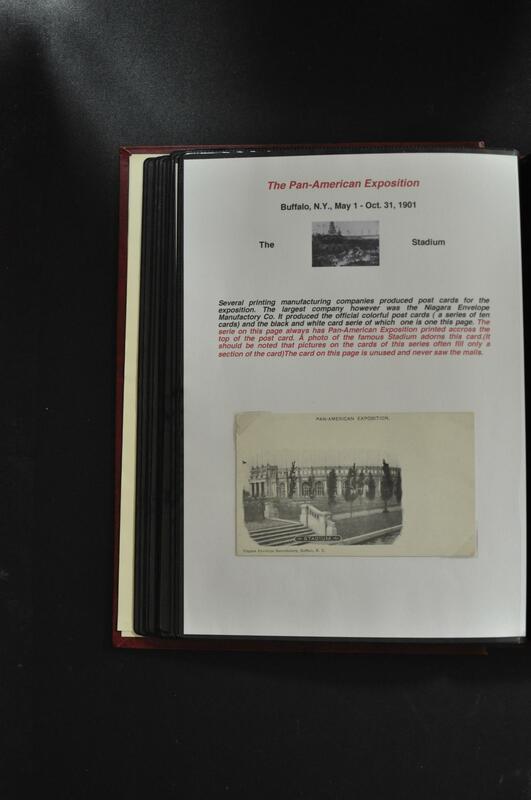 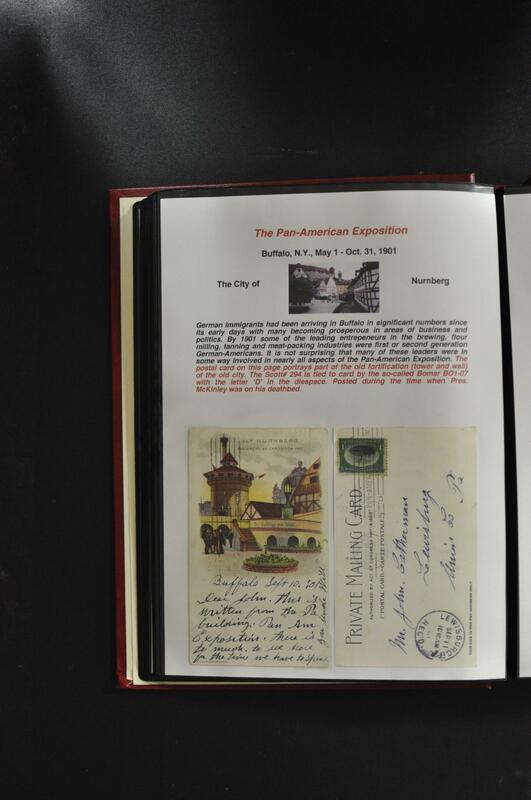 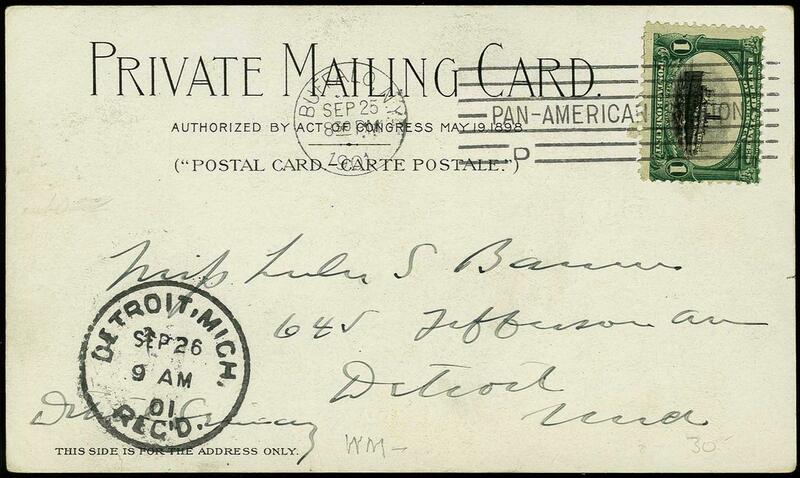 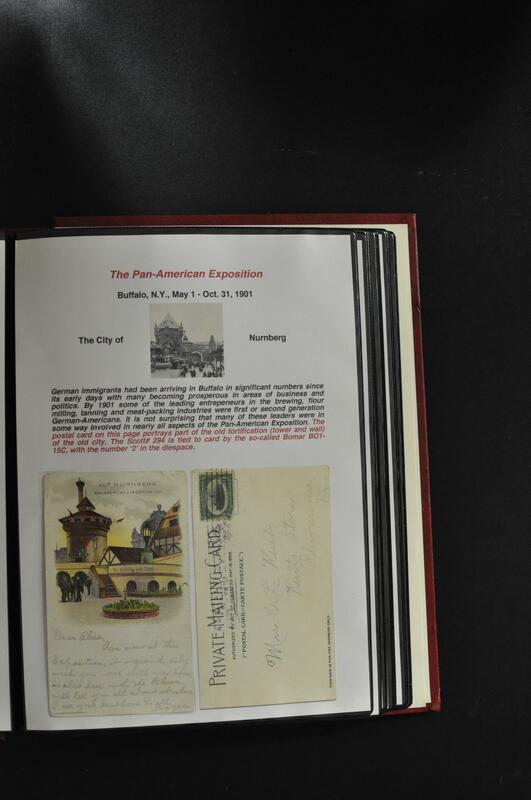 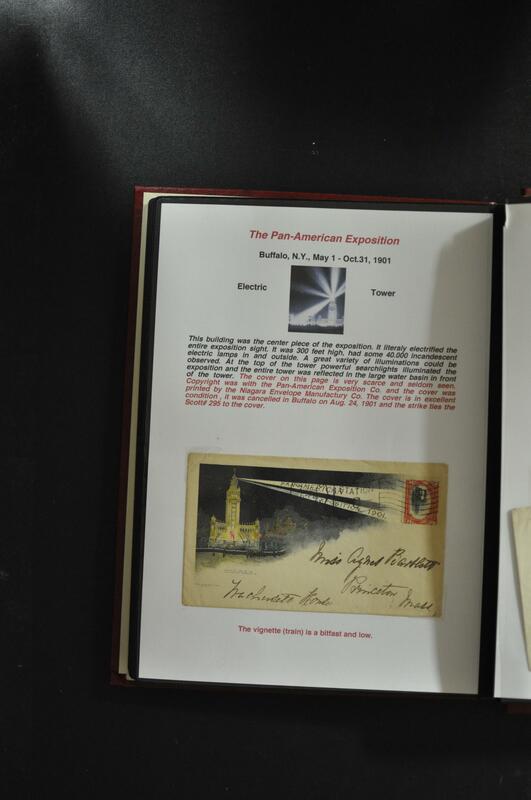 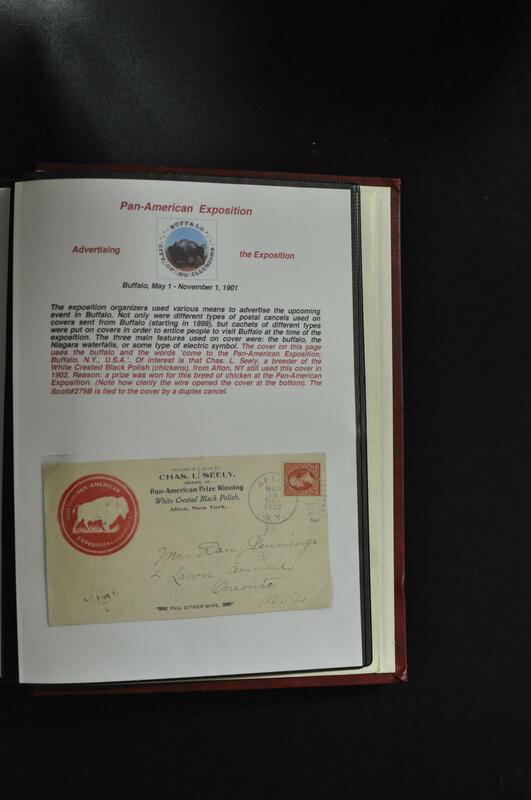 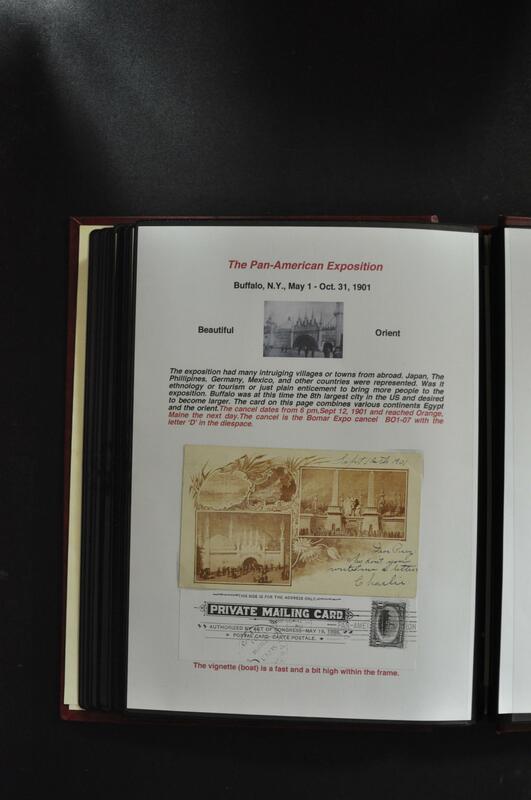 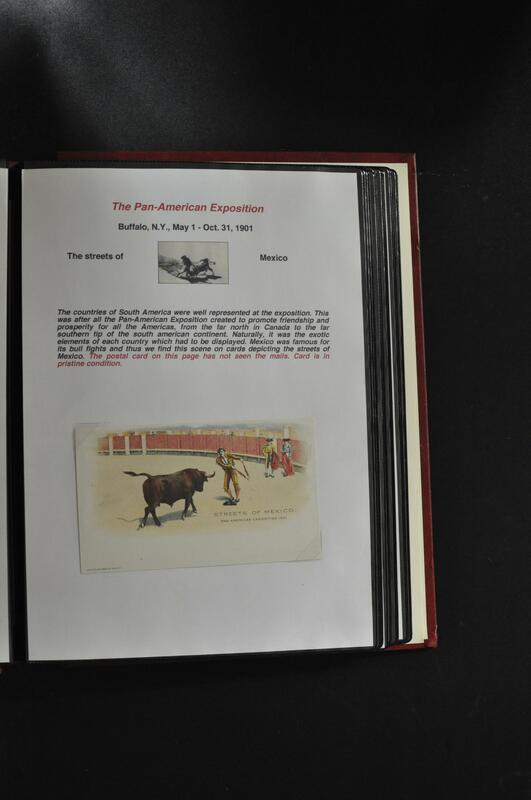 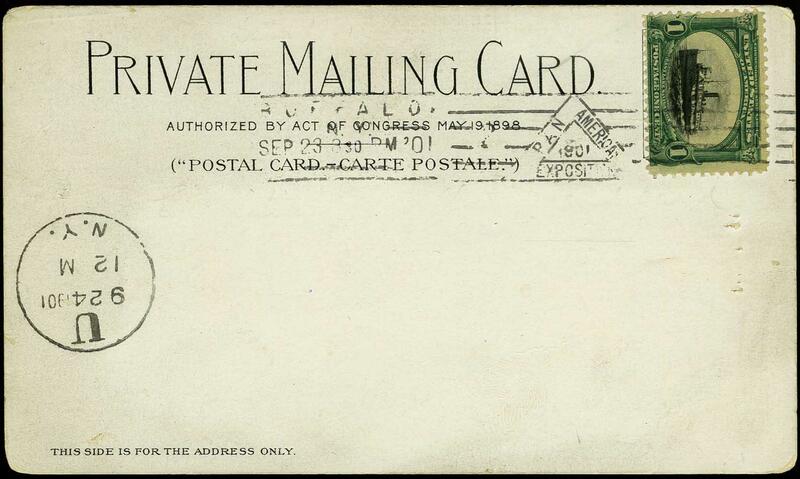 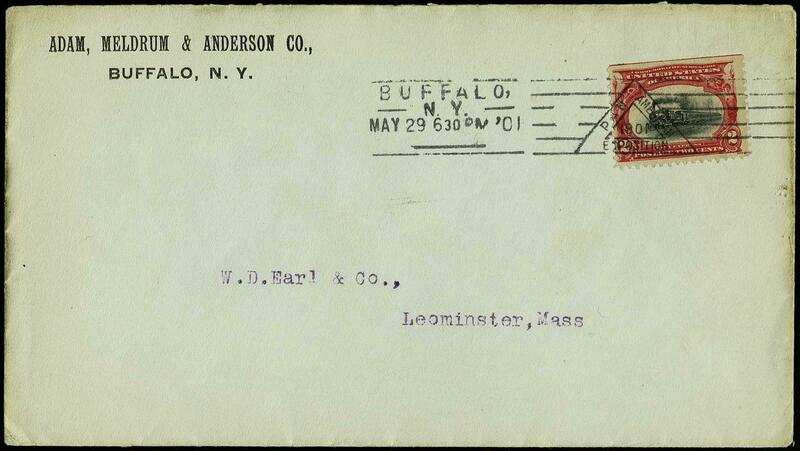 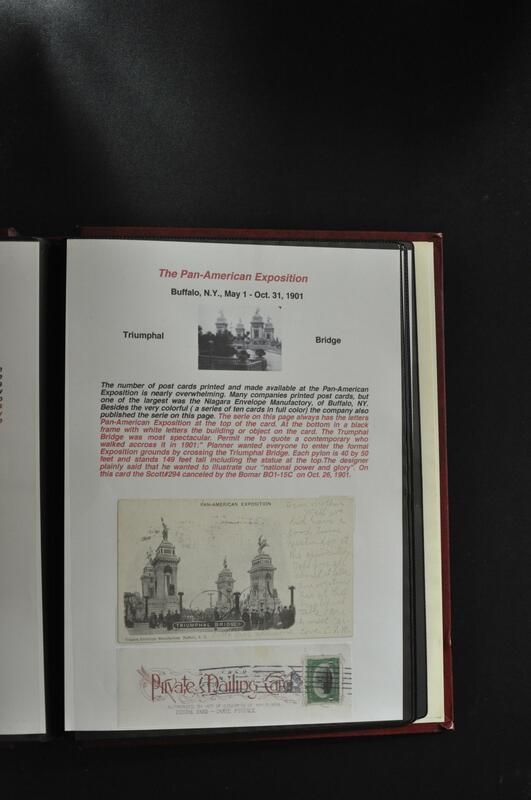 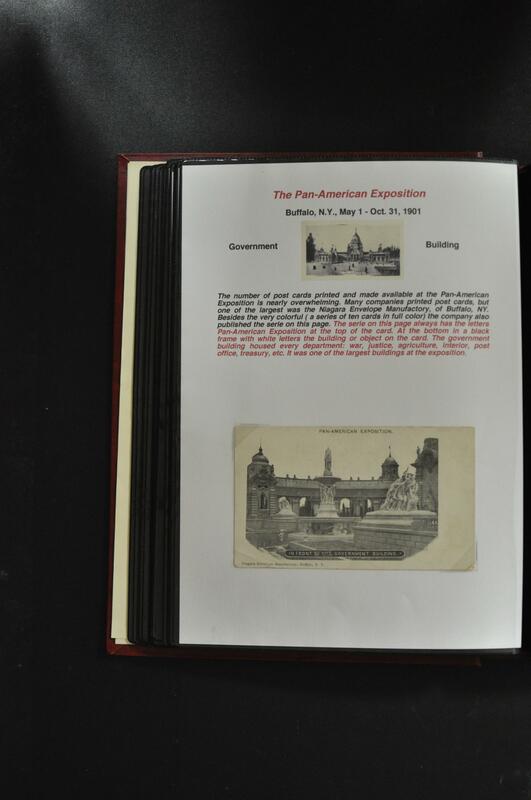 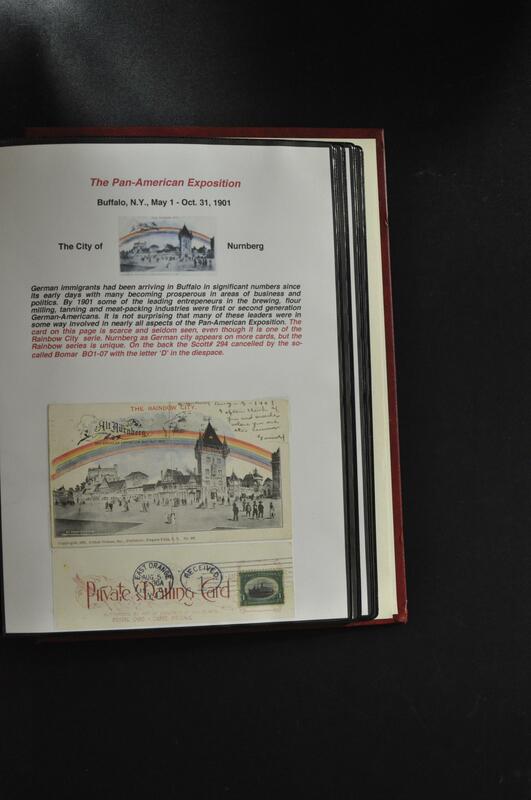 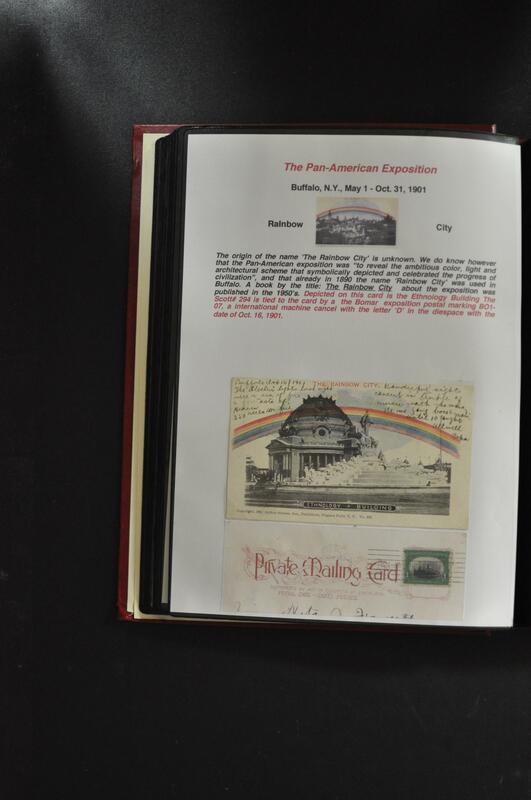 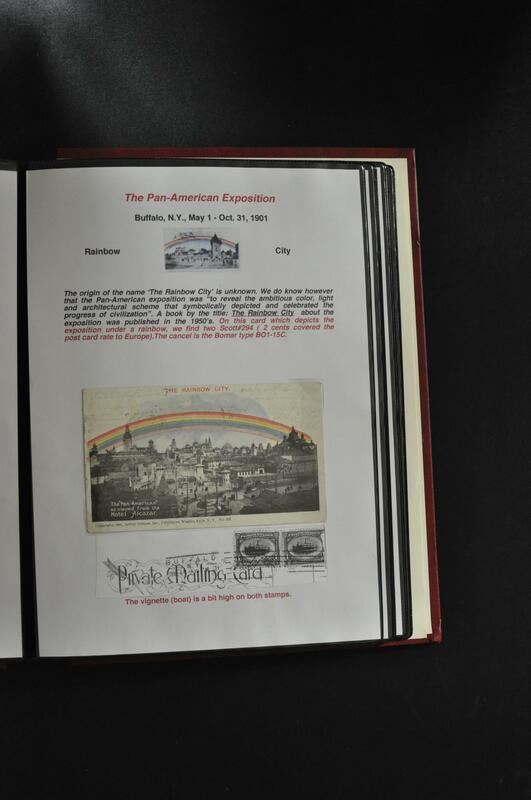 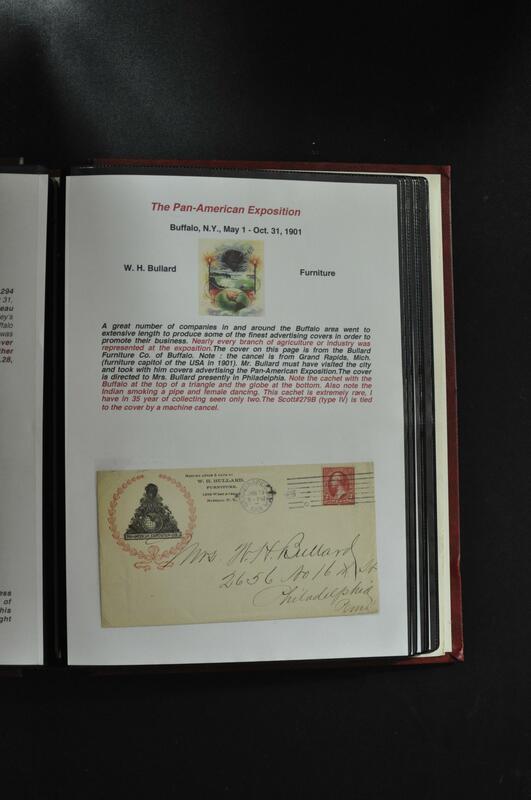 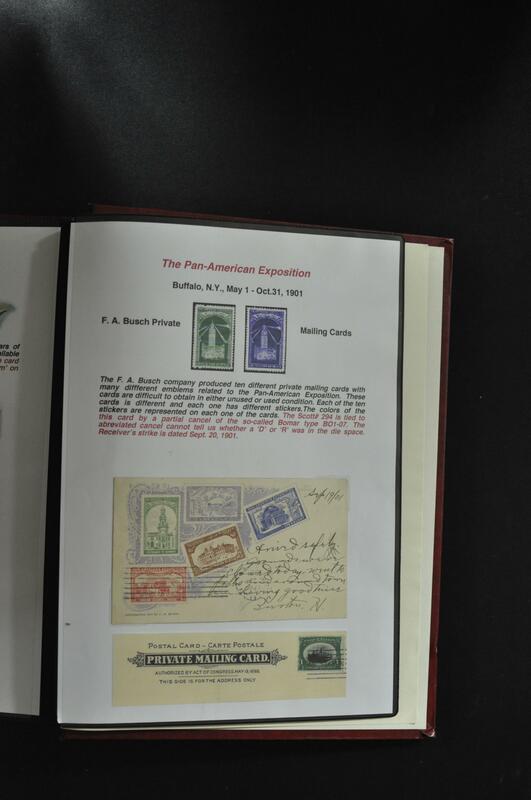 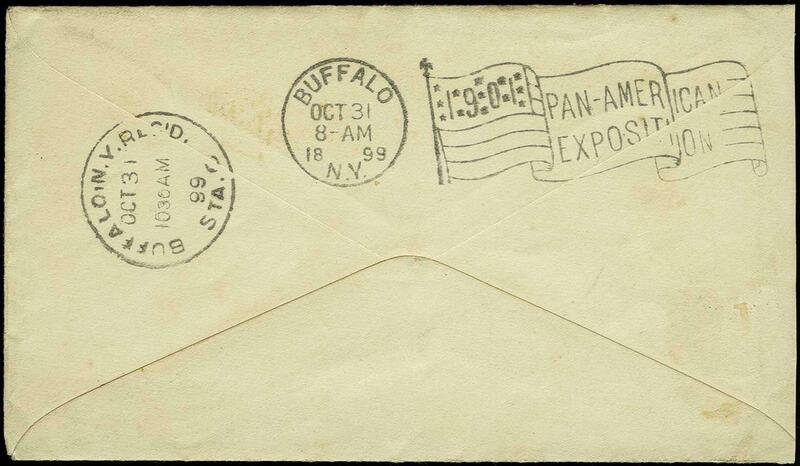 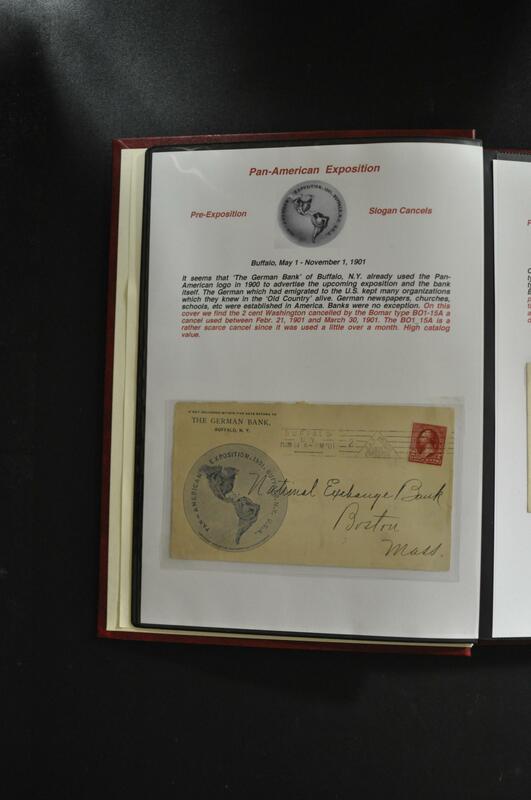 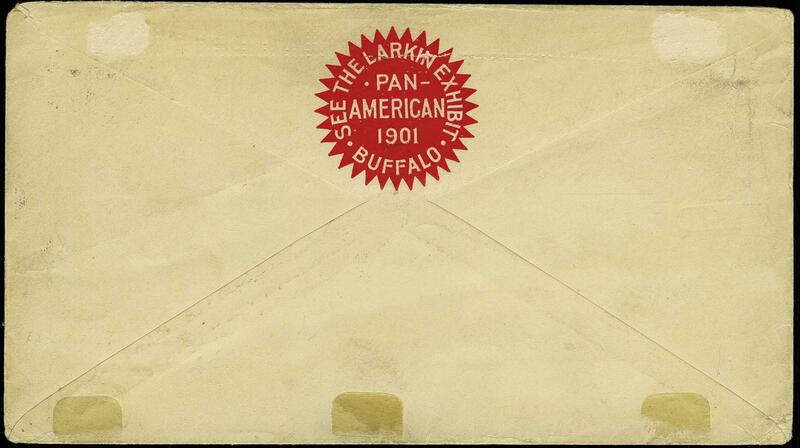 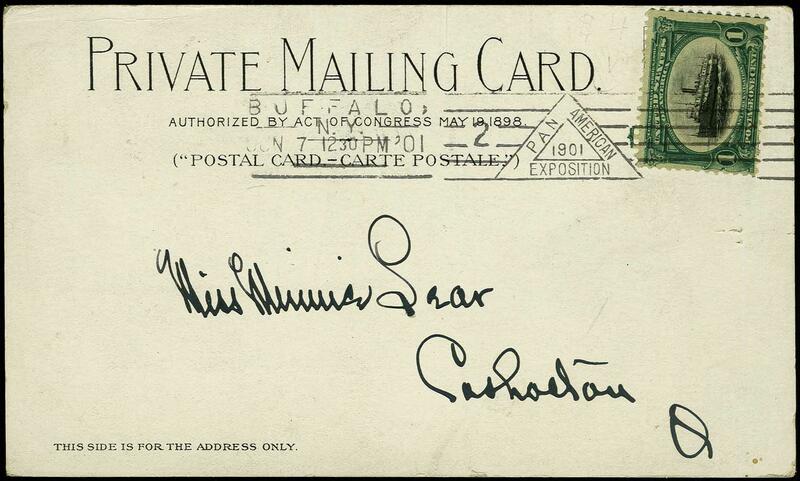 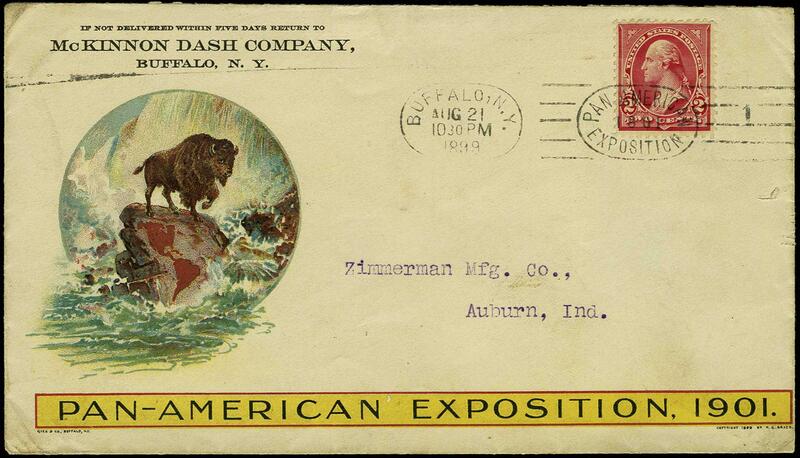 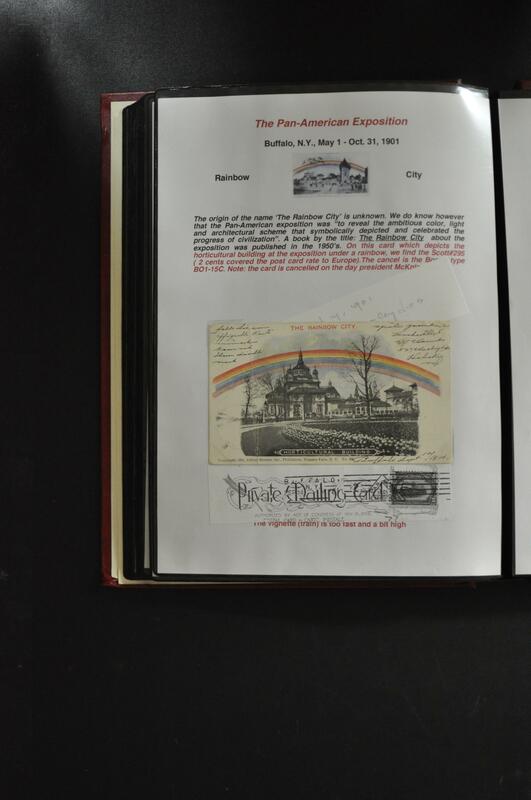 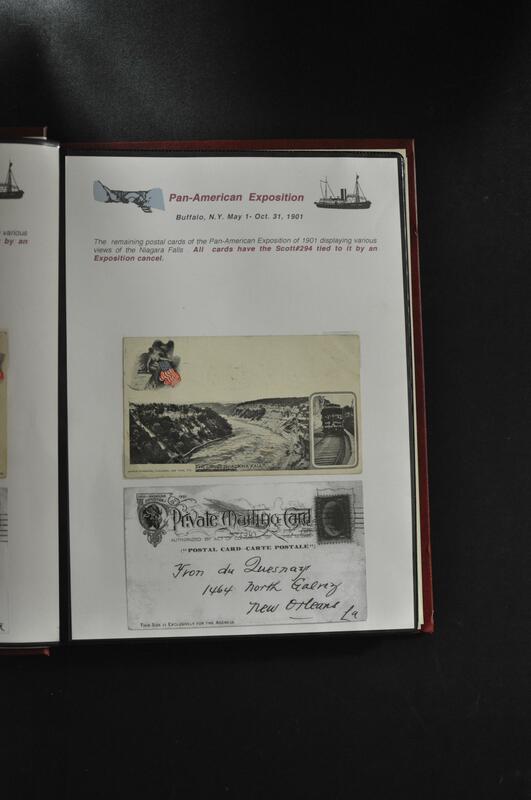 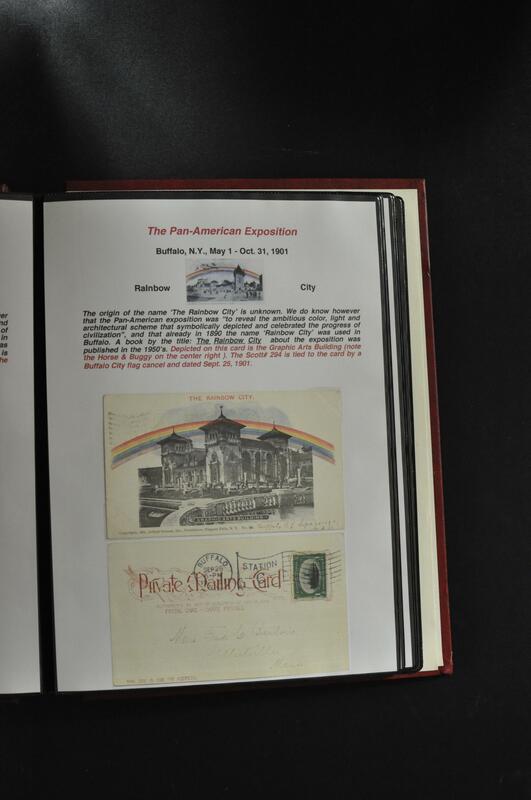 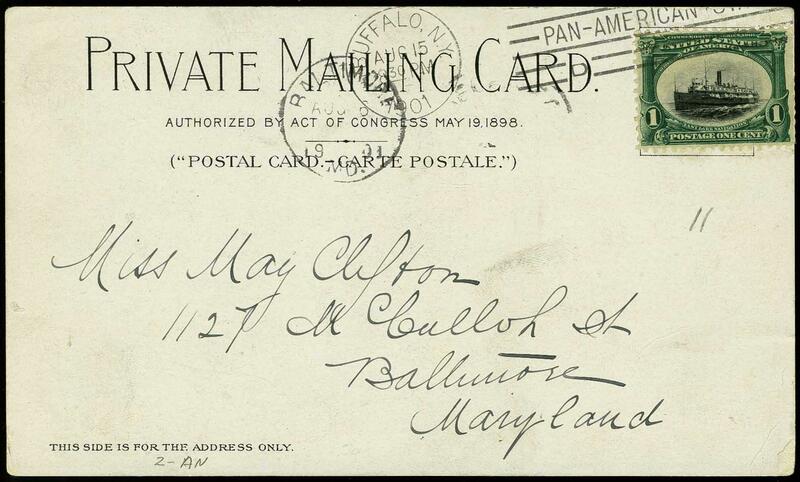 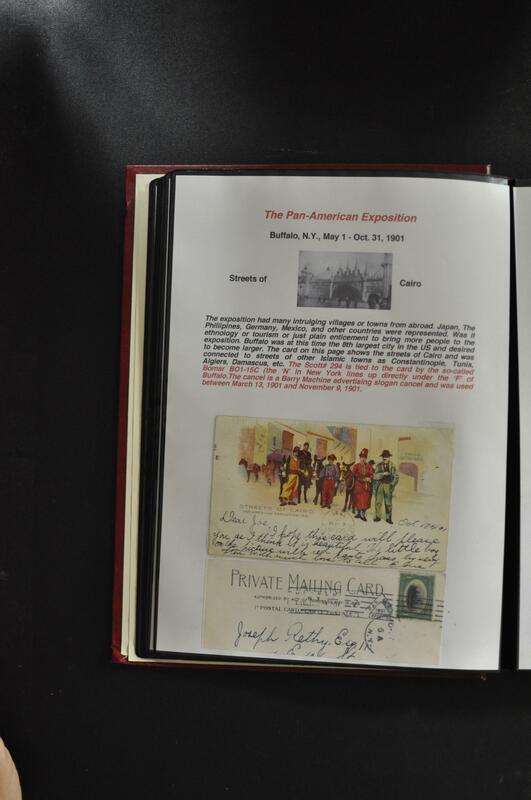 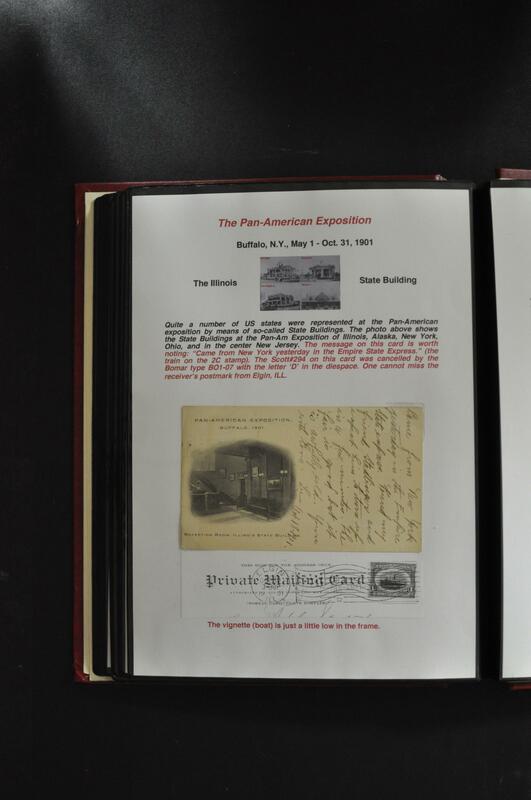 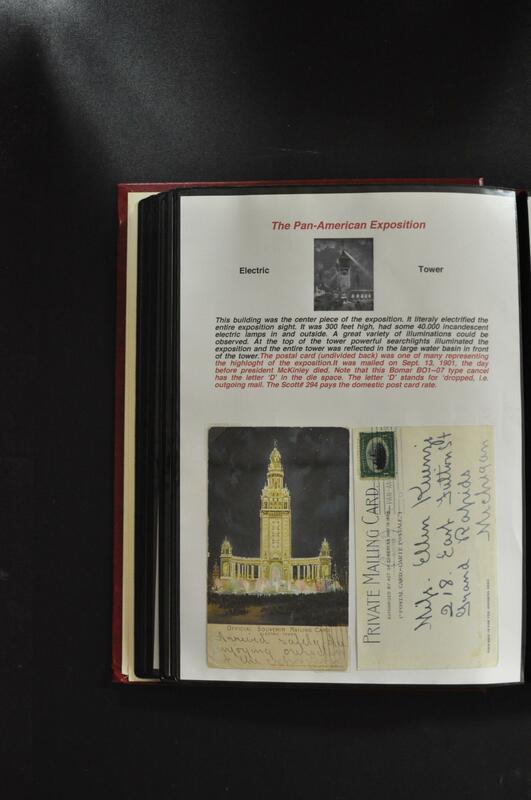 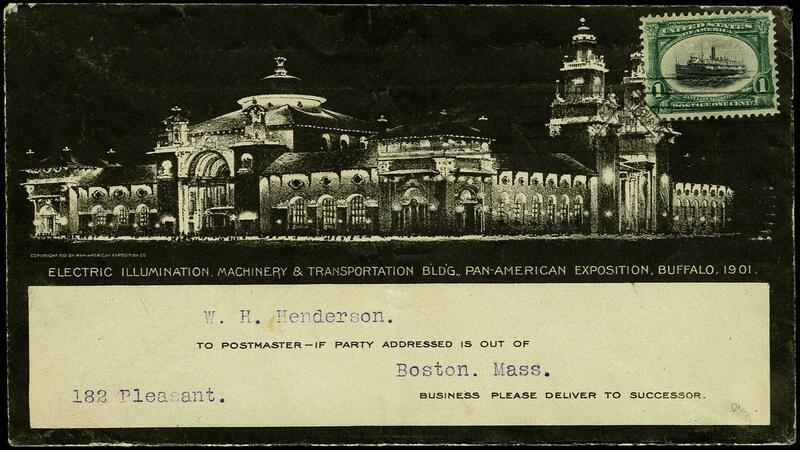 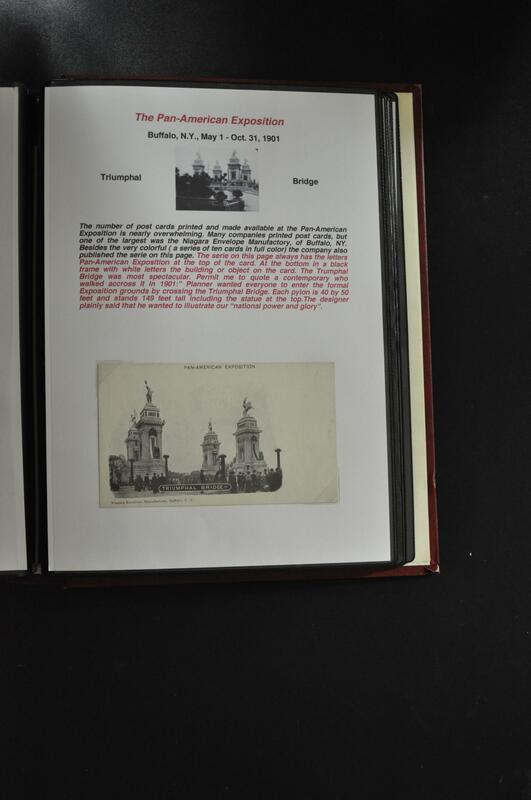 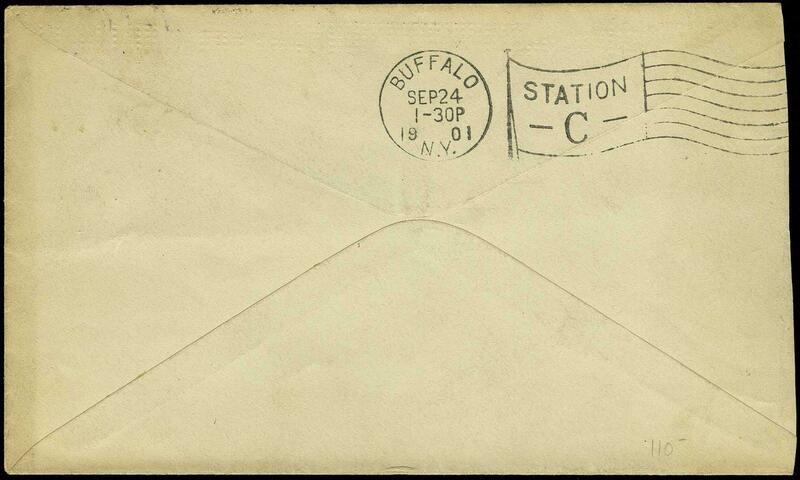 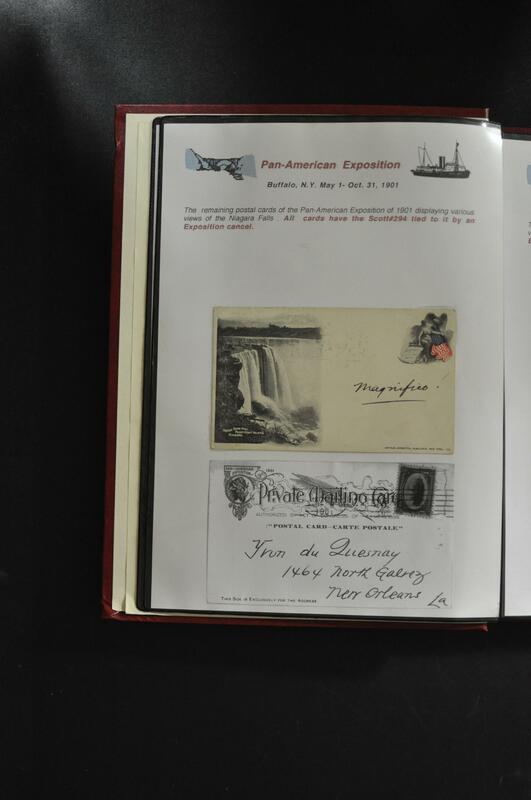 1901 1¢ Pan American "Buffalo N. Y. Jun '01 Pan American Exposition" Barry machine cancel without day of the month and die space blank (Bomar B01-15B) ties stamp to all over black envelope showing "Exposition at Night" addressed to Boston Mass. 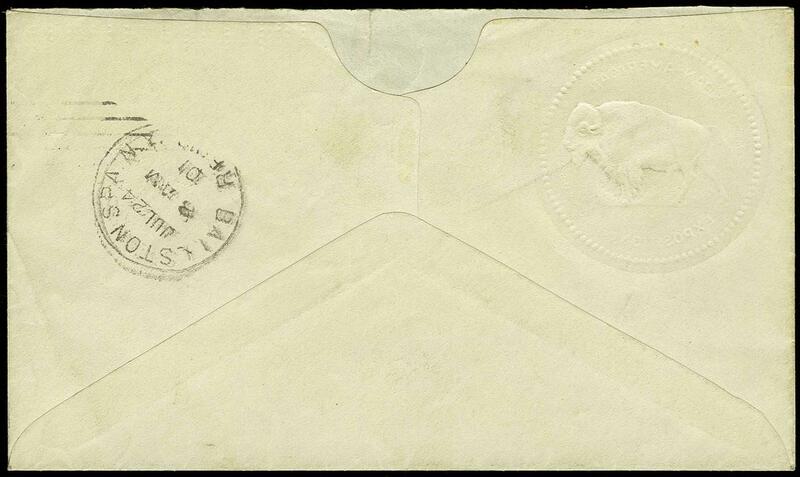 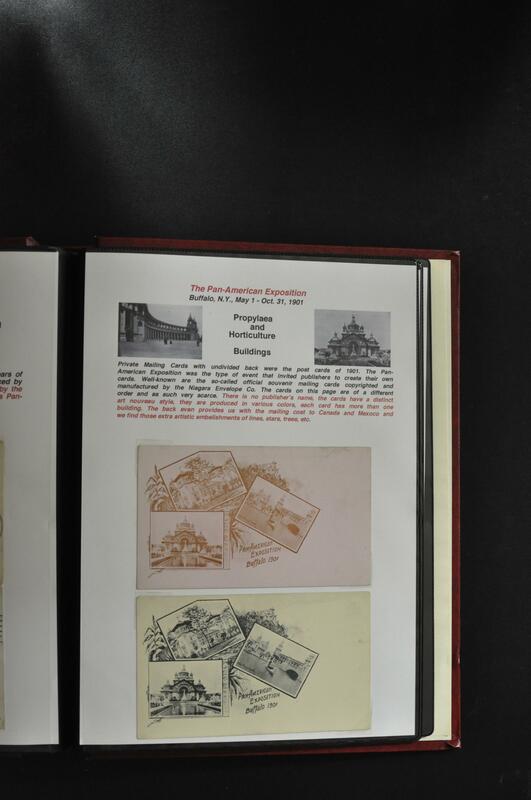 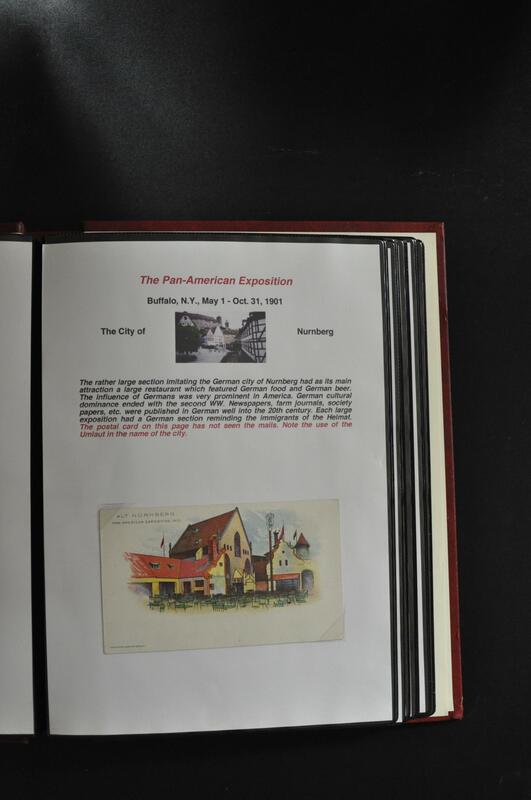 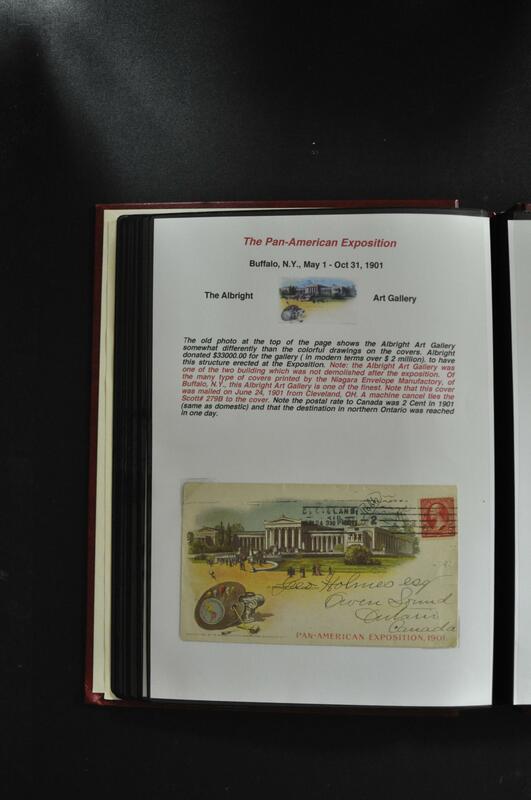 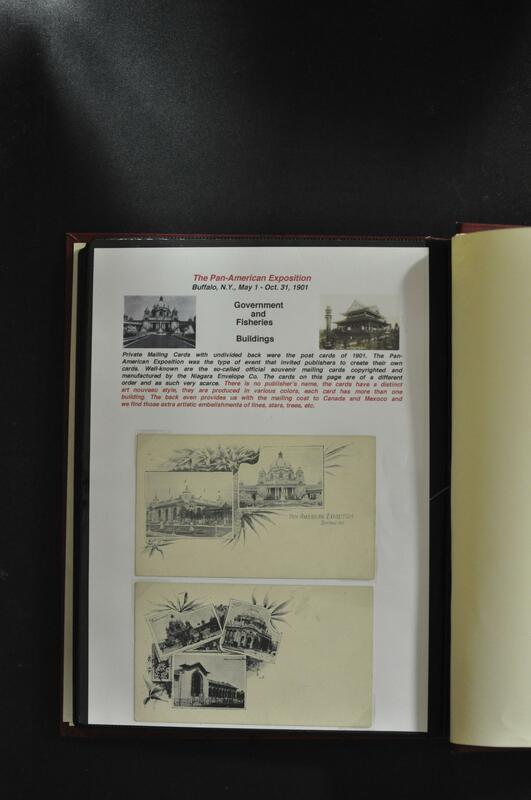 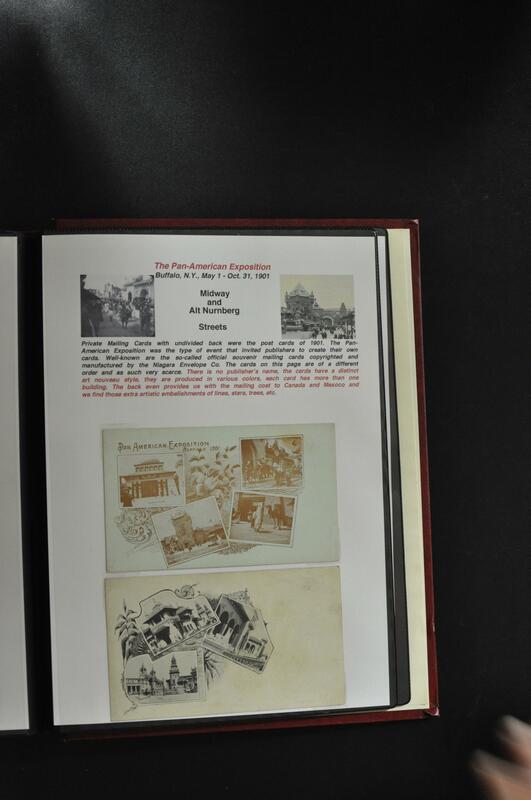 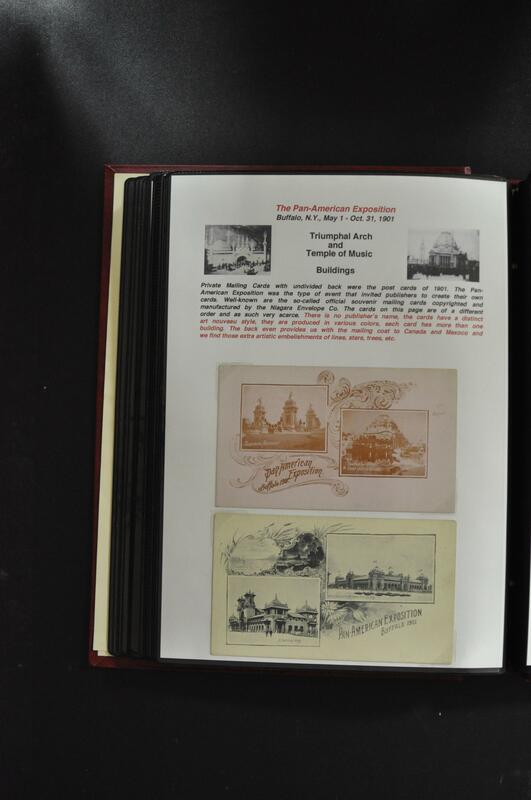 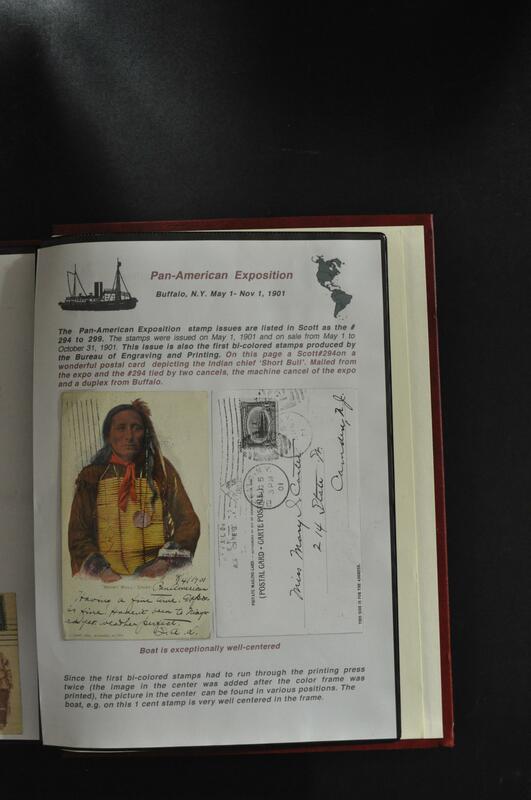 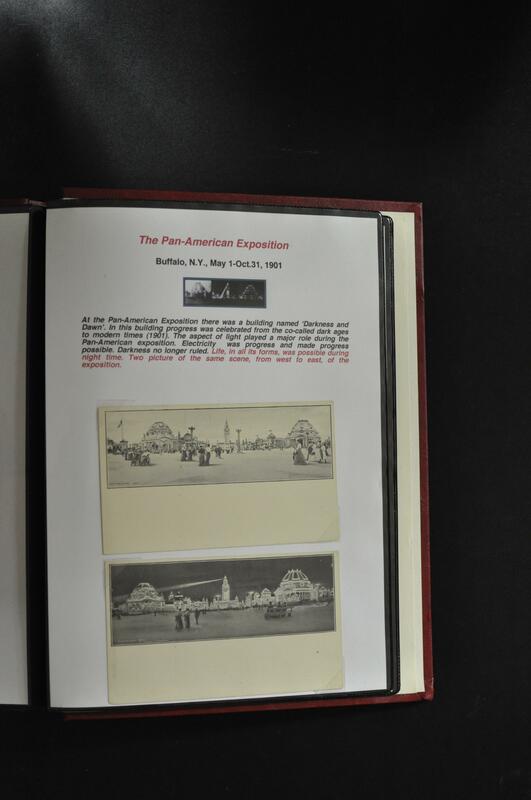 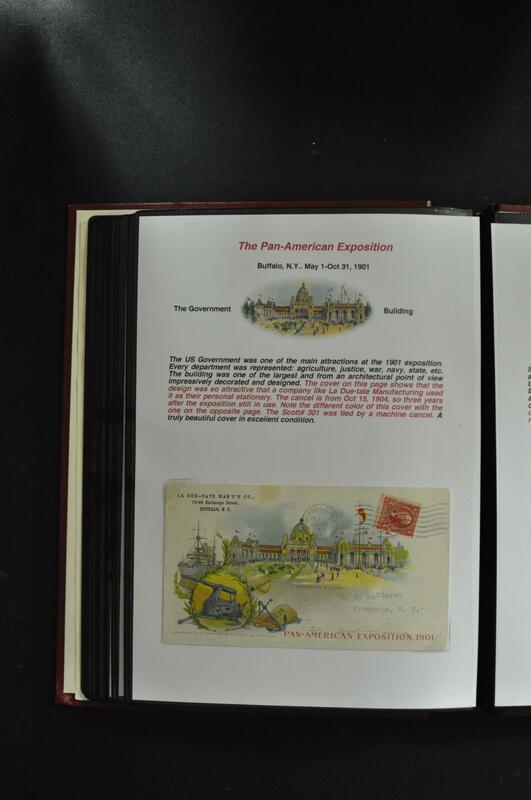 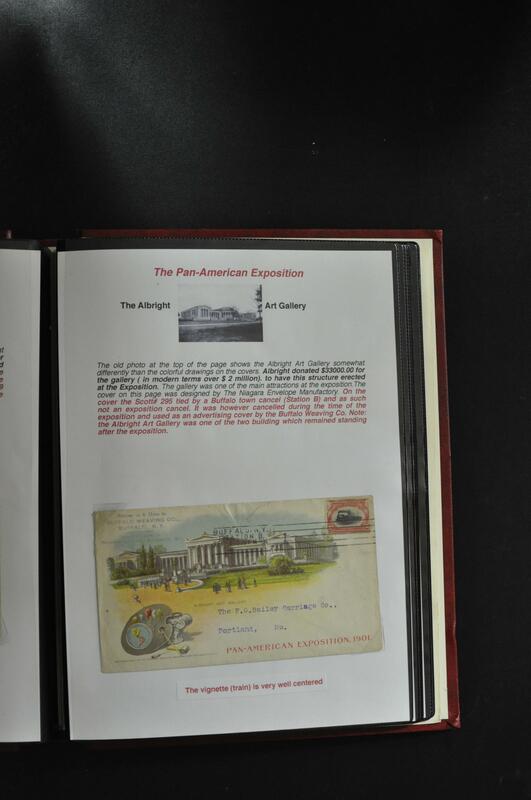 Cover with file fold at center away from the stamp otherwise Very Fine.